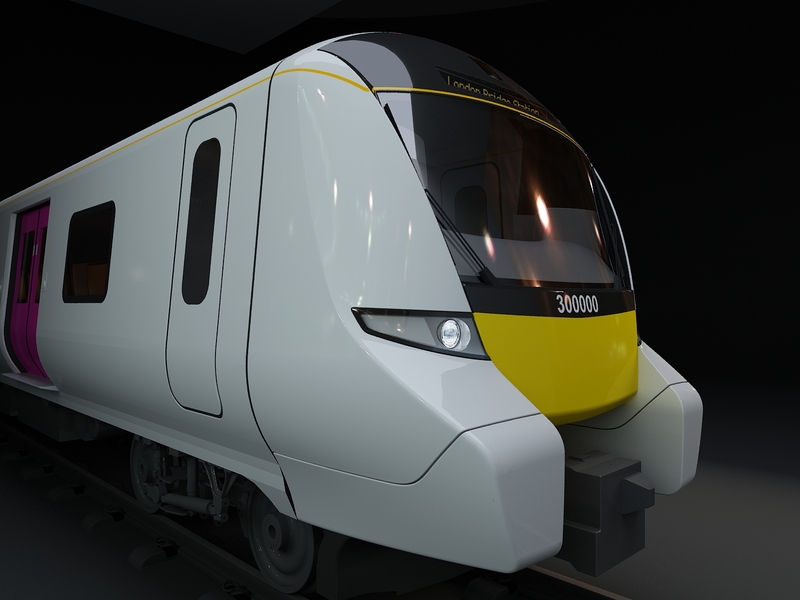 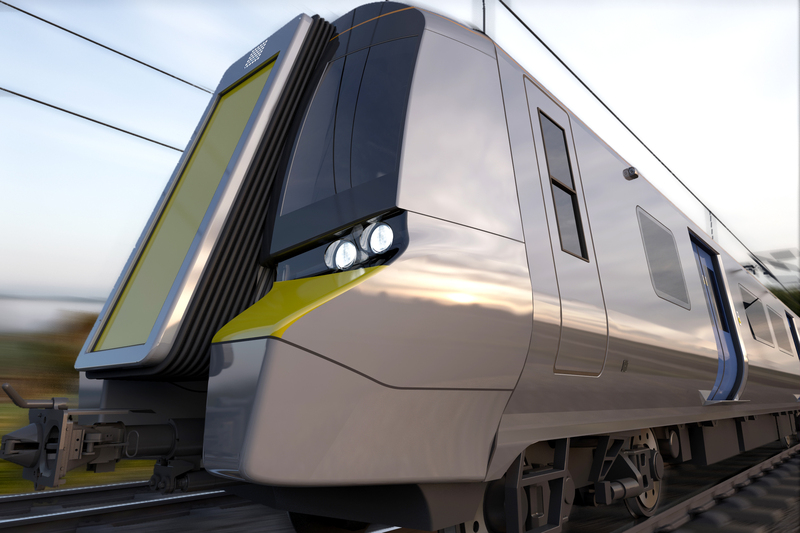 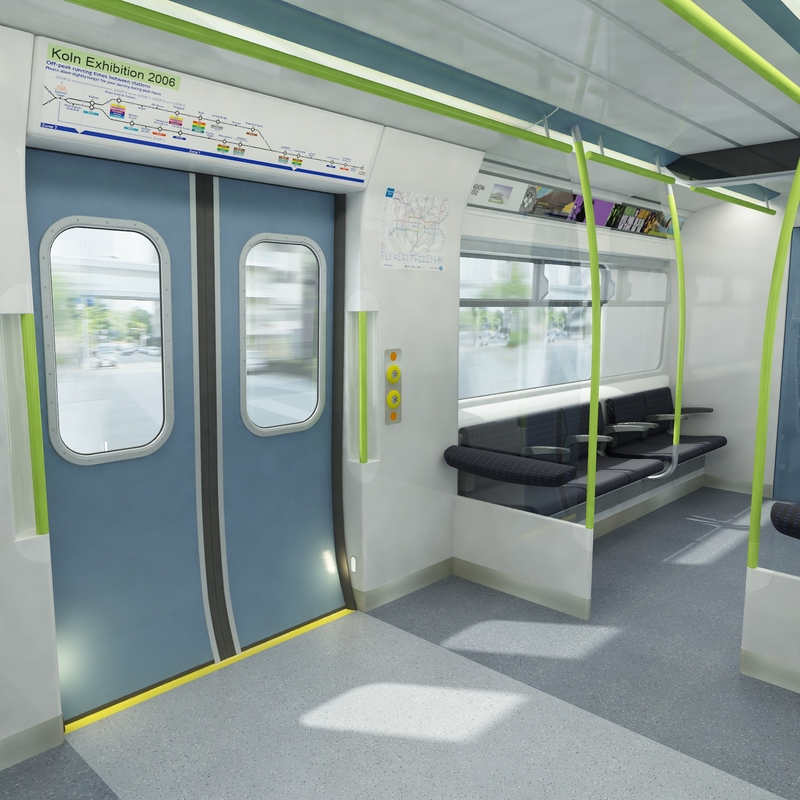 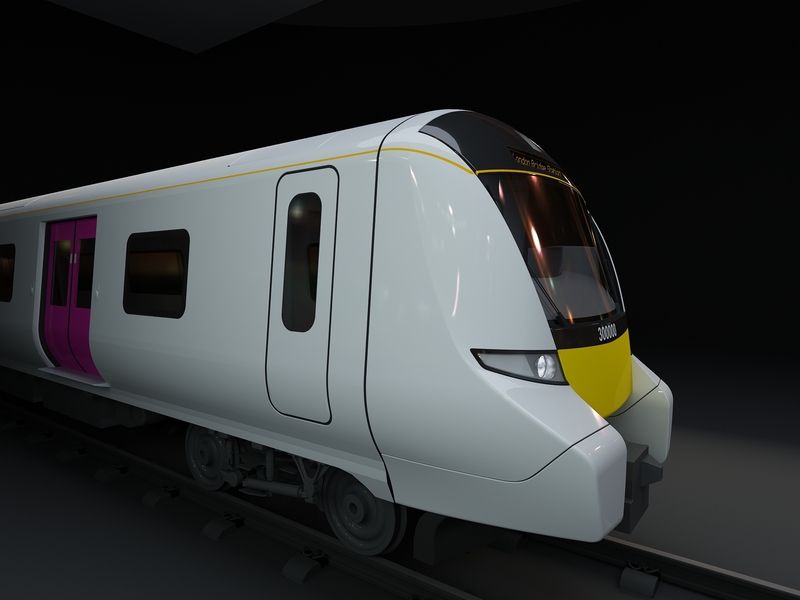 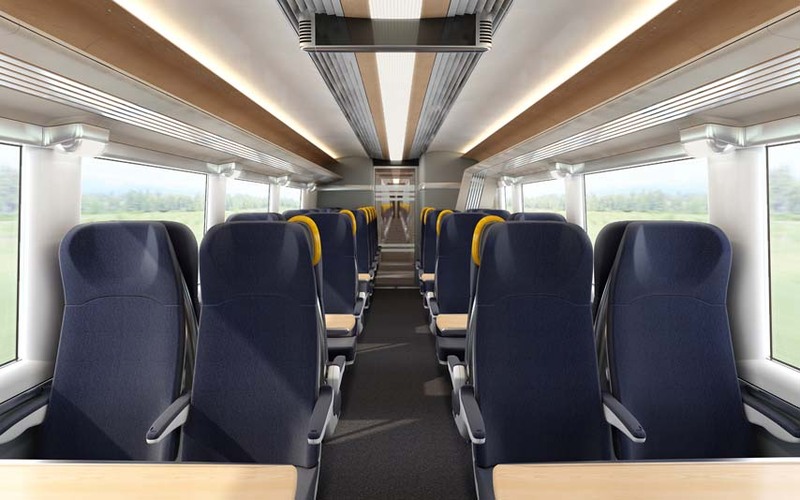 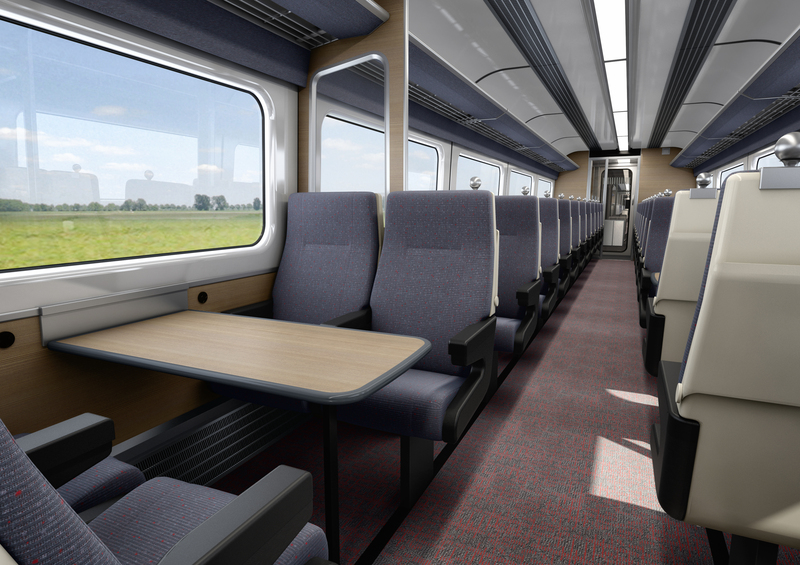 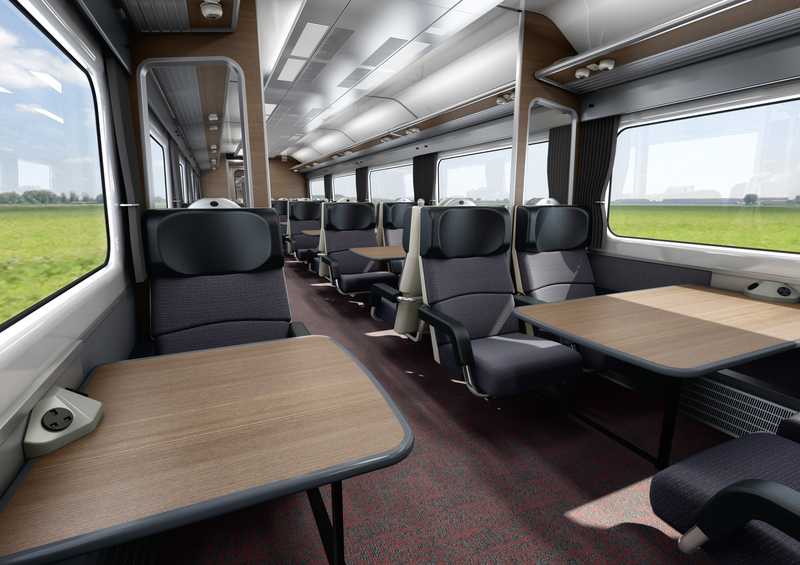 As part of the on going design work for the East Anglia franchise, Schoenemann Design was commissioned to create a 3D virtual reality package for customers. 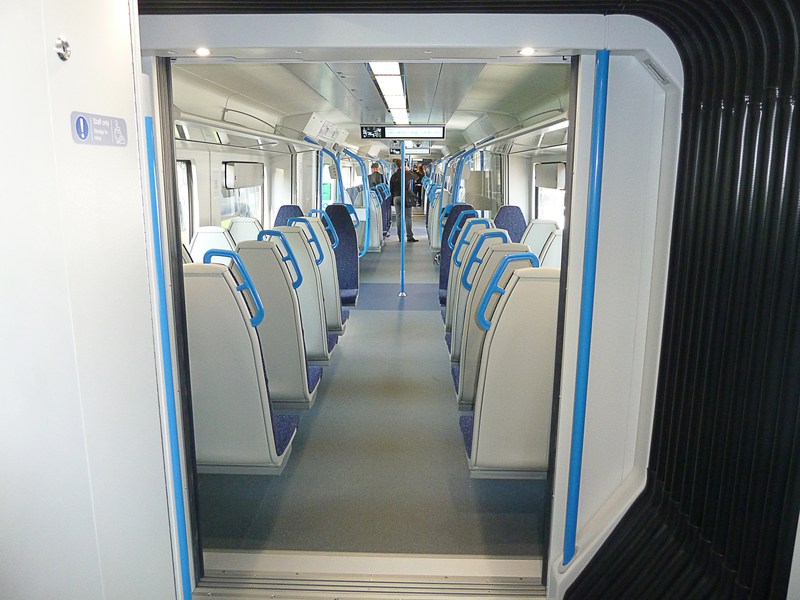 Appearing at various stations on the East Anglia network, customers had an opportunity to experience the new trains coming to the franchise. 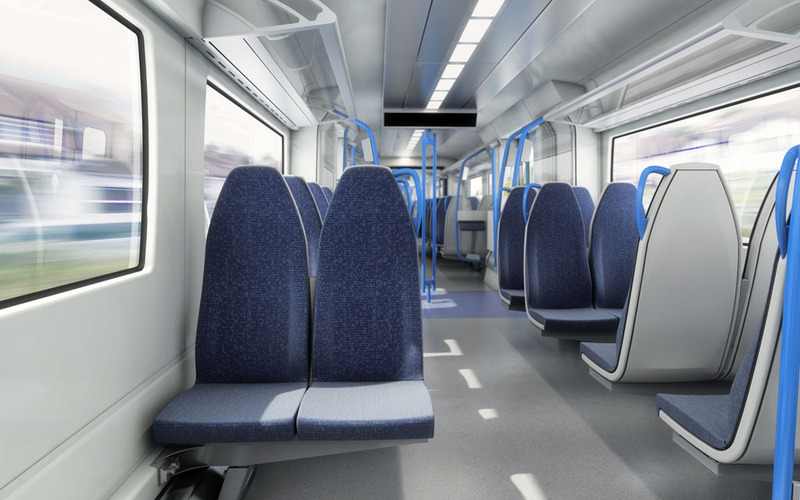 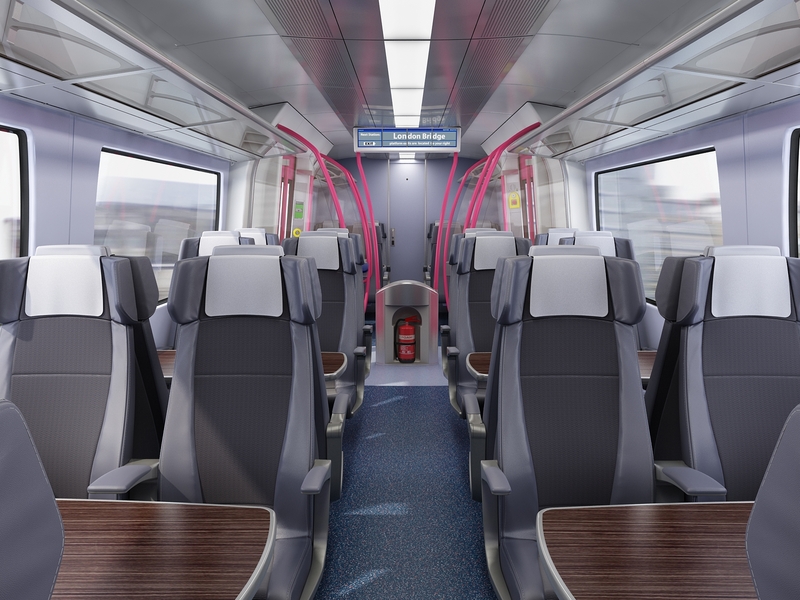 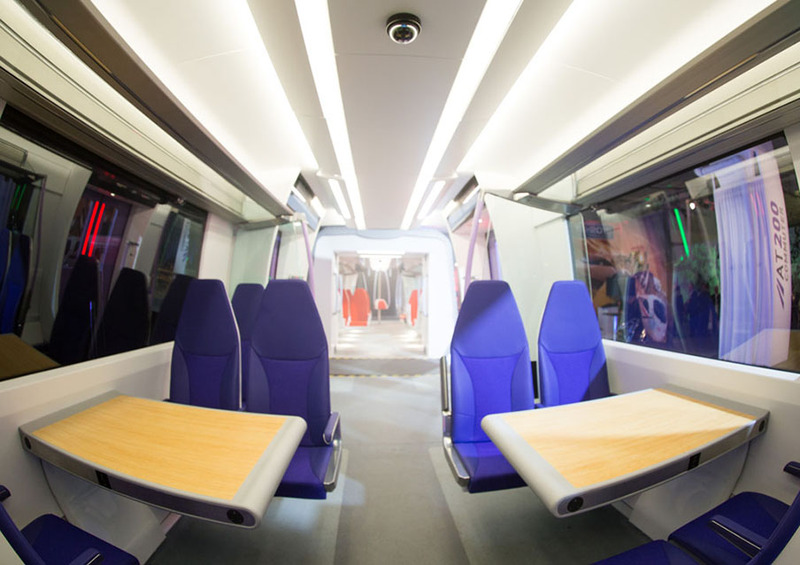 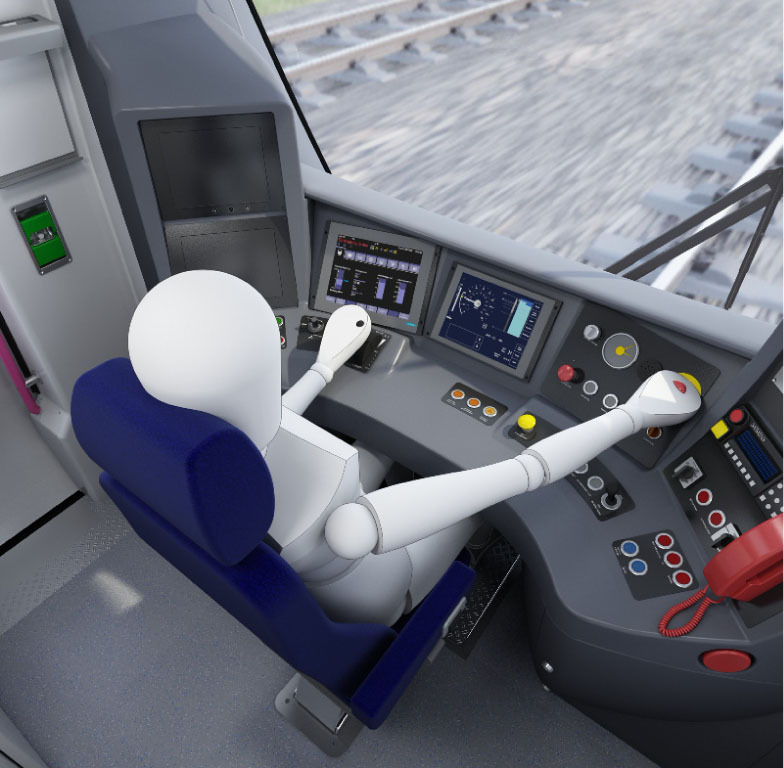 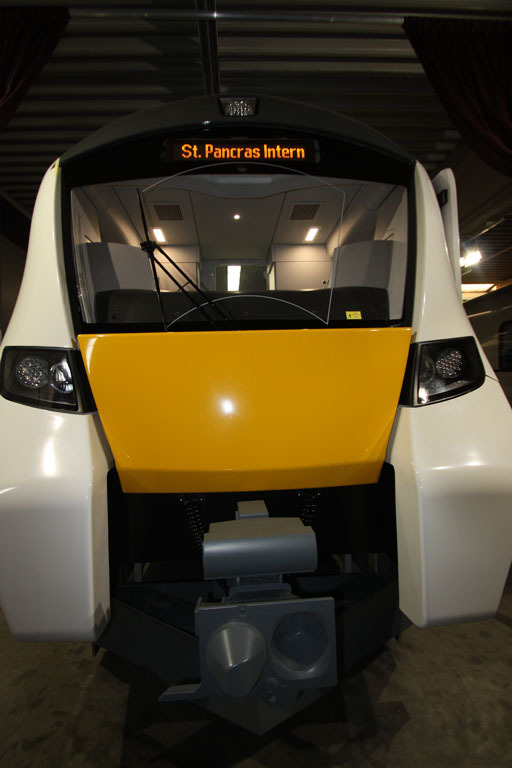 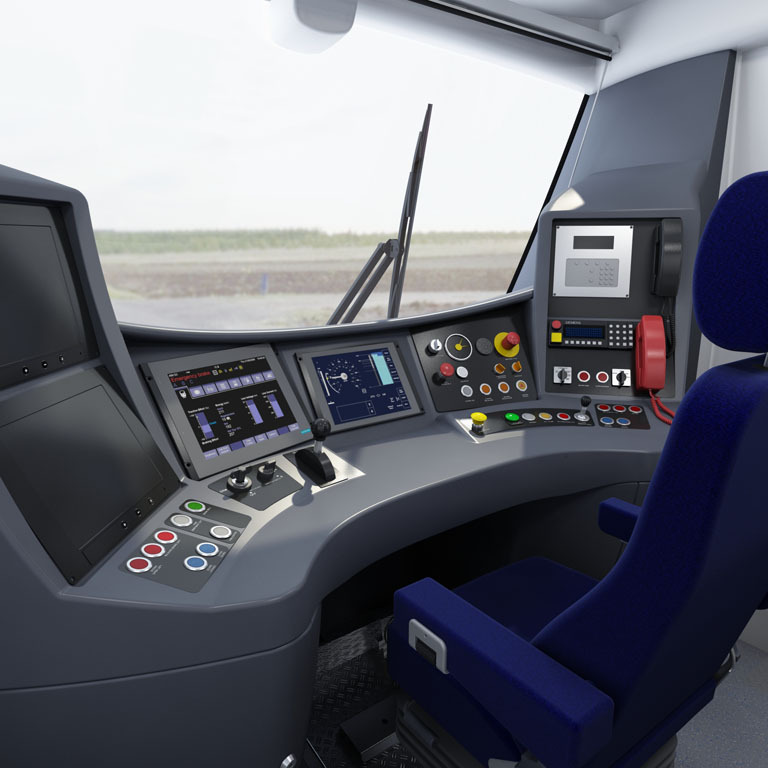 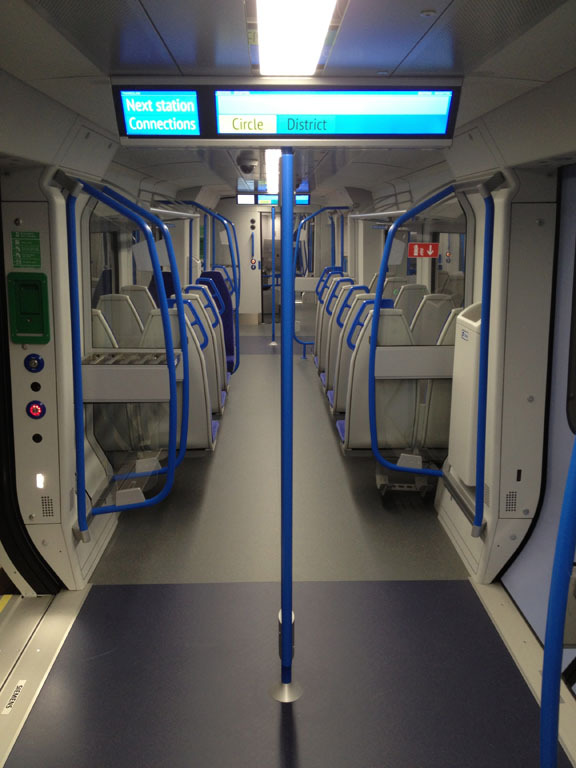 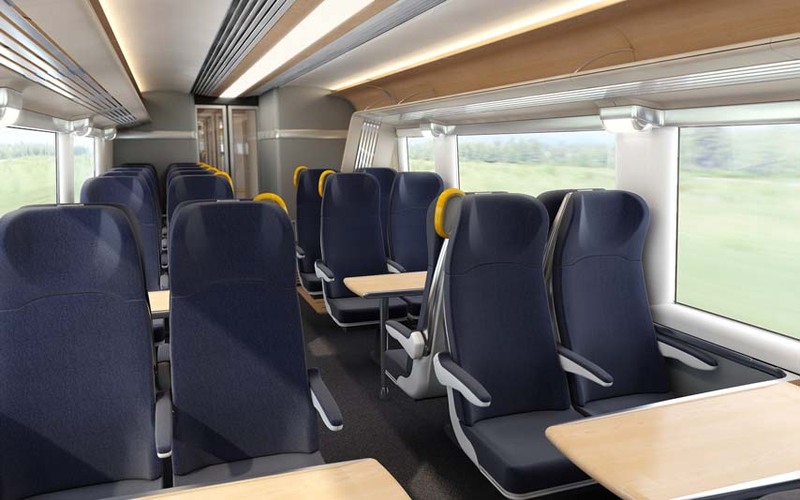 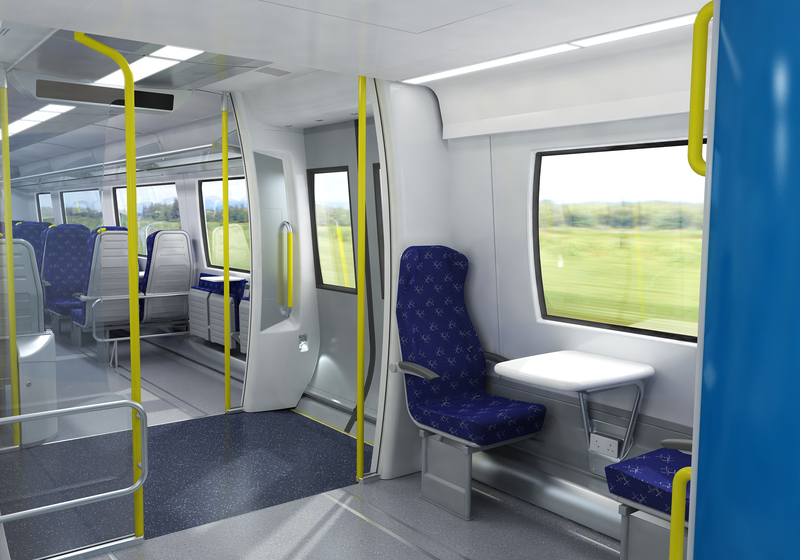 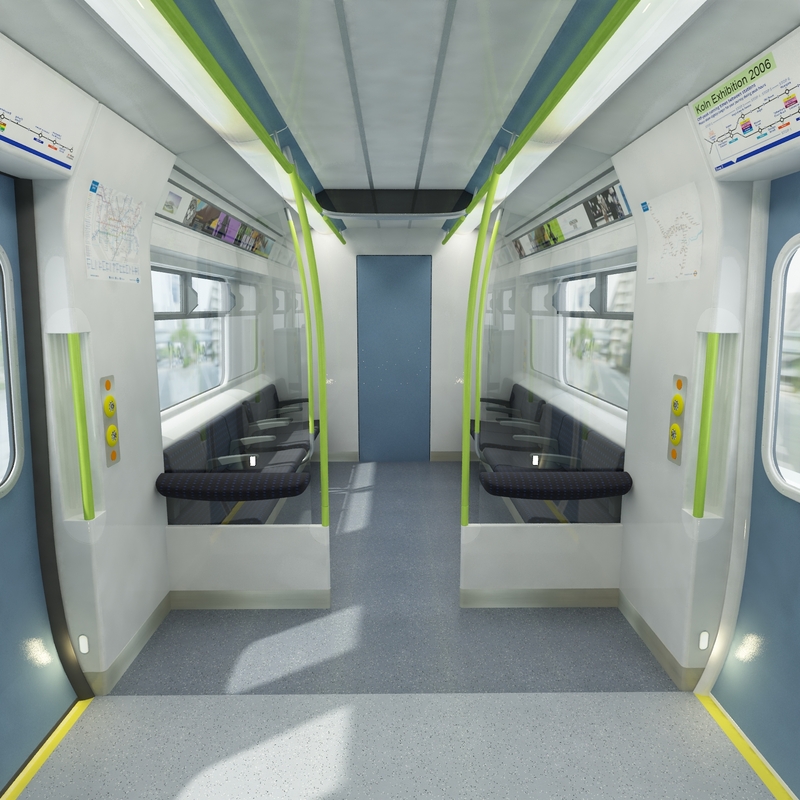 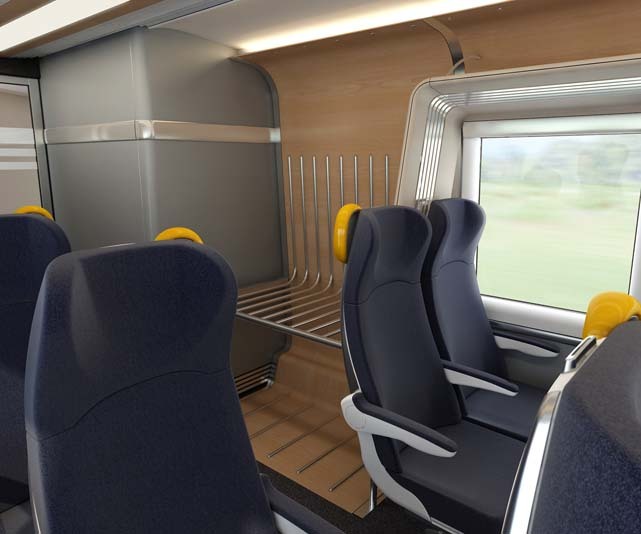 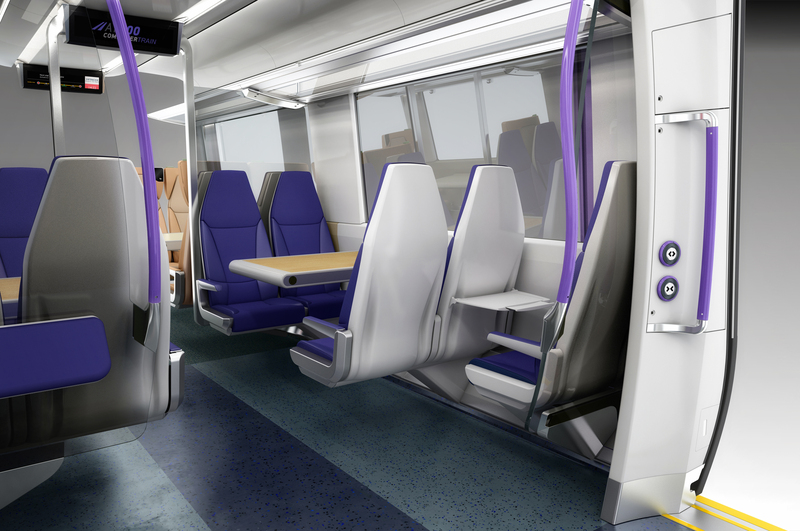 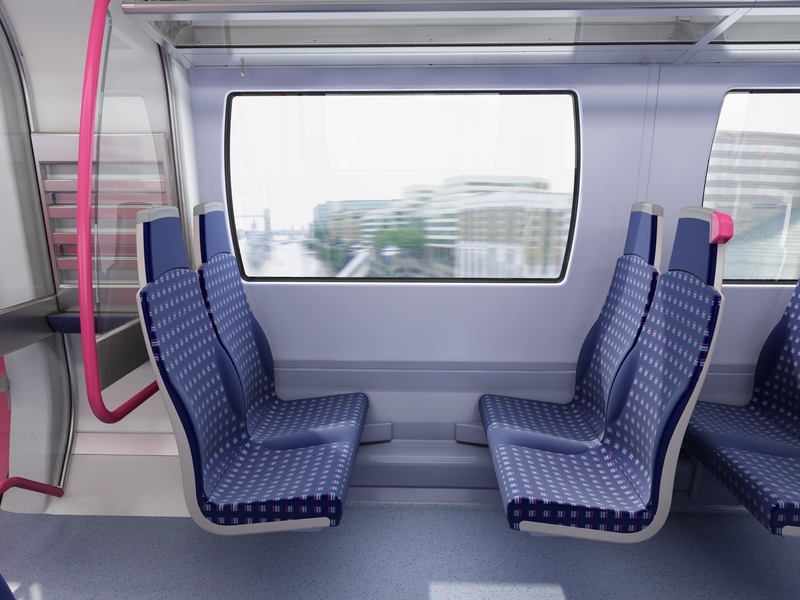 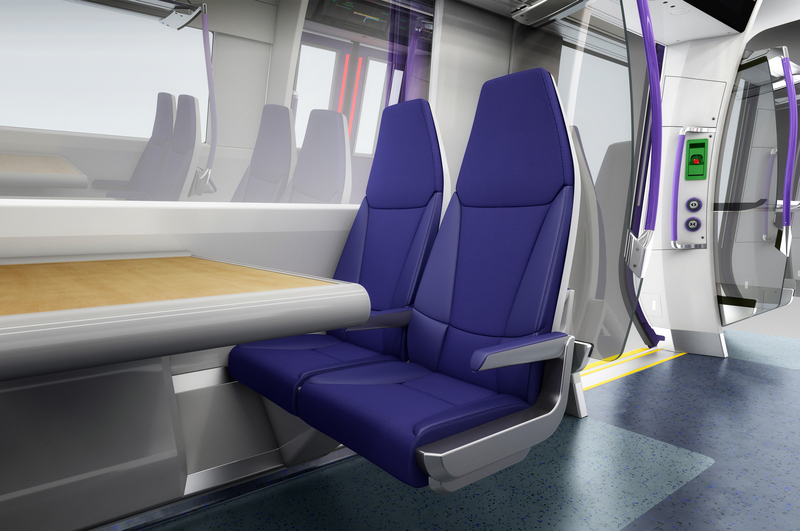 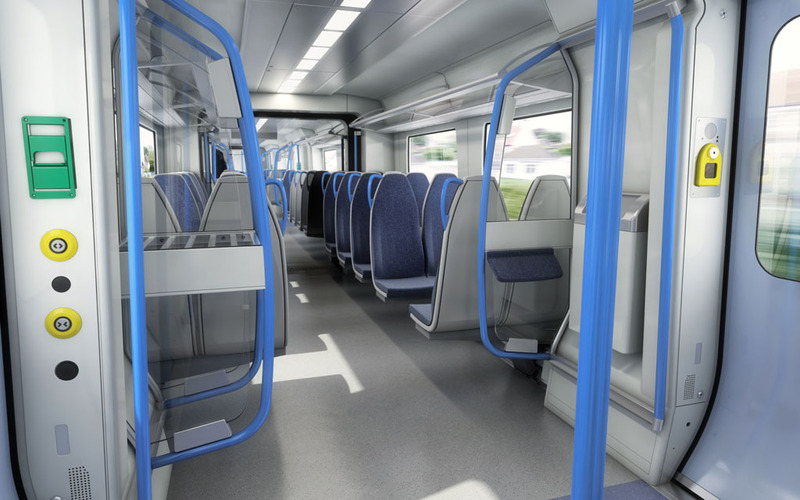 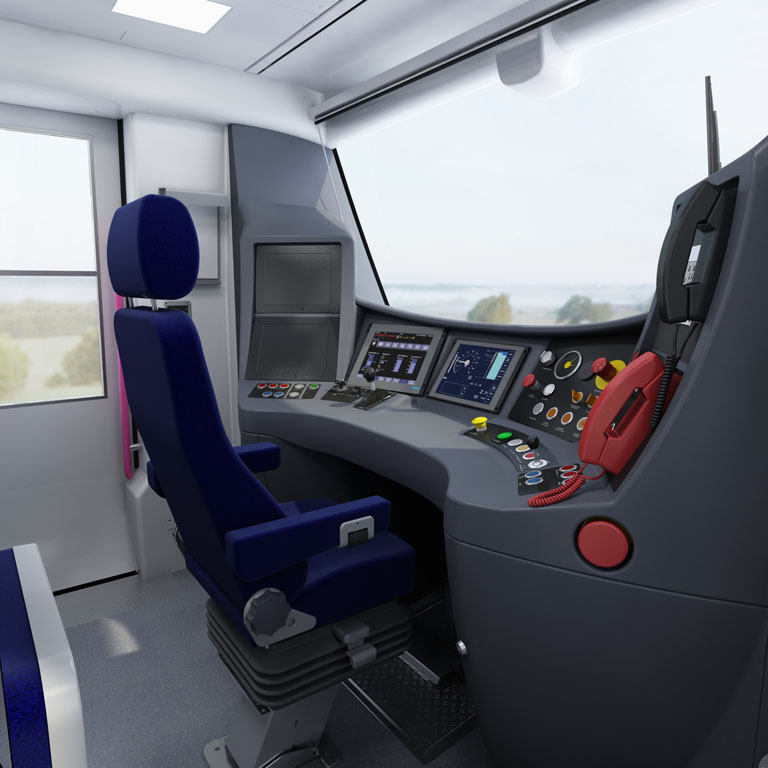 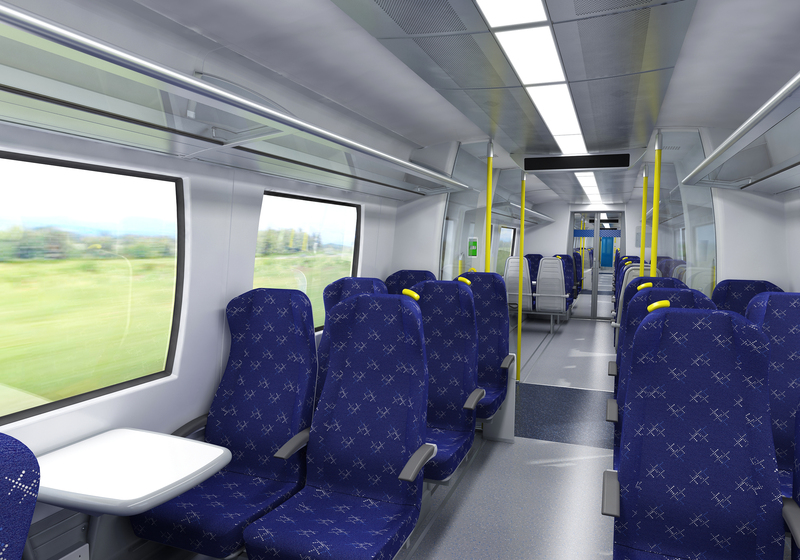 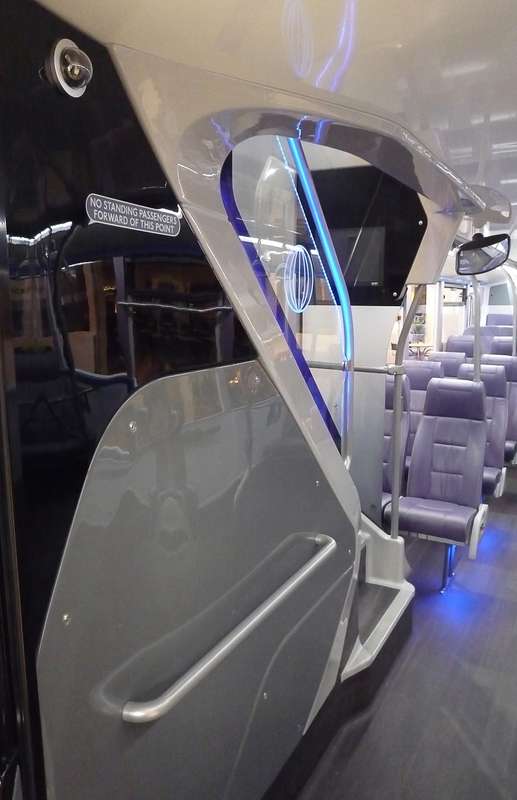 Complete with the production seats which will feature in the trains customers could move through various view around the two fleet interiors. 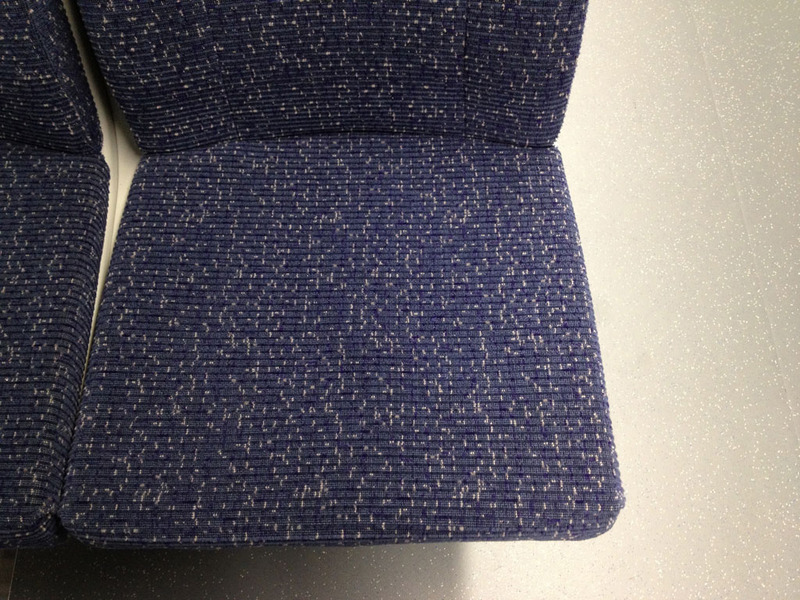 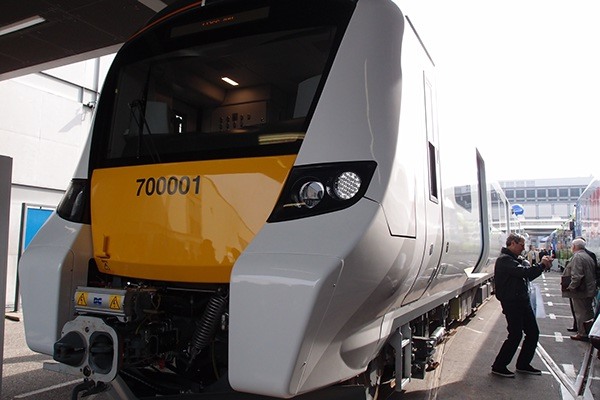 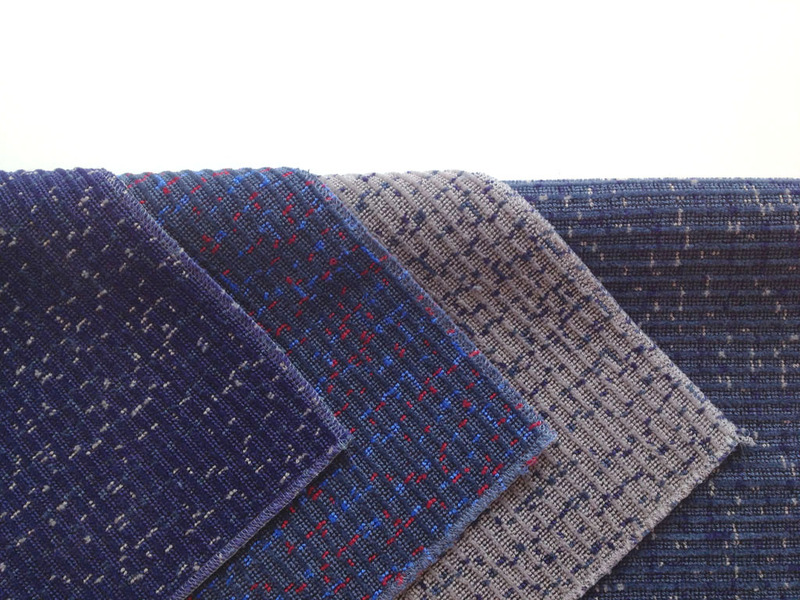 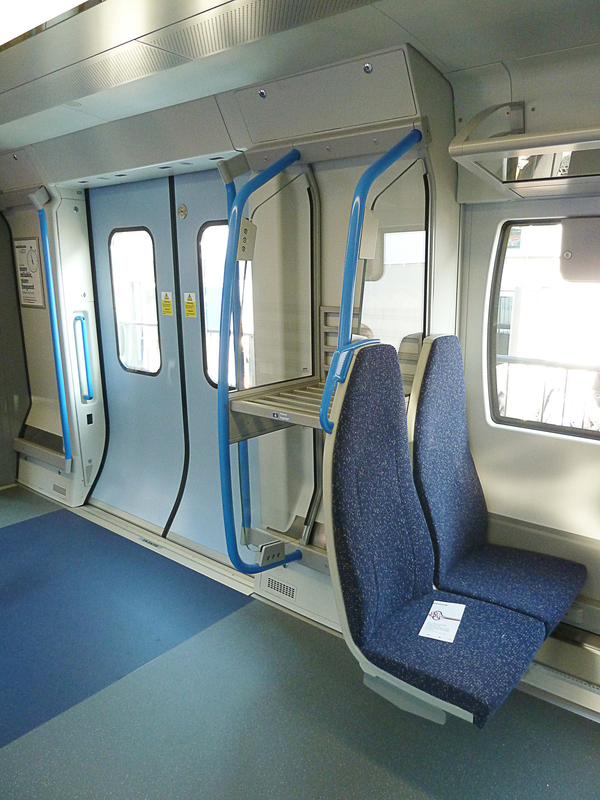 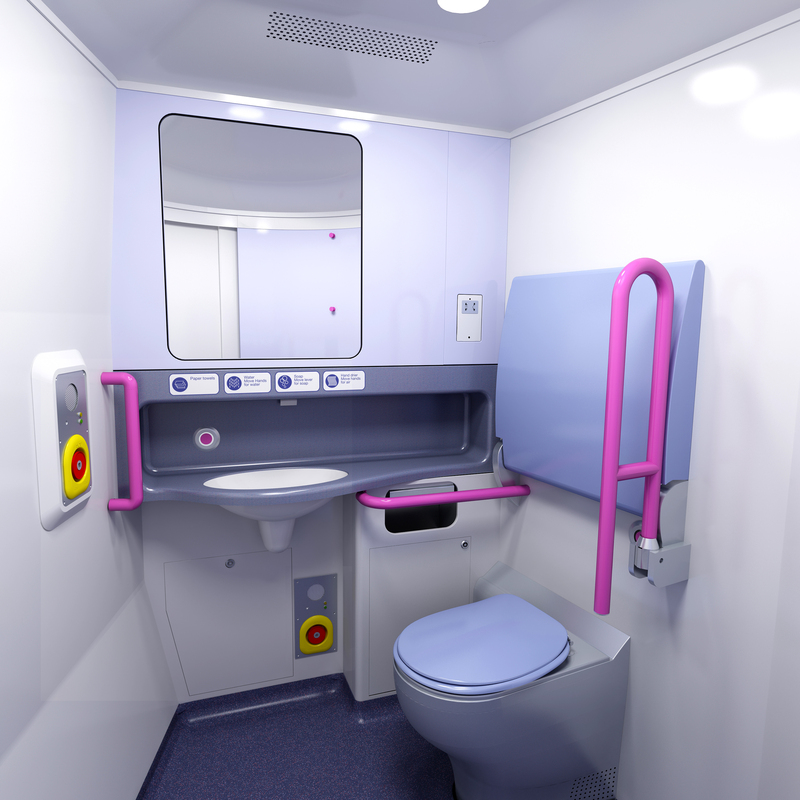 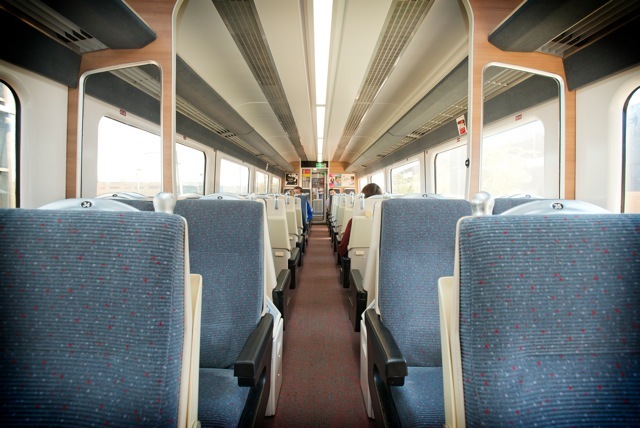 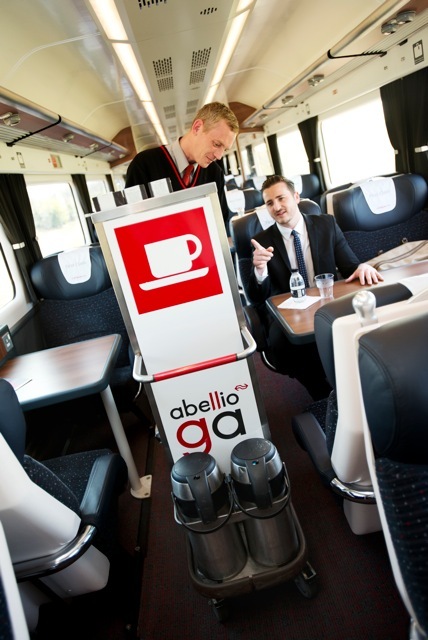 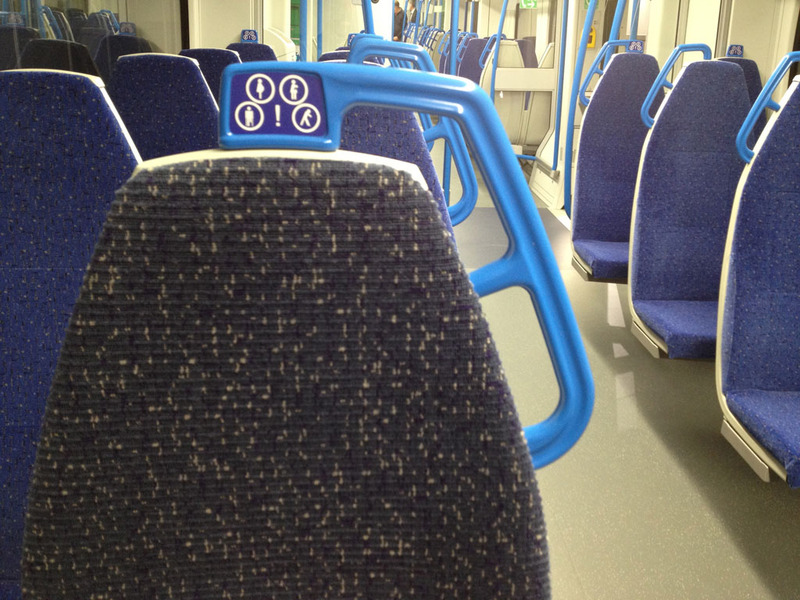 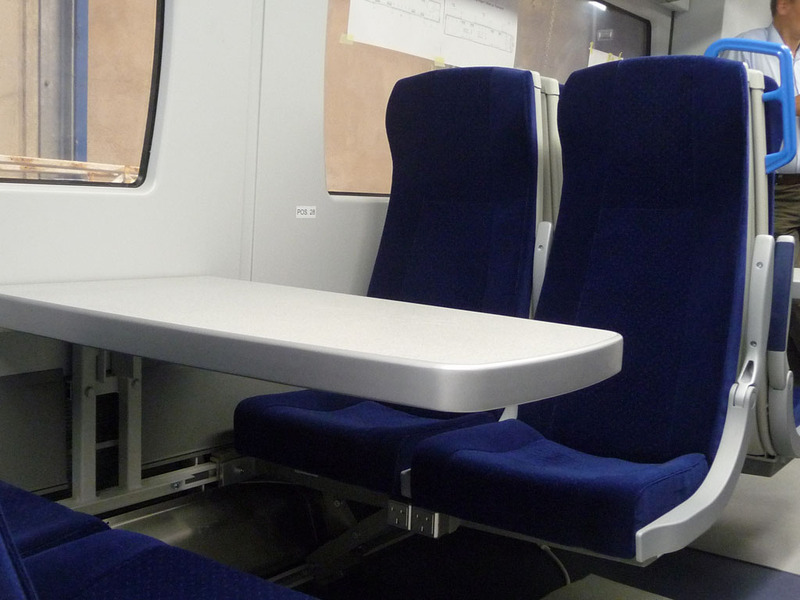 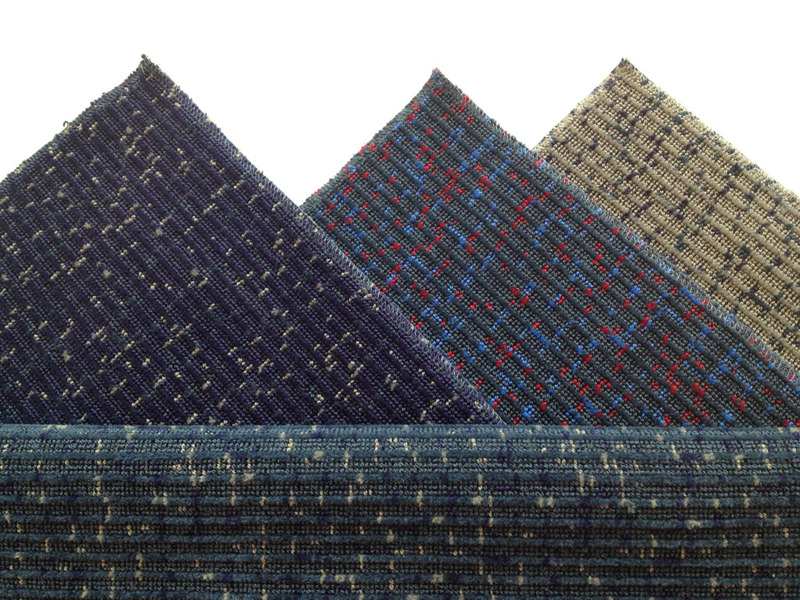 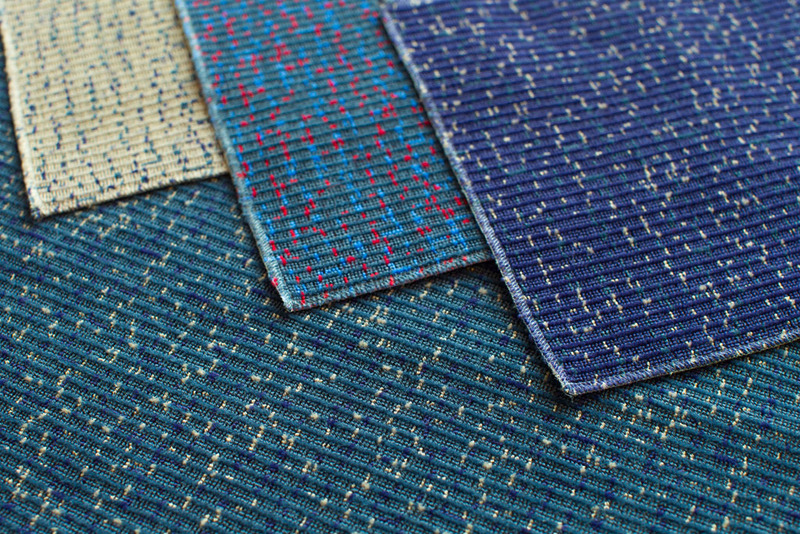 Schoenemann Designs were commissioned by Abellio Greater Anglia oversee a range of design challenges, including PRM/TSI compliance, the creation of interior colour palettes in line with Abellio corporate identify. 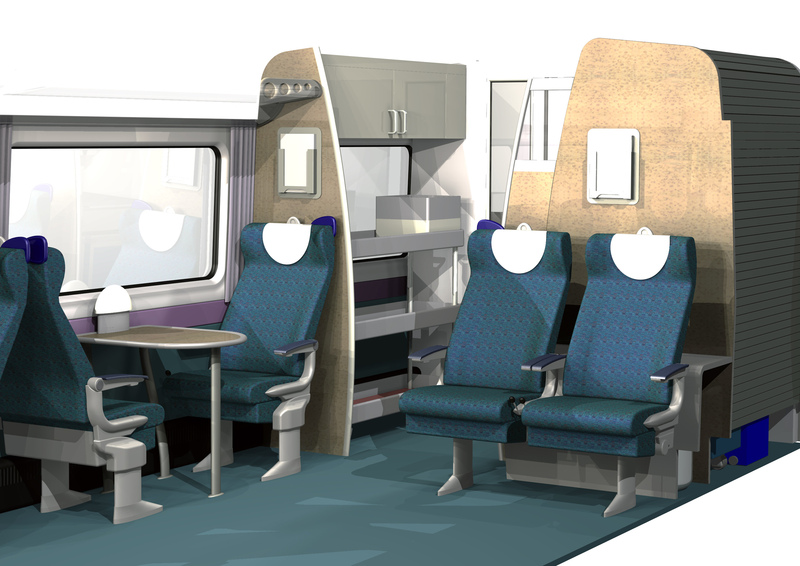 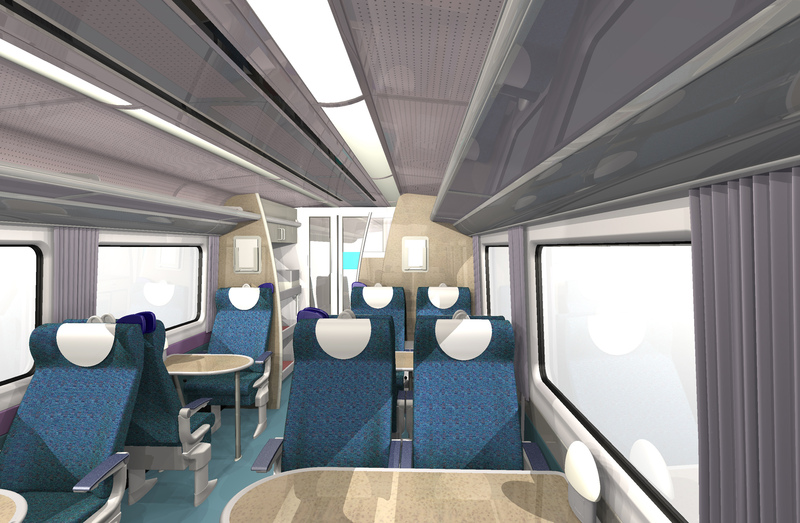 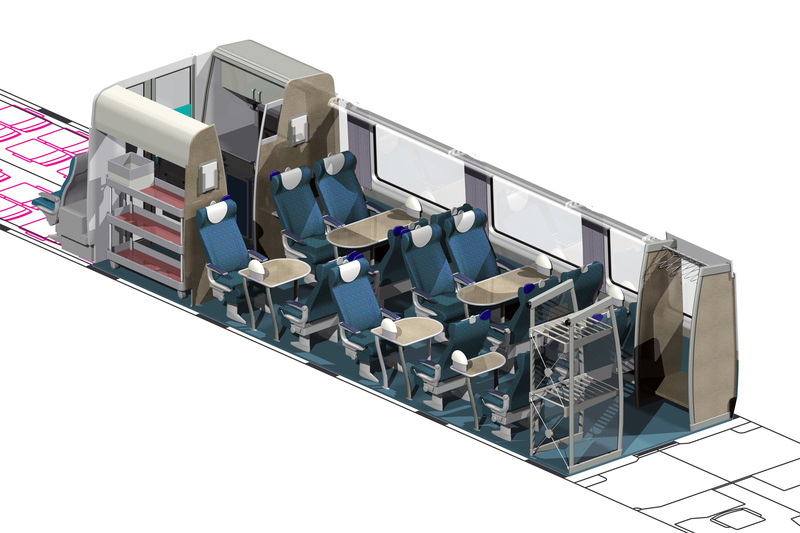 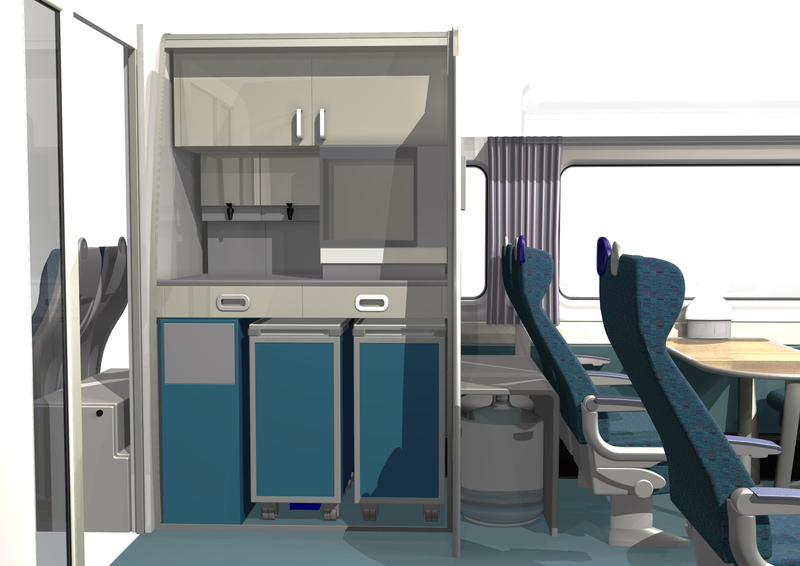 Our design brief included working with both Bombariders engineers and designers as well as managing suppliers in particular Schoenemann Design undertook seating comfort development, human factors, interior materials and furnishing to create a style synonymous with contemporary passenger expectations appropriate for regional rail travel. 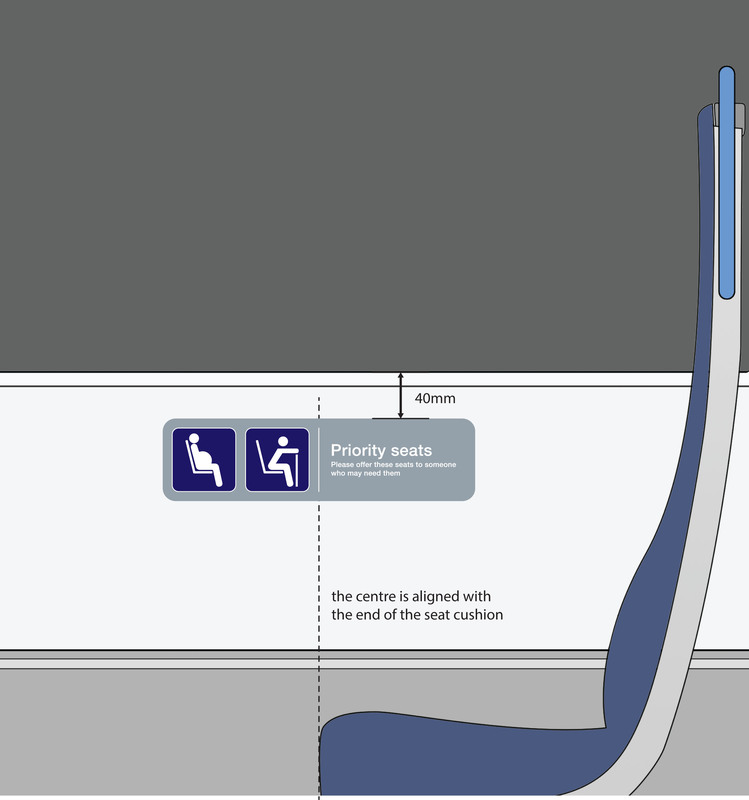 Our design brief included working with both Stadlers engineers and designers as well as managing suppliers in particular Schoenemann Design undertook seating comfort development, human factors, interior materials and furnishing to create a style synonymous with contemporary passenger expectations appropriate for intercity rail travel from London terminus stations to Norwich. 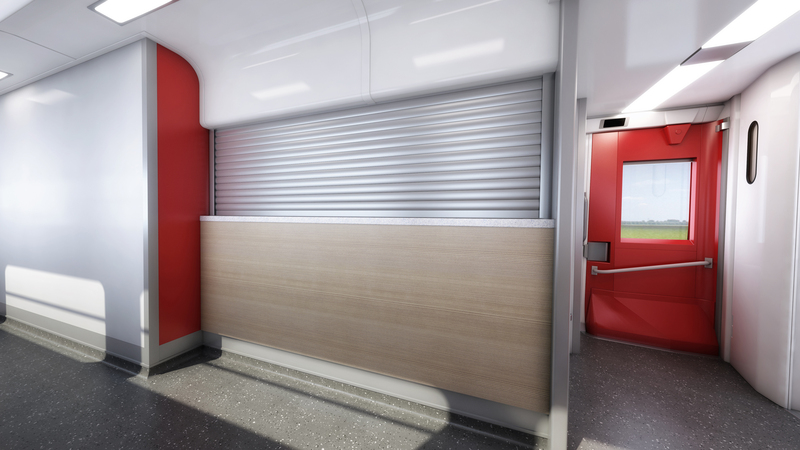 Having undertaken brand development with Abellio Greater Anglia on their successful bid for the East Anglia Franchise, we had established a colour palette and livery design for the Stadler Flirt vehicles. 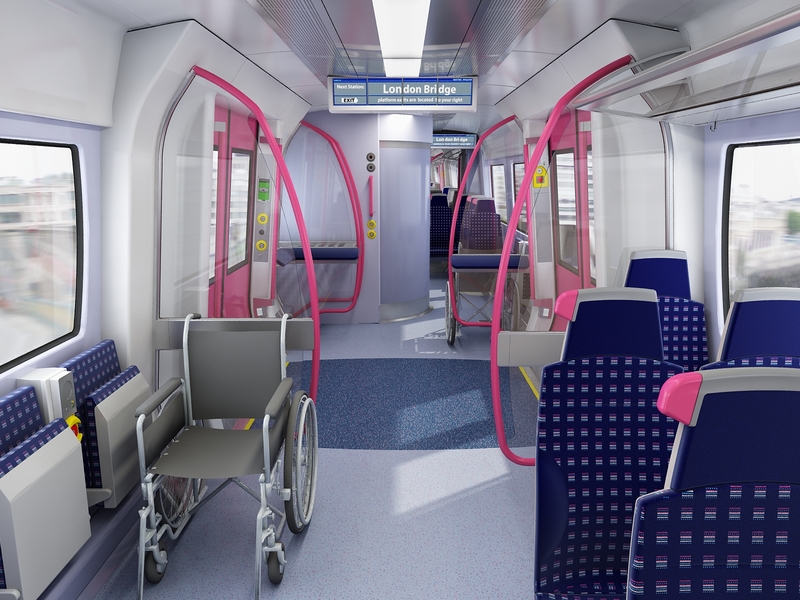 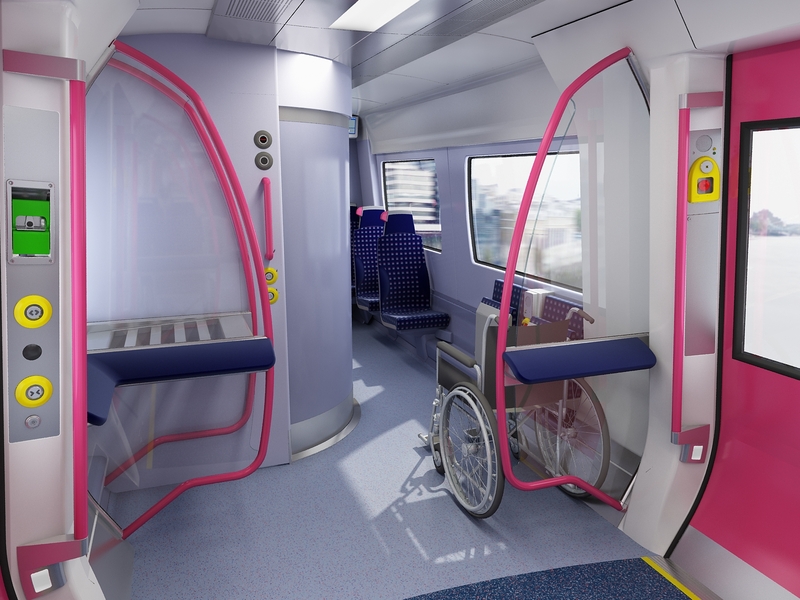 With a finished exterior design from Stadler, Schoenemann Design developed the previous established livery design, taking into consideration colour contrasts for the passenger doors and visible wheelchair and bike signs to meet PRM/TSI and safety requirements. 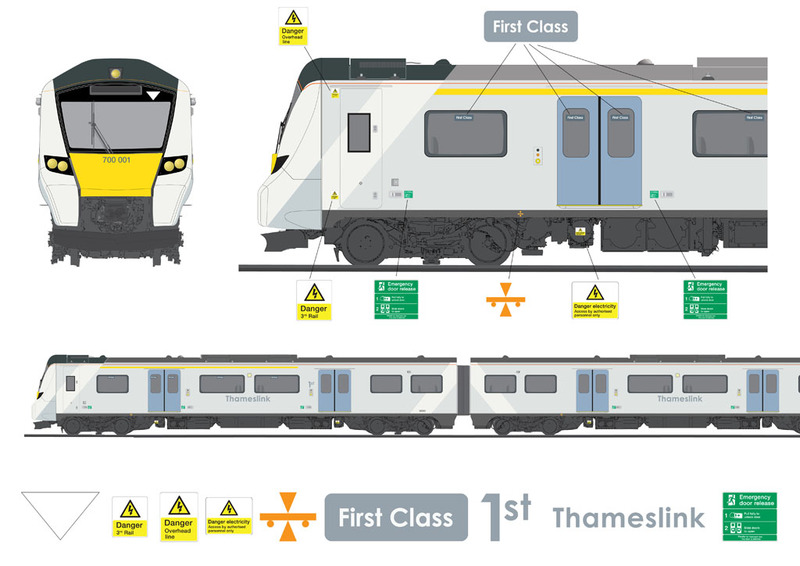 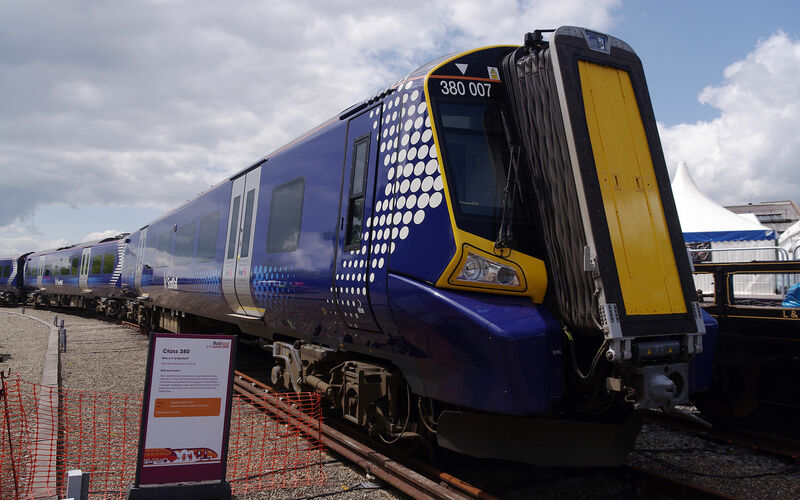 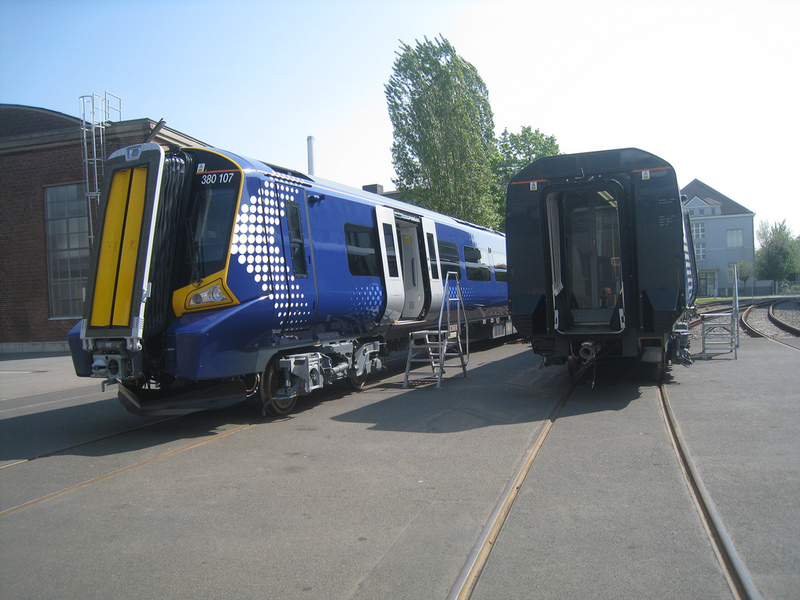 A basic brand requirement was to create a livery which offers adaption to cover a range of passenger services including Intercity and Airport routes to give individual identity to differing vehicle formations and services. 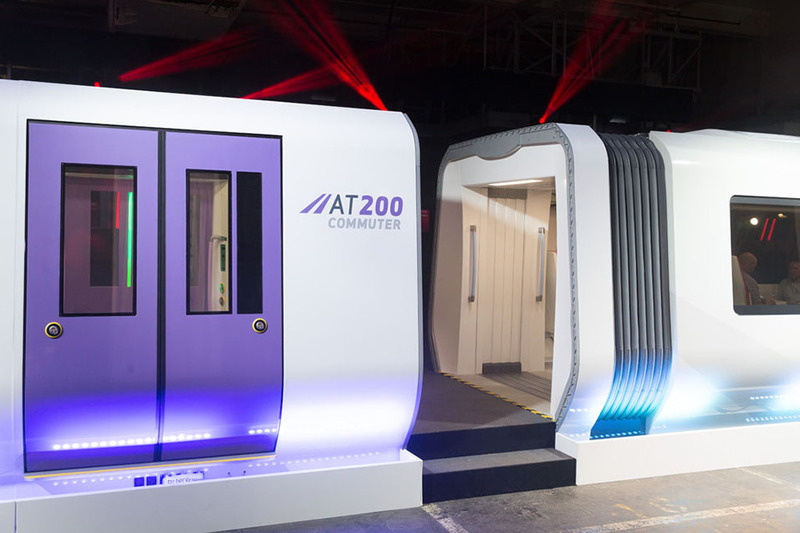 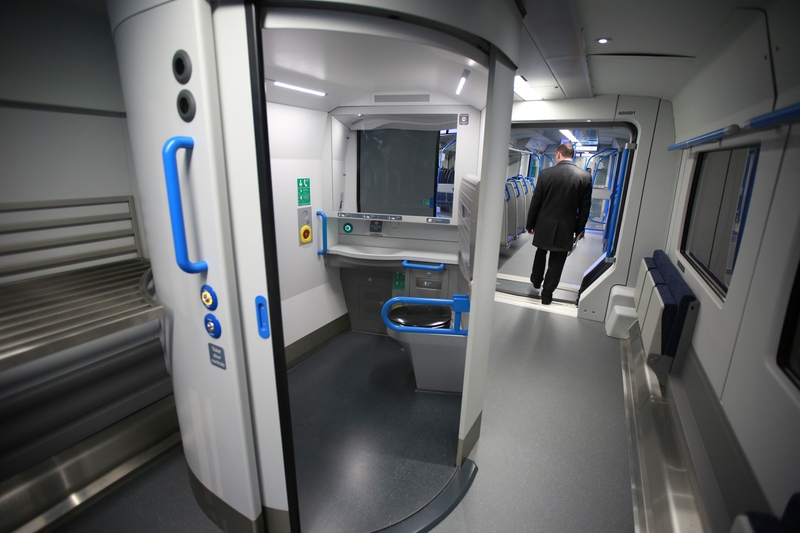 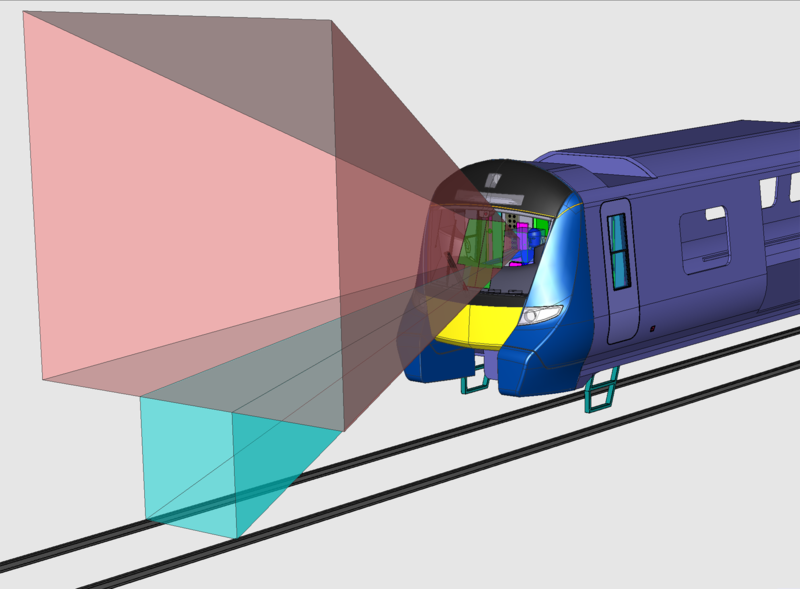 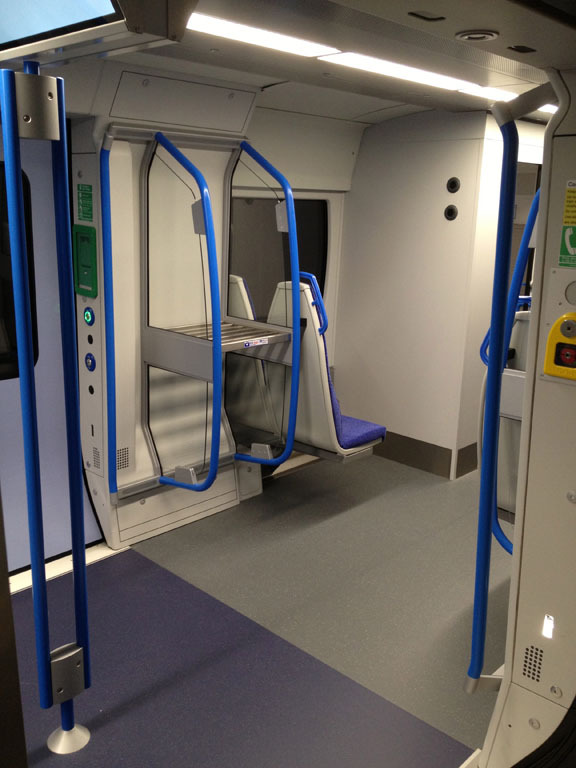 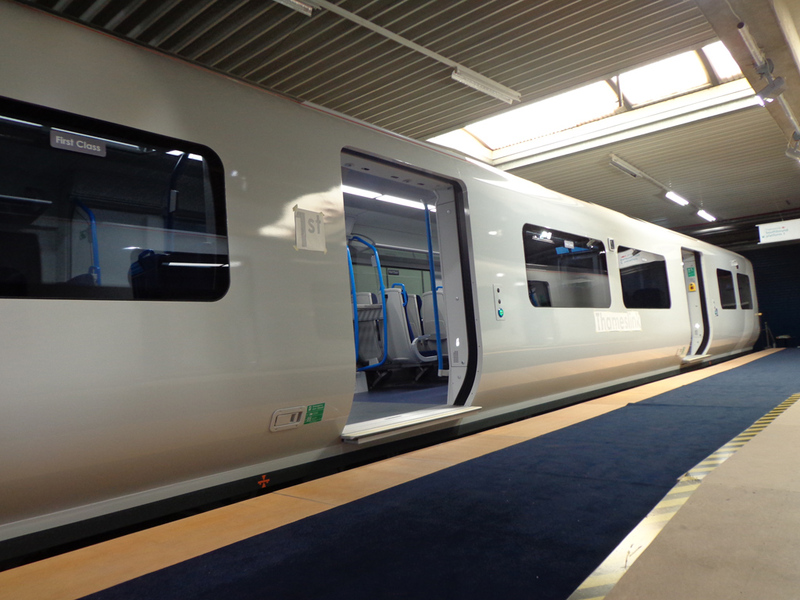 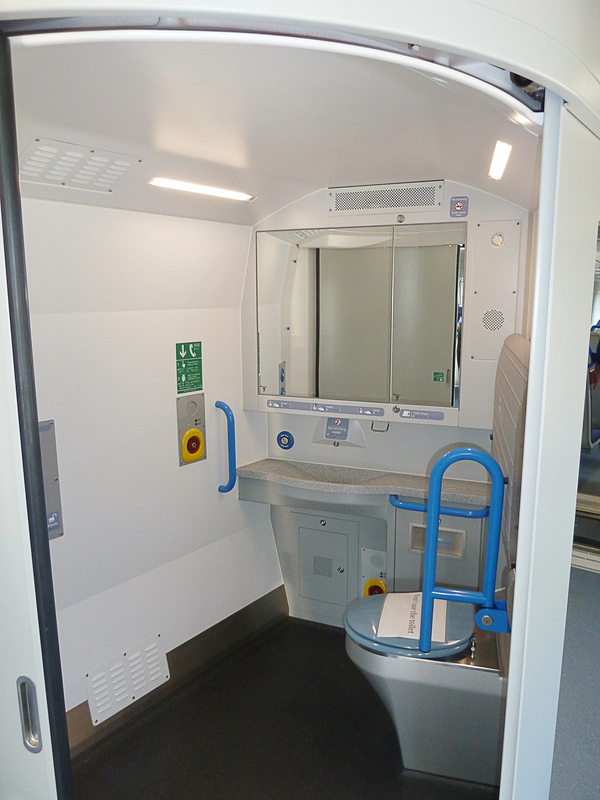 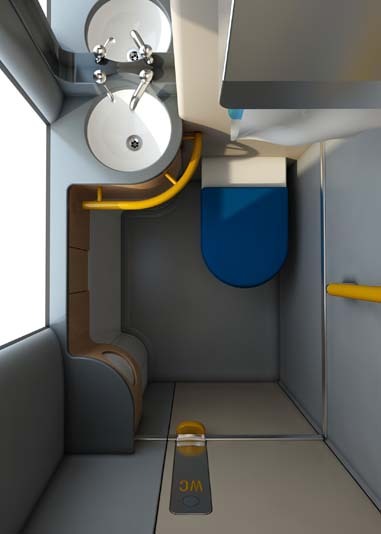 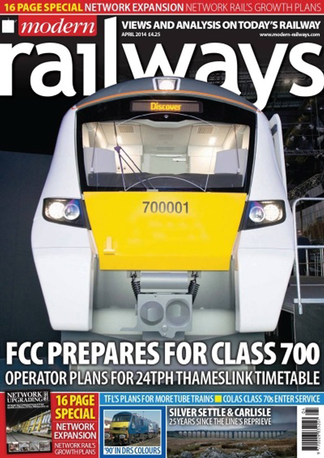 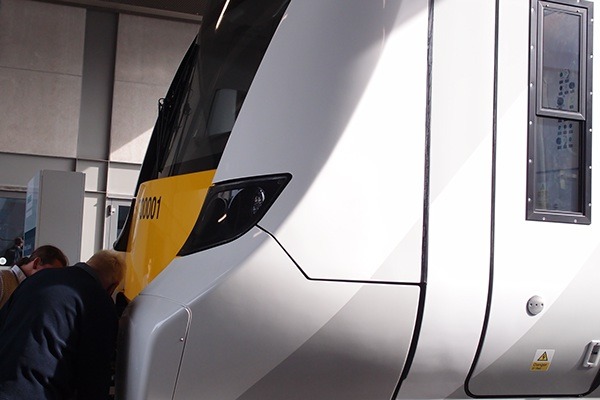 As part of the Siemens Desiro City Platform and having already under taken the exterior styling for the Class 700, Schoenemann Design were tasked with integrating a front facing deployable system for emergency evaluation of passengers and crew in tunnels. 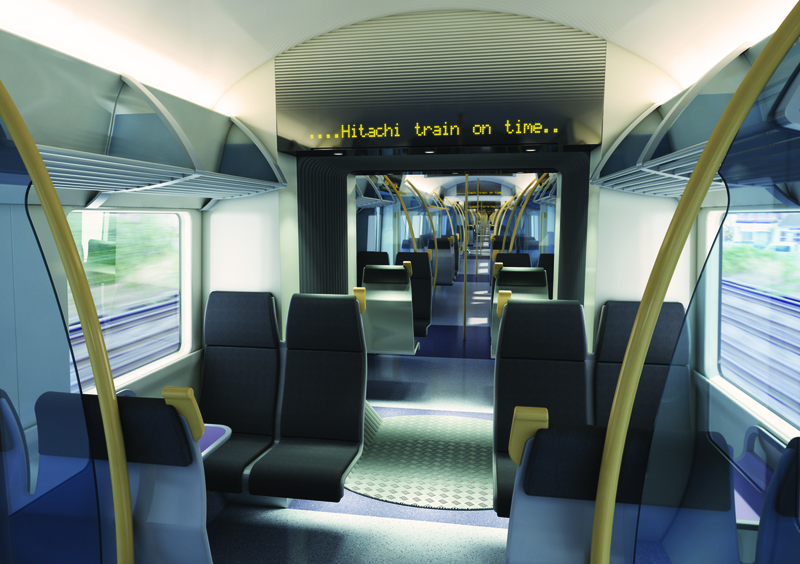 Developing a new range of crash tested, cantilever seats for Hitachi Rail Europe’s AT100 and AT200 mock up. 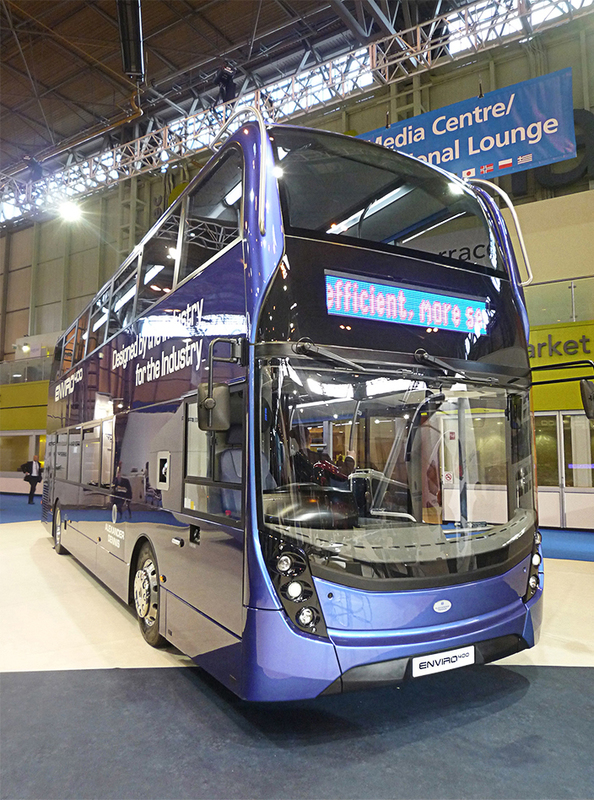 The all new ADL Enviro 400 (Euro 6) is the successor to Britain’s best-selling double deck bus, raising the bar for the industry, with a new more fuel efficient, quieter vehicle with greater seating capacity. 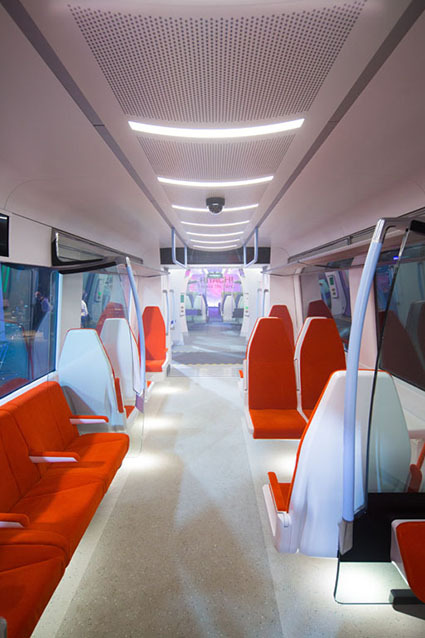 In a collaborative project with DGDesign, Mediasphere Ltd and ADL’s in House team, Schoenemann Design led the interior styling of the new ADL Enviro. 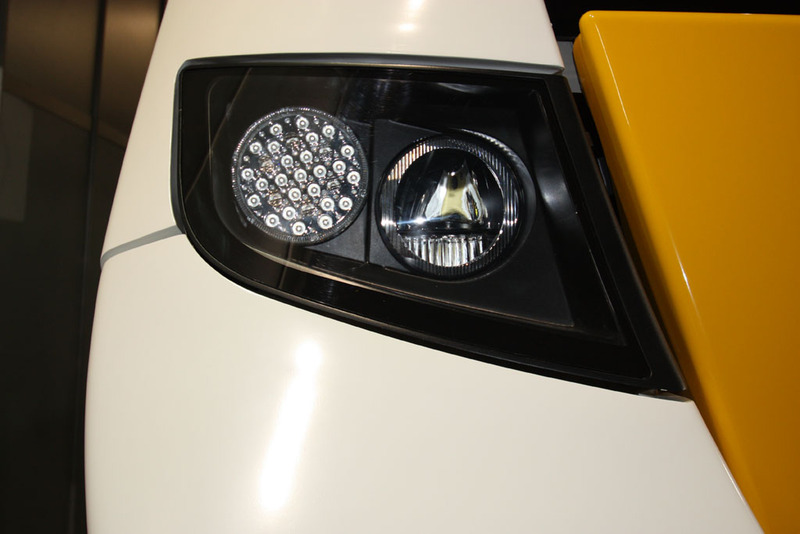 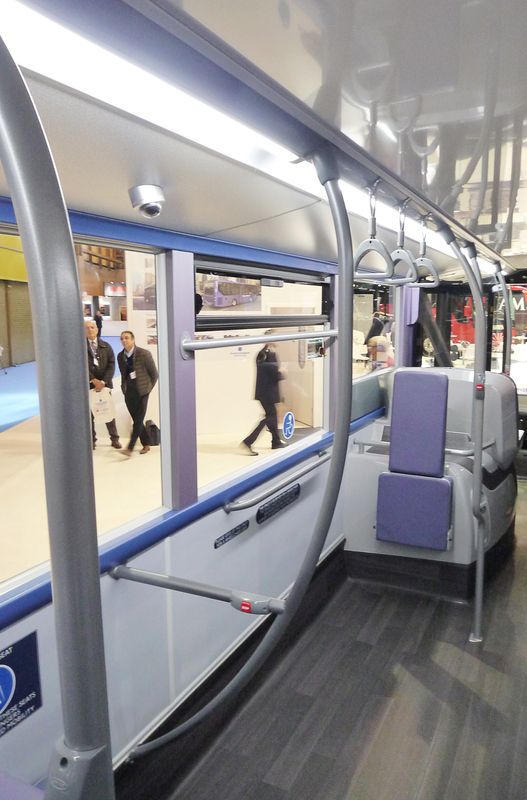 The design addressed major key issues regarding tooling costs, consistent manufacturing and assembly, passenger comfort and driver requirements. 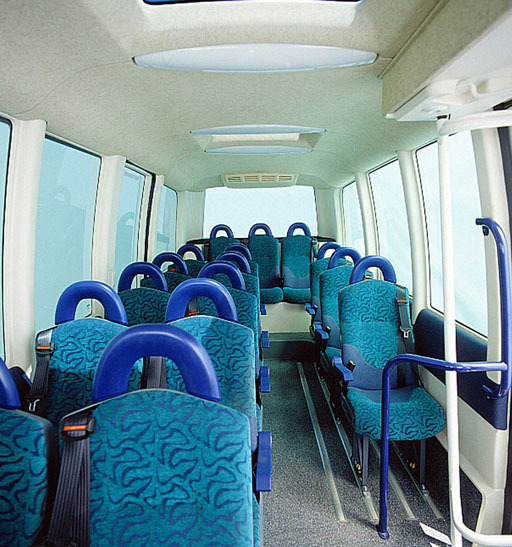 With a generic colour scheme applied it does not overwhelm the interior aesthetics and reduces costs. 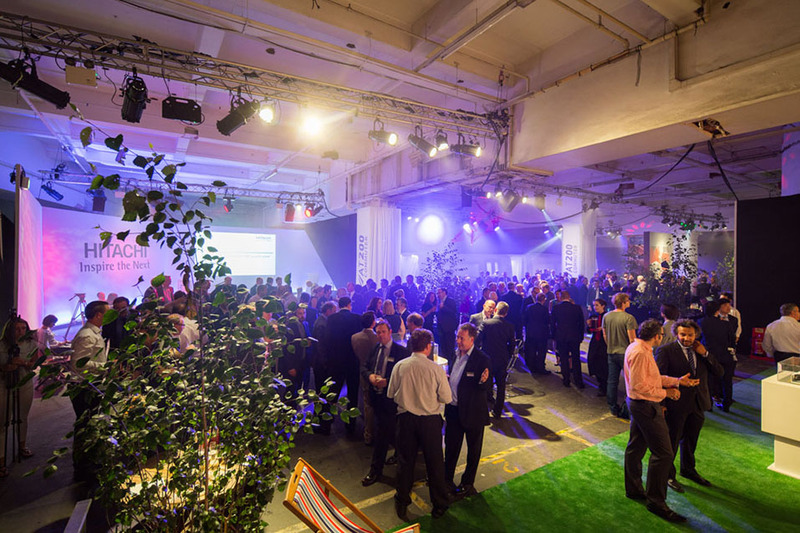 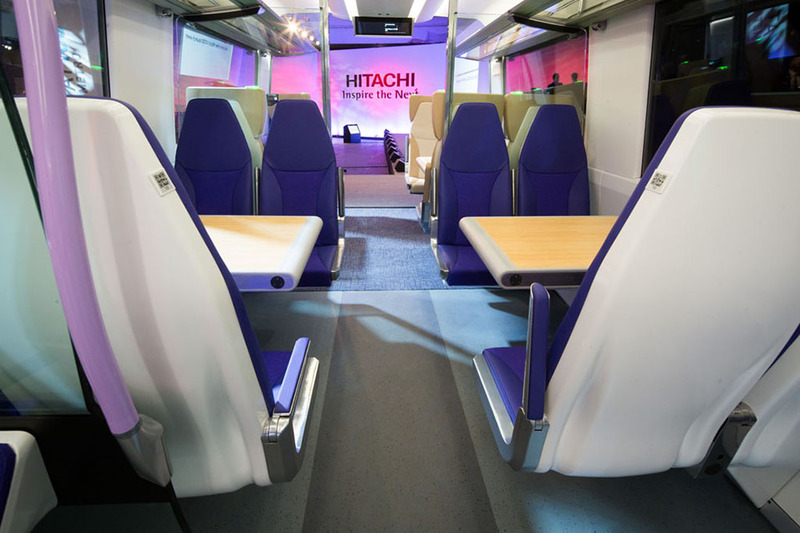 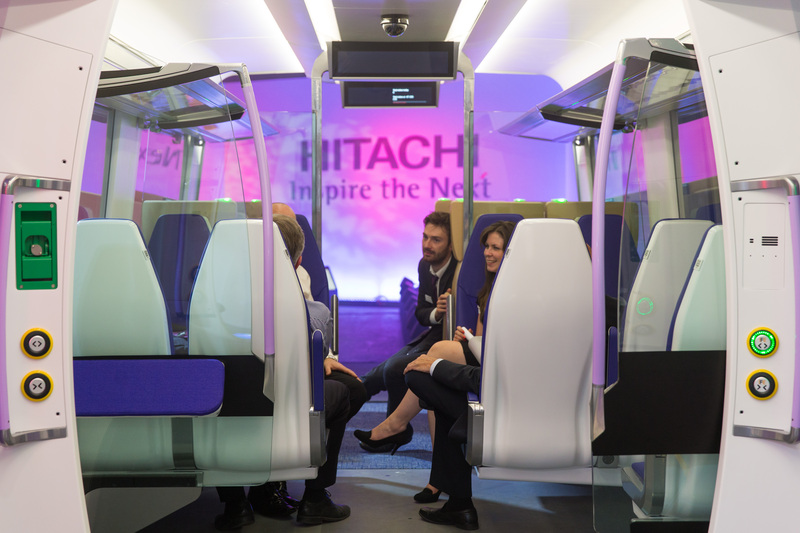 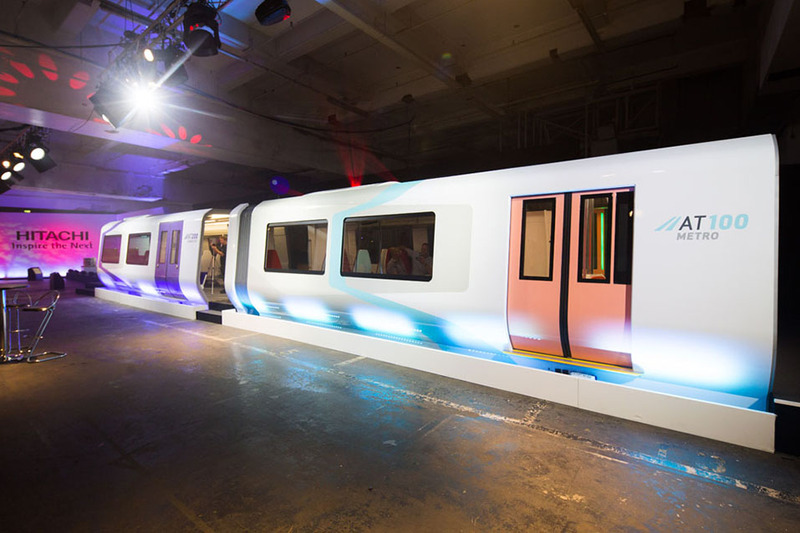 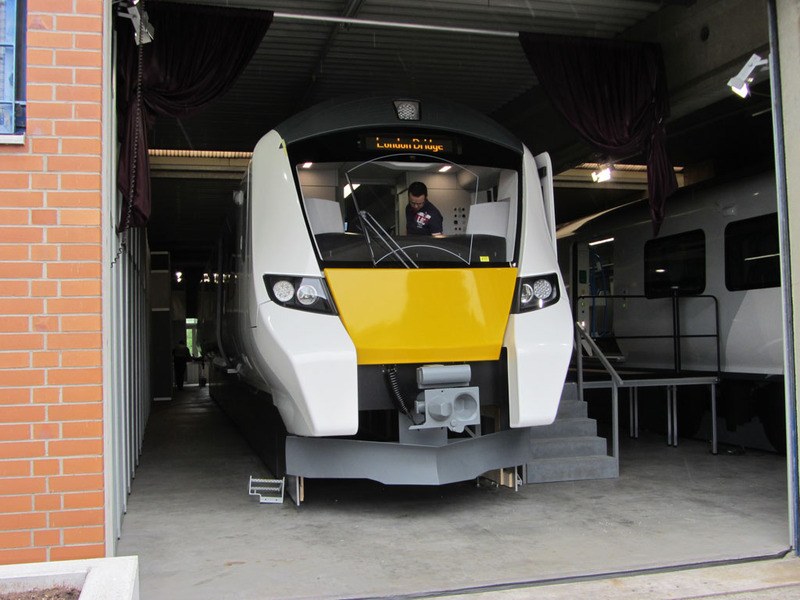 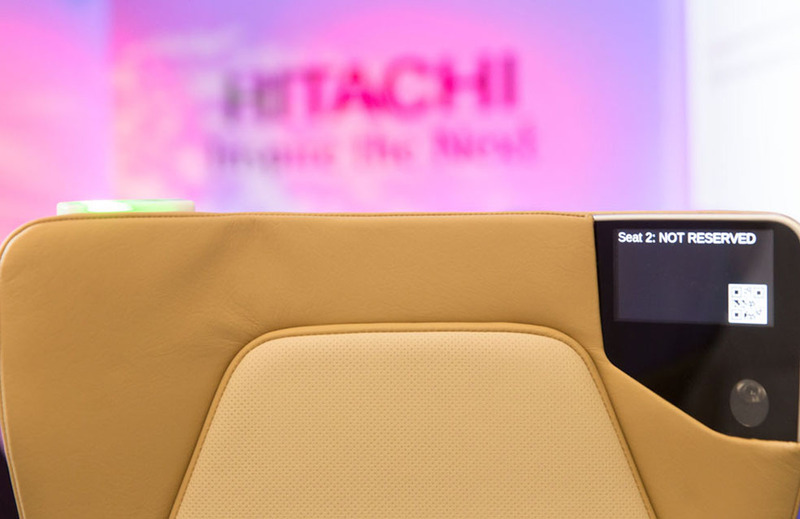 On July 21st Hitachi hosted a private viewing in London for the unveiling of the AT100 & AT200 mock ups. 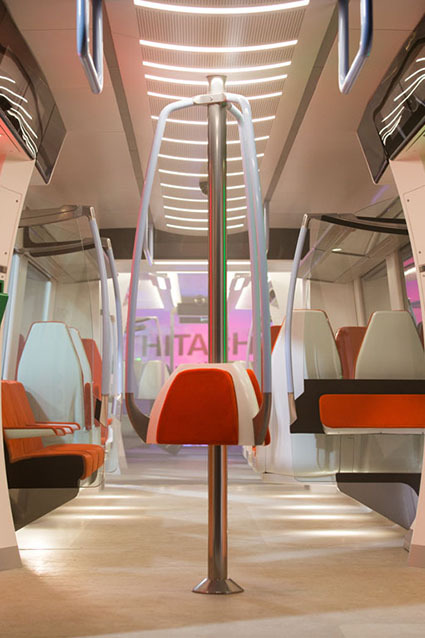 The AT100 was designed to meet the needs of metro operational conditions and requirements outlined by Hitachi. 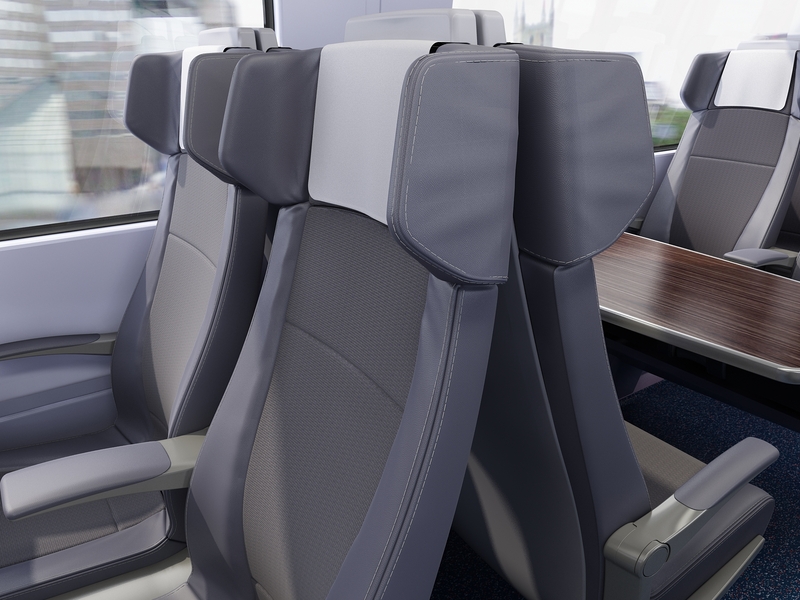 The design meets the demands of an early morning rush, whilst providing passengers with clear information and a range of comfortable seating. 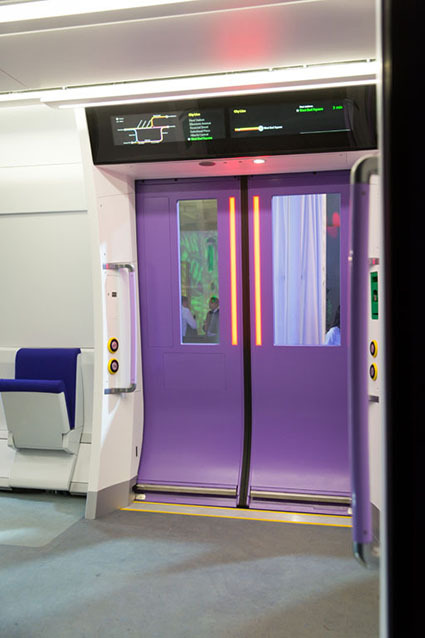 Sliding doors with integrated LED light units indicating the opening side to reduce ingress and egress speed. 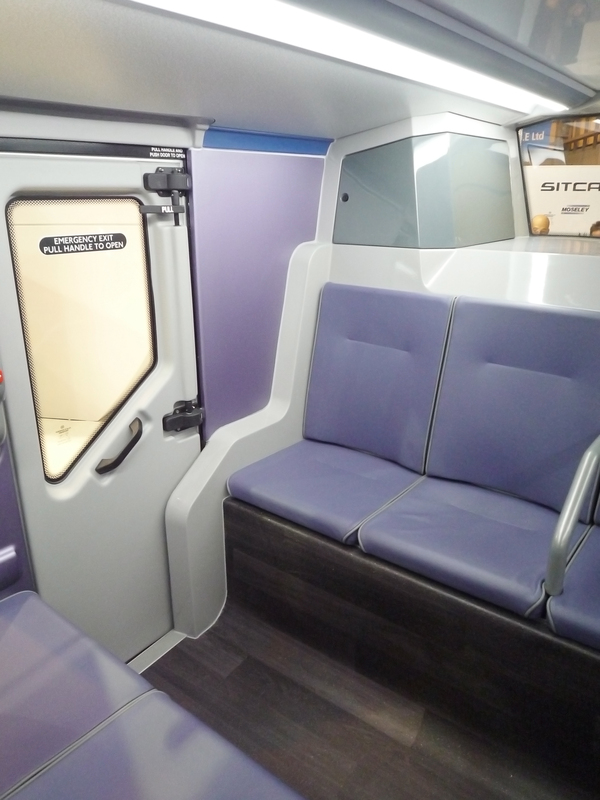 Under seat LED lighting encouraging passengers to store their luggage underneath their seats. 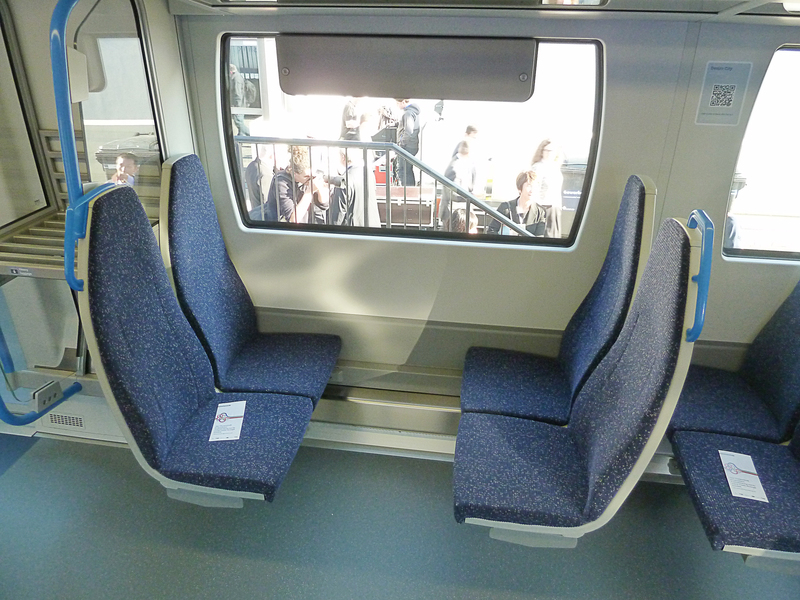 A unique central perch offering a comfortable space for passengers and providing elegant grab handles. 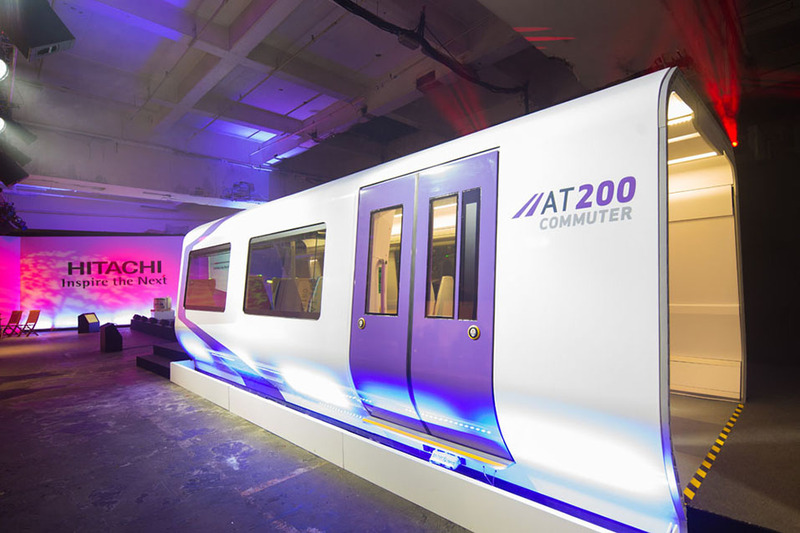 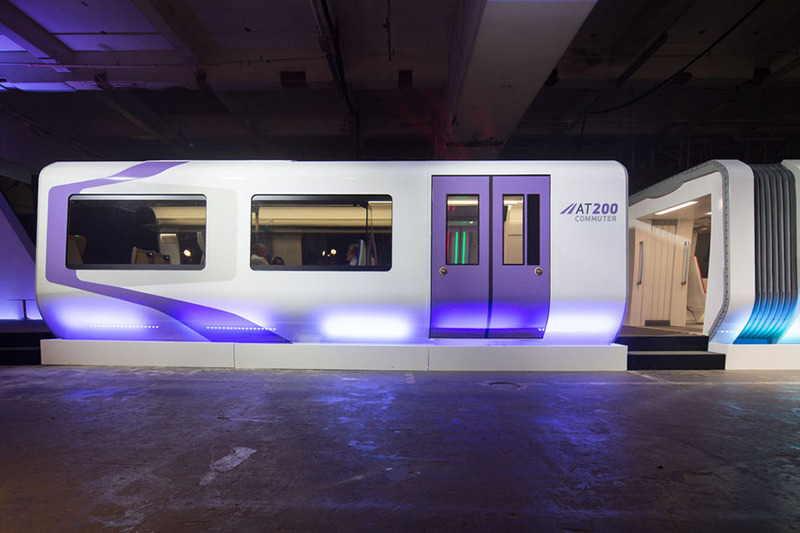 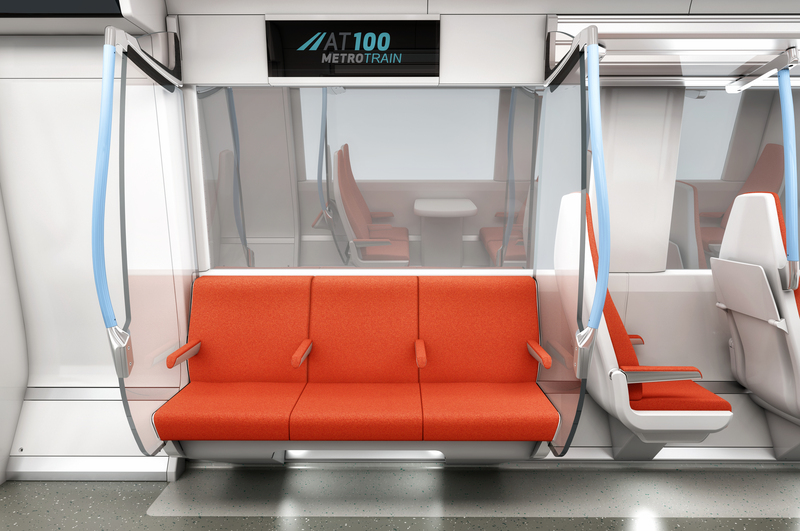 The AT200 was designed to meet a wide spectrum of requirements for regional or outer suburban commuters outlined by Hitachi. 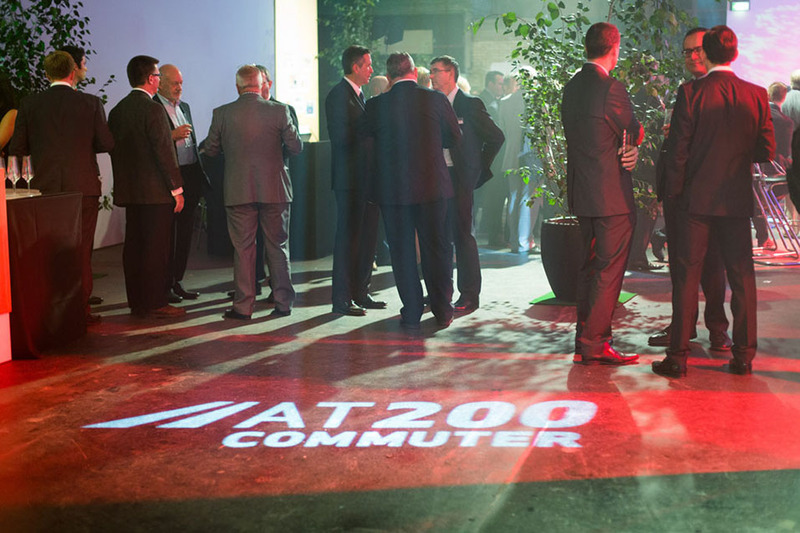 Focusing on consumer needs and integrating the latest technology into the vehicle, the AT200 has everything the modern day passenger would require. 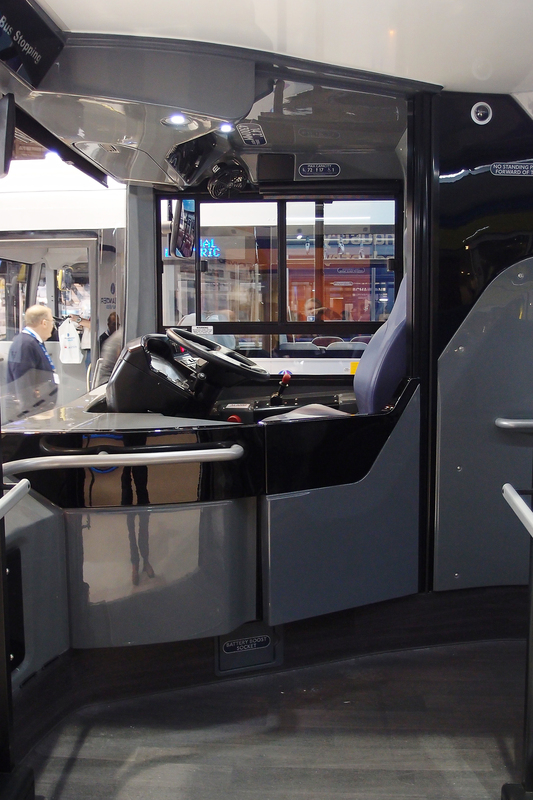 Also looking at the demands of an operator, modularity and functionality was a key issue to address. 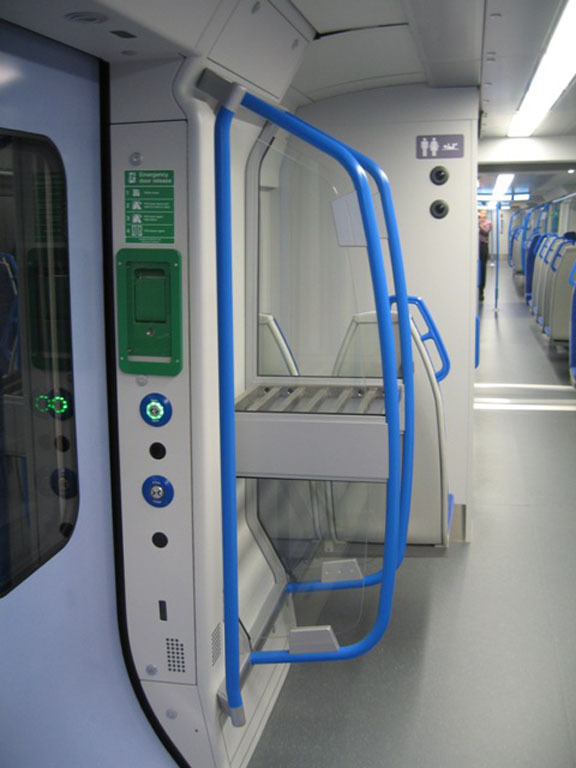 By utilising cantilever t-slot mounted units throughout the vehicle, operators are presented with the opportunity to manipulate the interior to meet their demands. 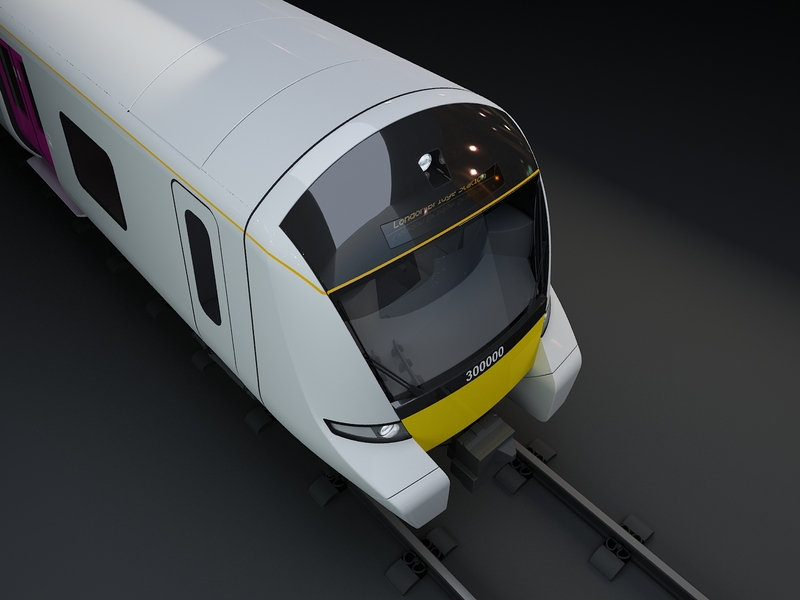 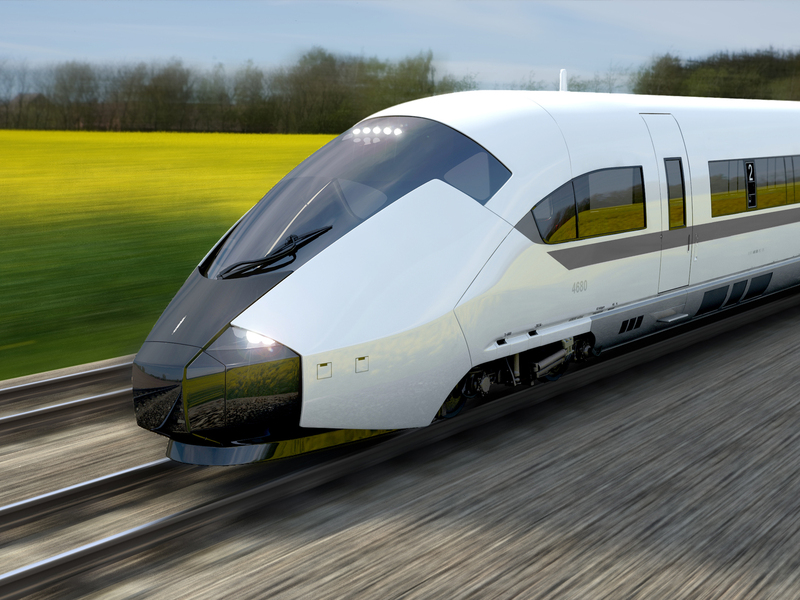 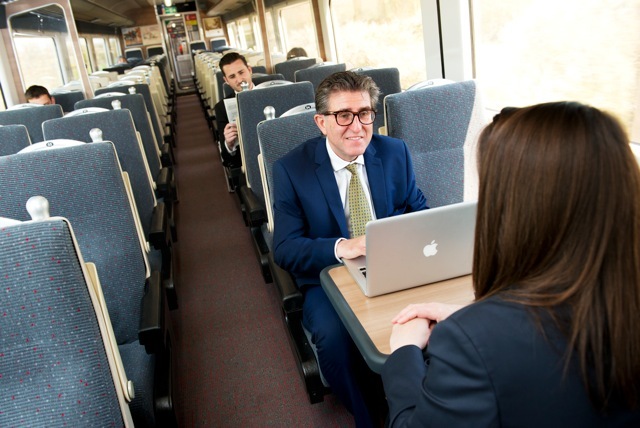 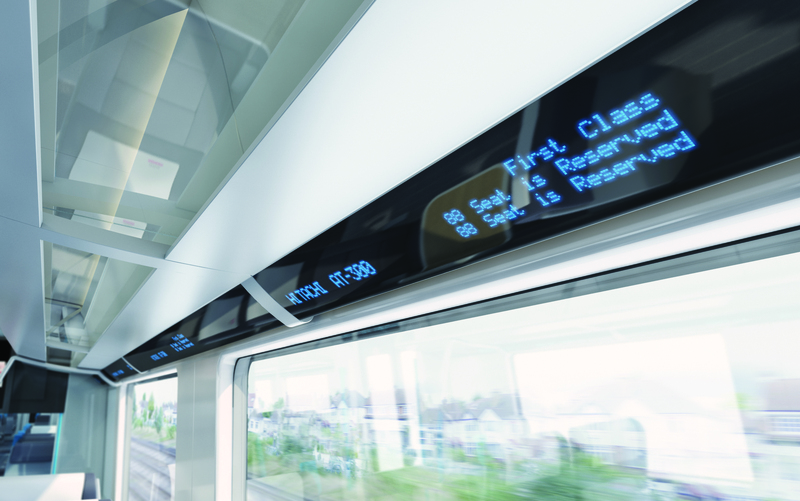 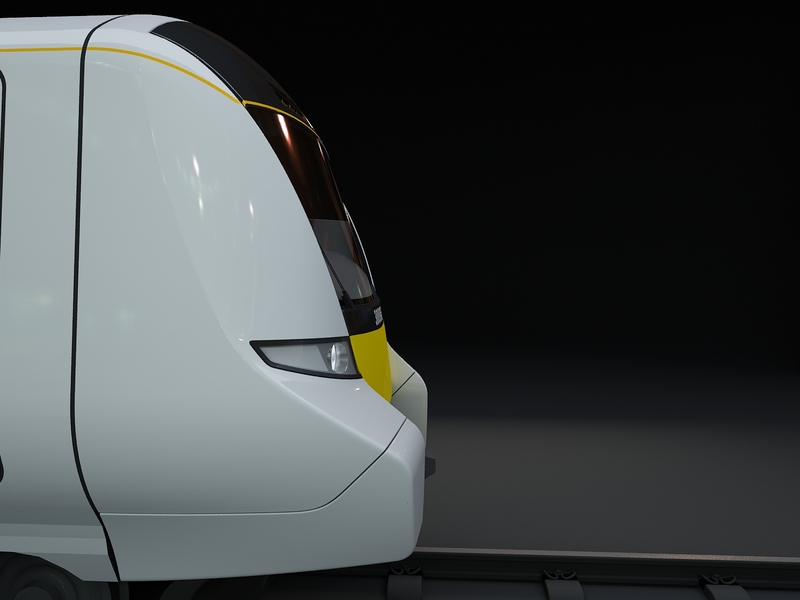 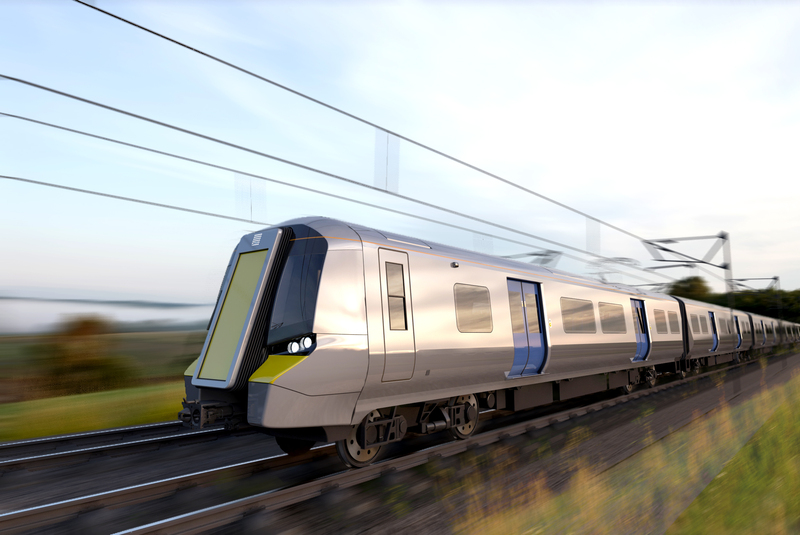 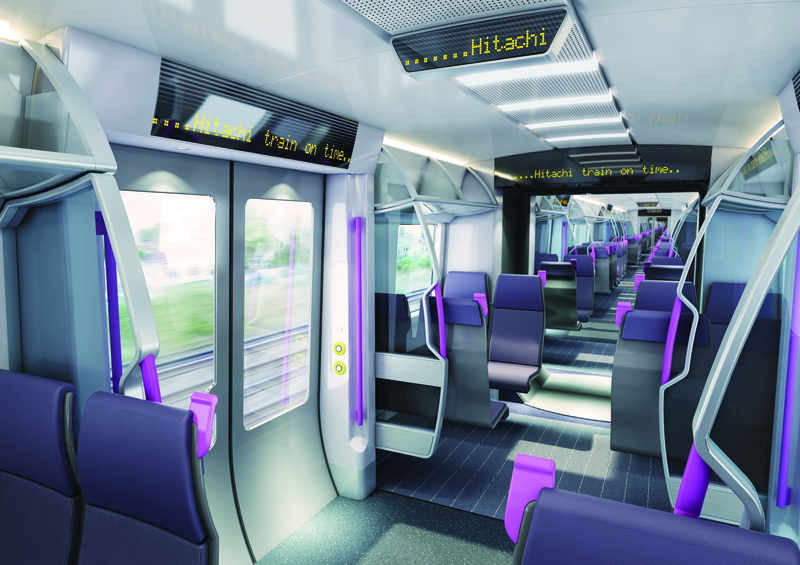 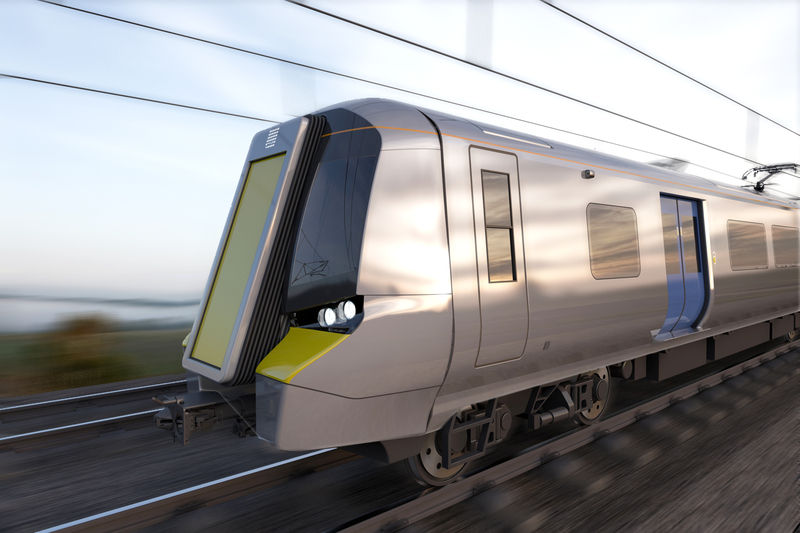 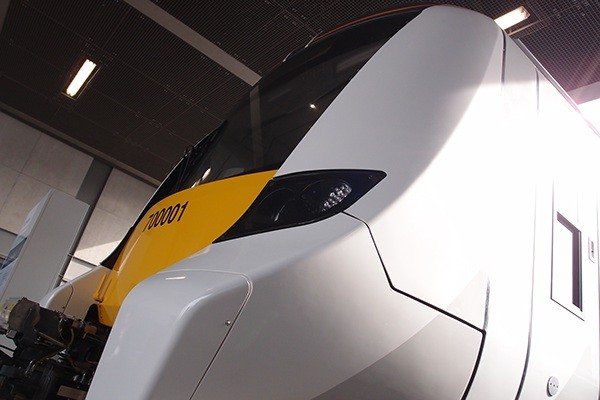 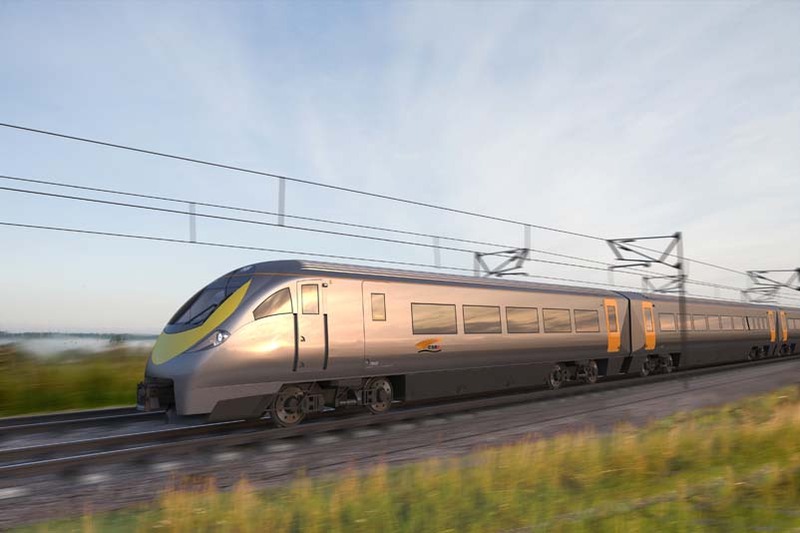 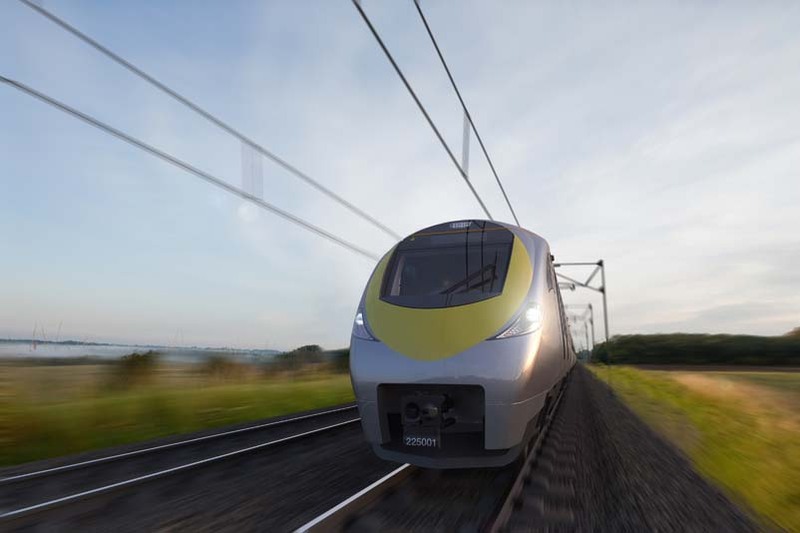 “The AT200, a highly standardised yet flexible design that improves the travelling experience for tomorrow’s commuters.” Andy Barr Chief operating officer at Hitachi Rail Europe. 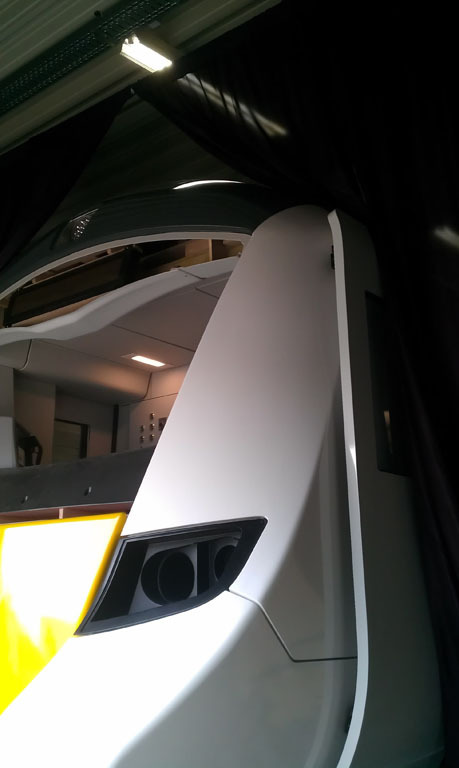 The construction process of a full size mock up in Germany. 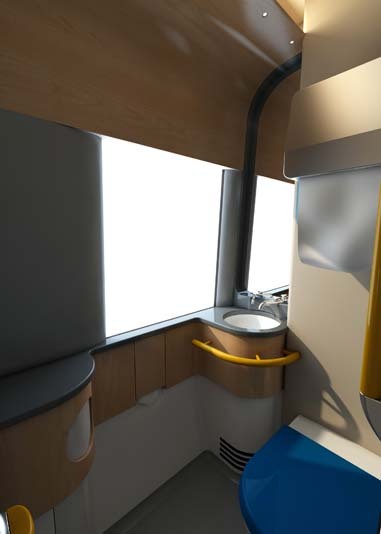 As we were involved in the interior design we over viewed the construction process of the mock up. 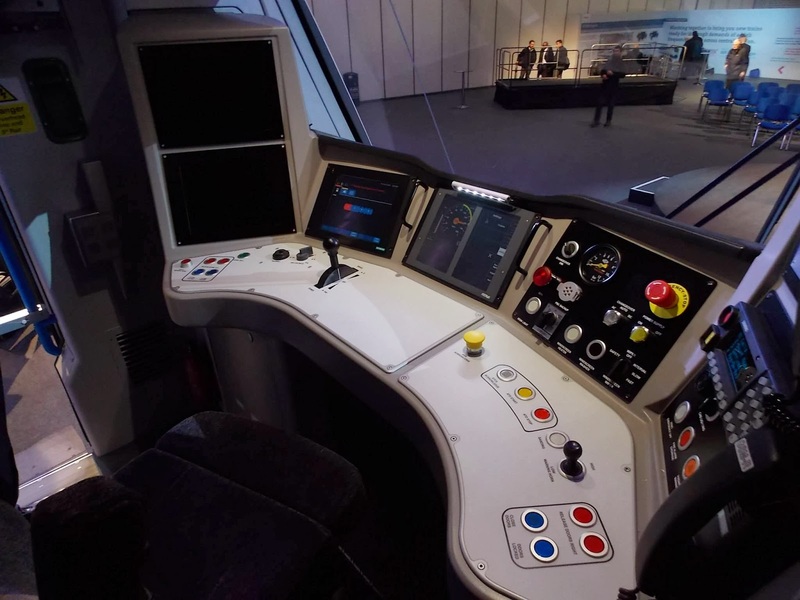 The mock featured various working units including the lights, multiple switches and controls. 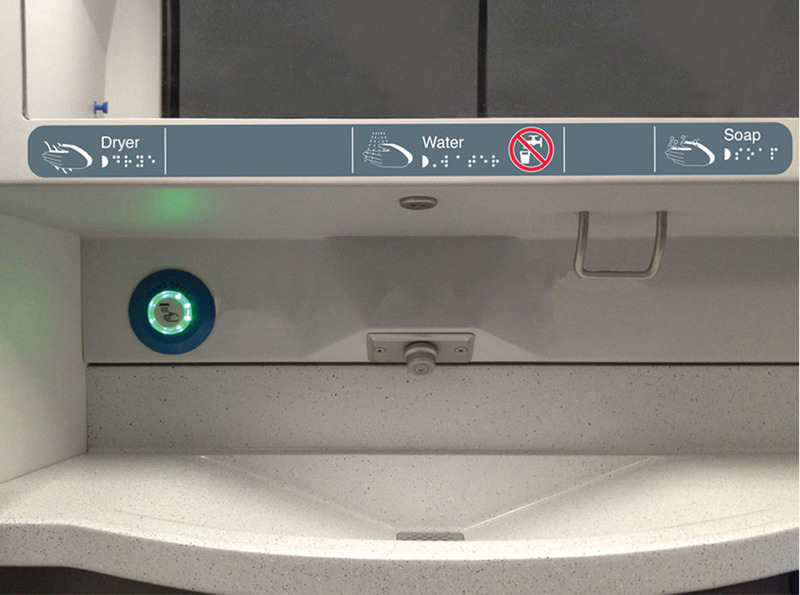 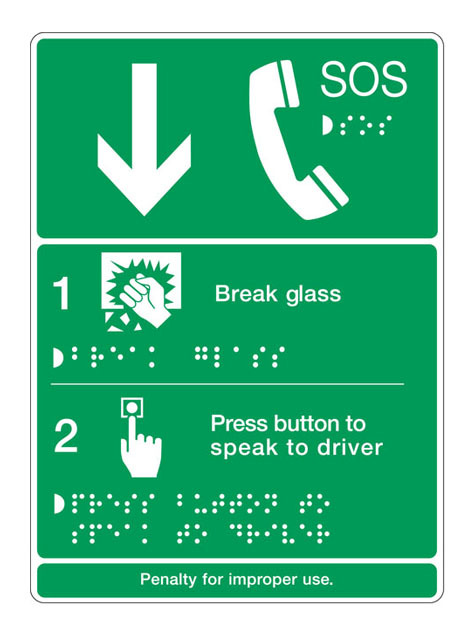 The mock up also proved useful for testing out the signs and notices, which can be seen in a separate case study. 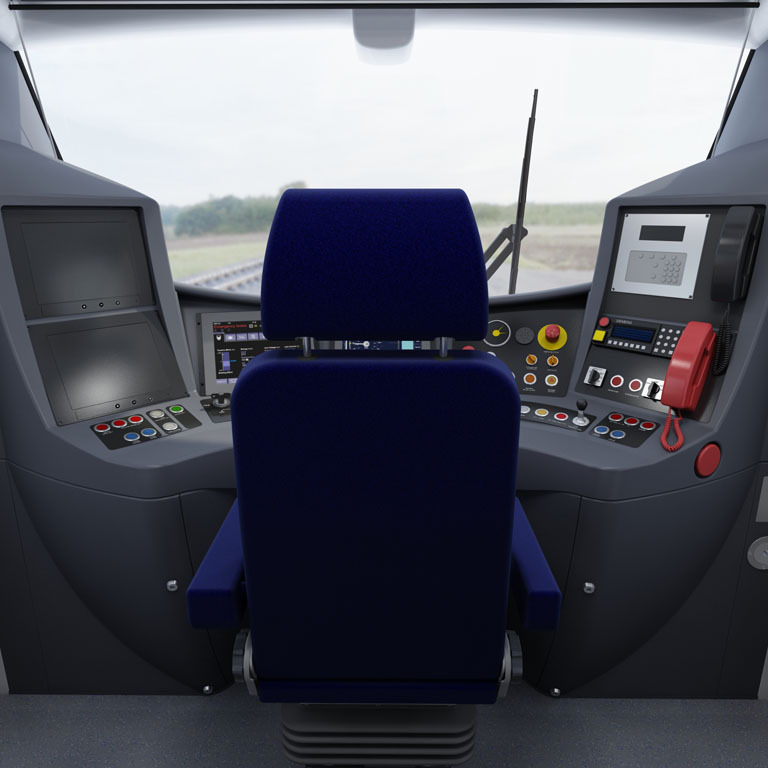 The below images are a mix of CGI and photographs. 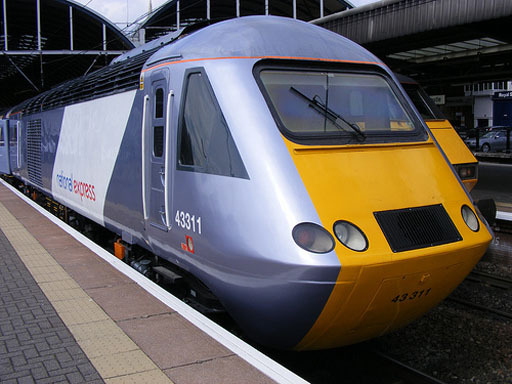 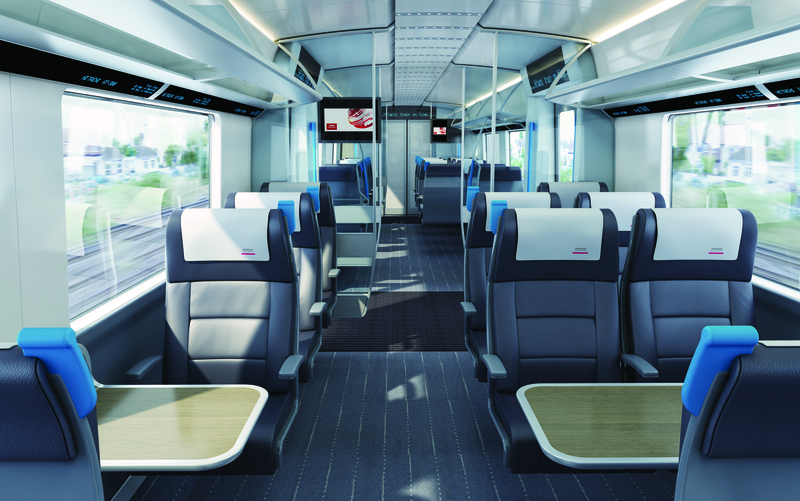 Undertaking a number of projects with Angel Trains, including the classes 150, 153, 158, 180 and the 390 Virgin Pendolinos. 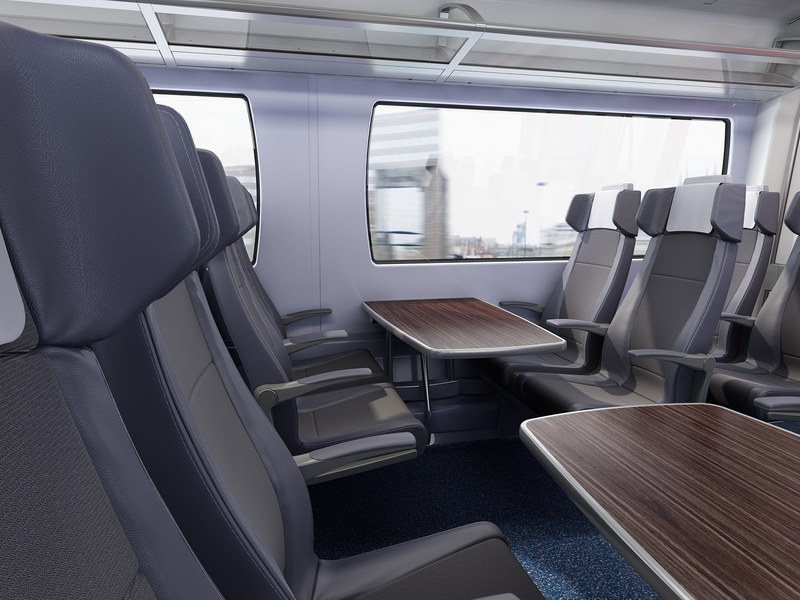 Our primary role has been to create new interiors to meet the changing demands of passenger requirements and vision commensurate with contemporary business and social expectations. 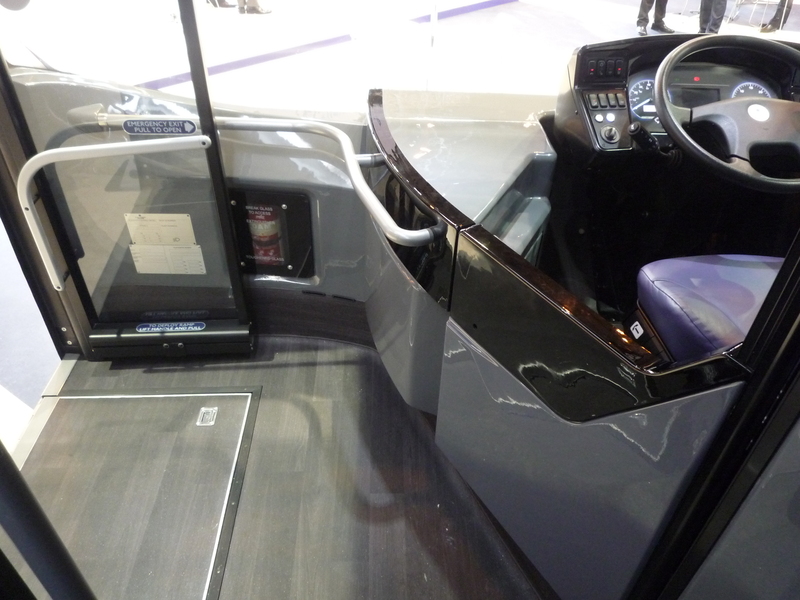 Creation of contemporary exterior styling and driving cab interior including the driver’s desk workstation. 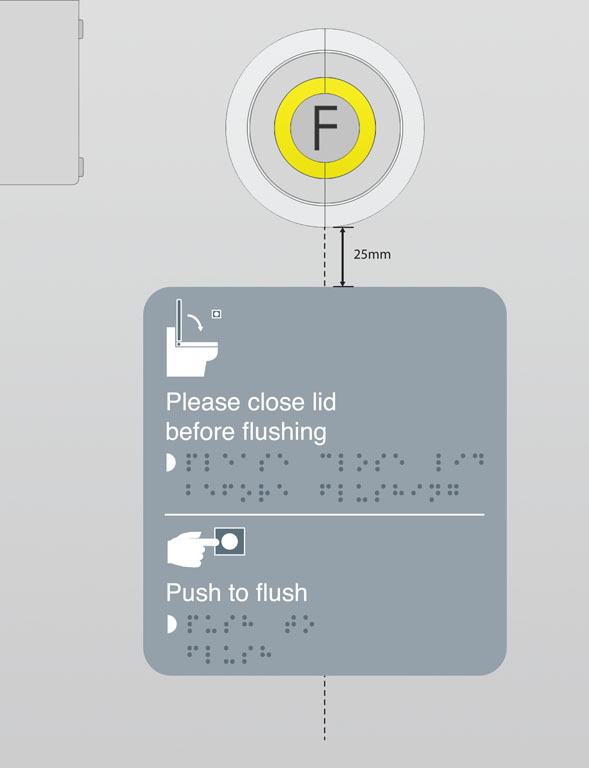 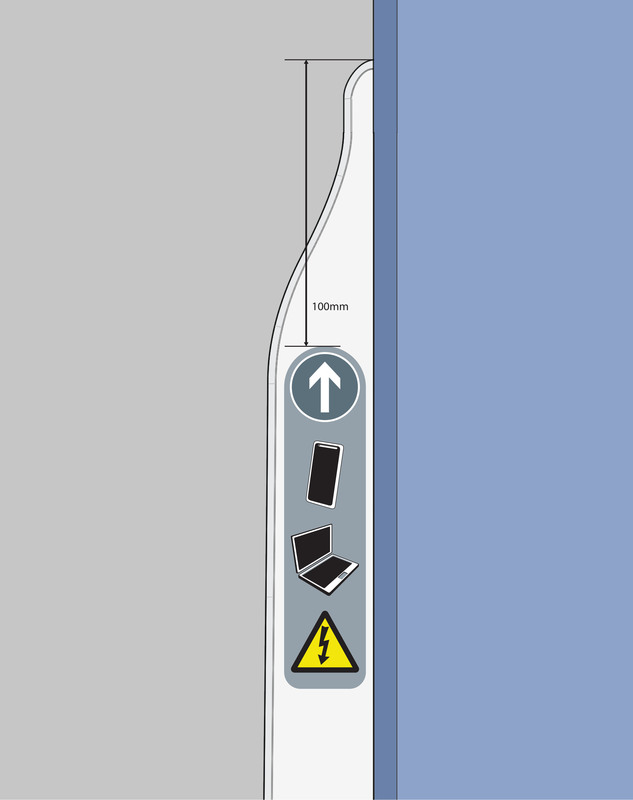 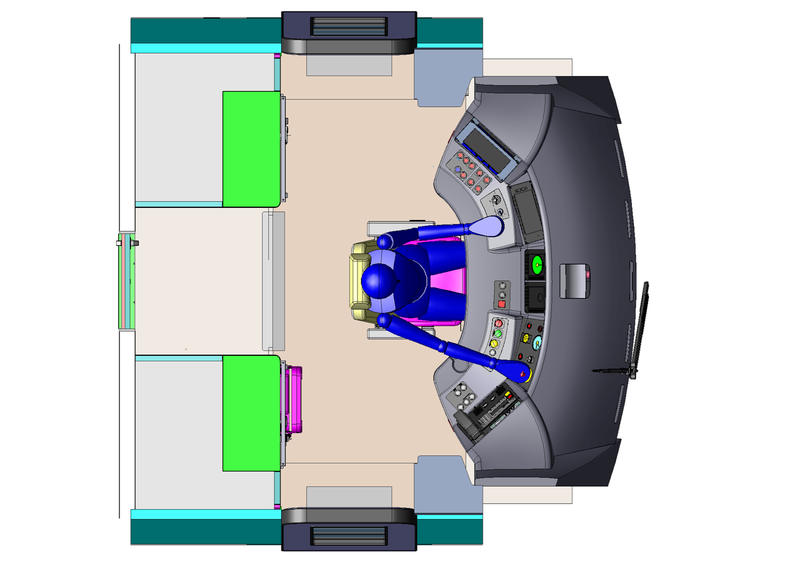 Designed with consideration to human factors, equipment layout, and rationalisation of UK technical requirements. 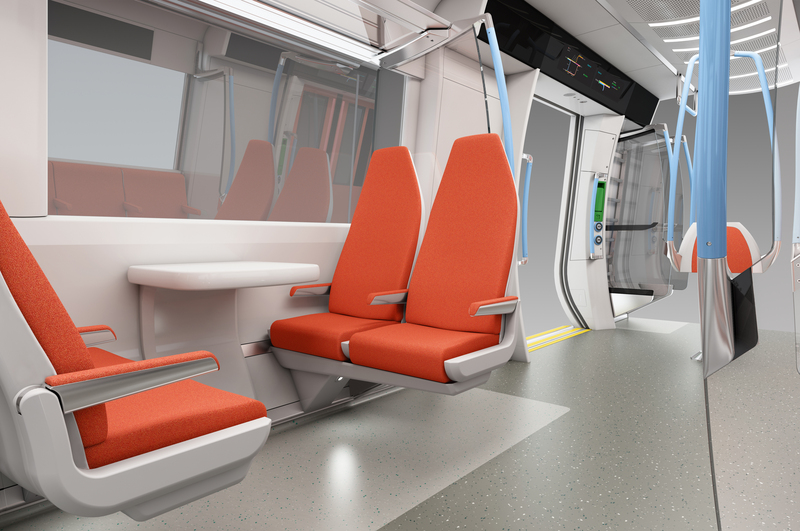 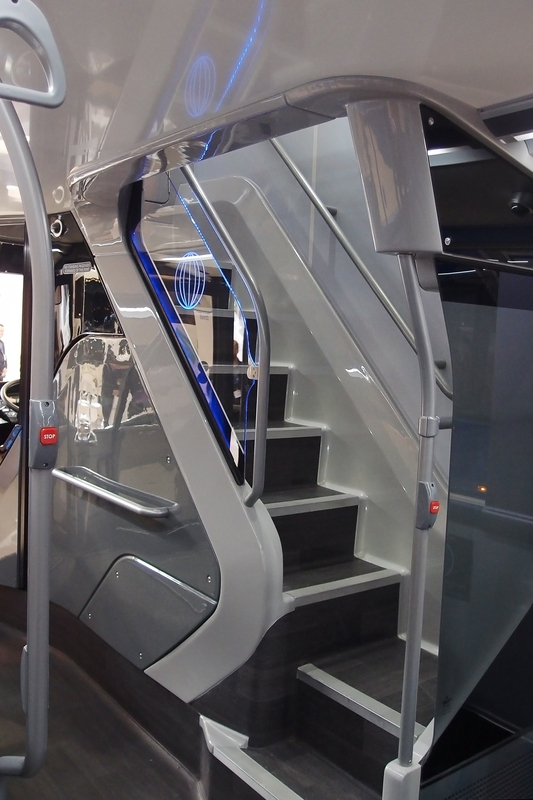 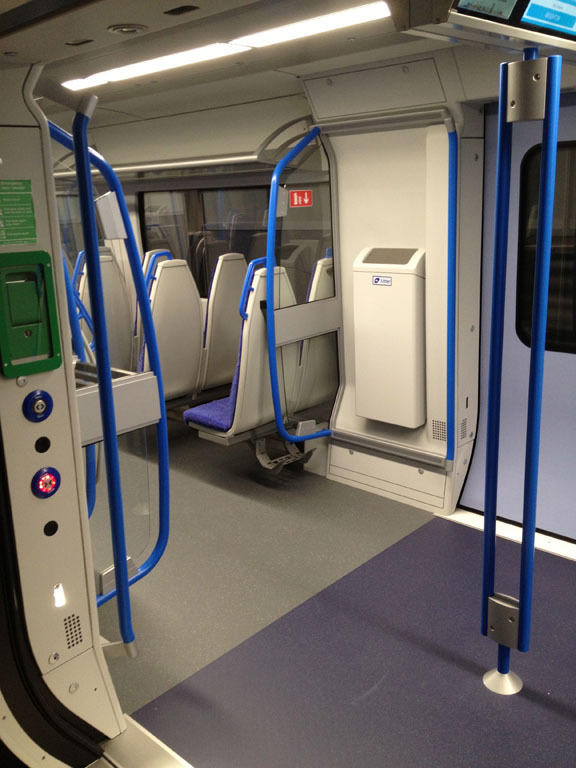 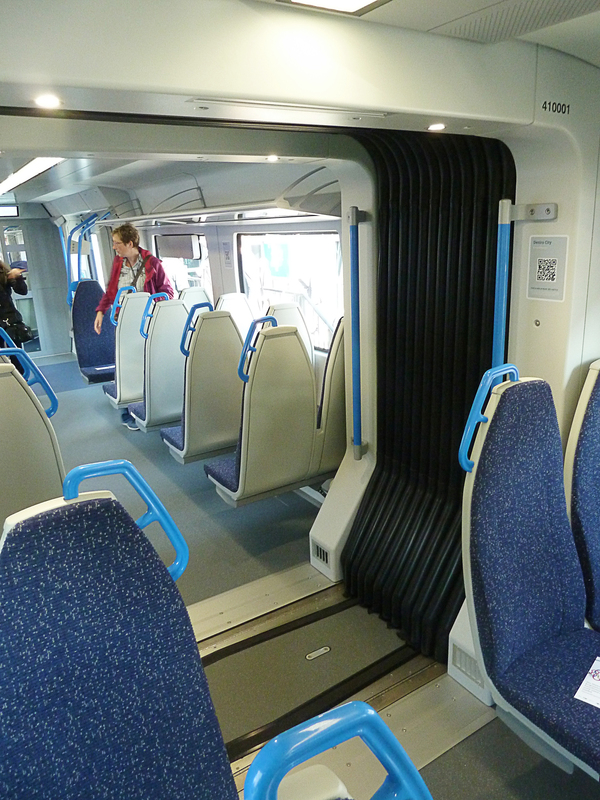 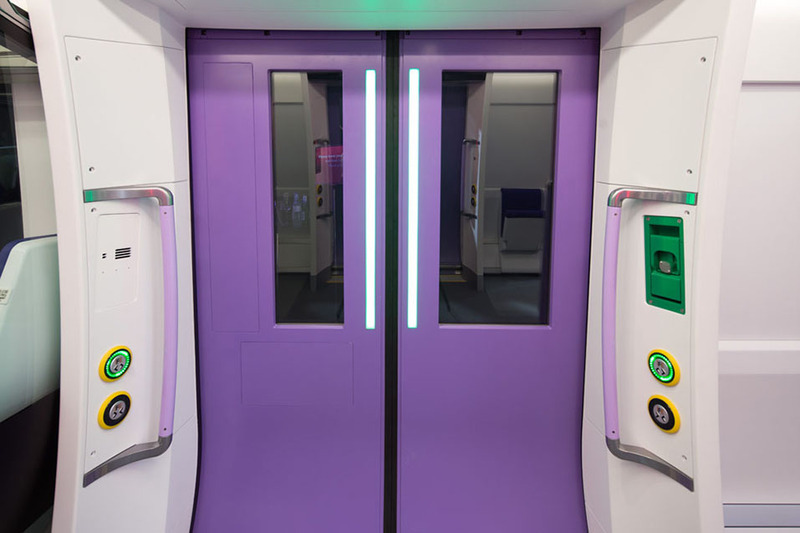 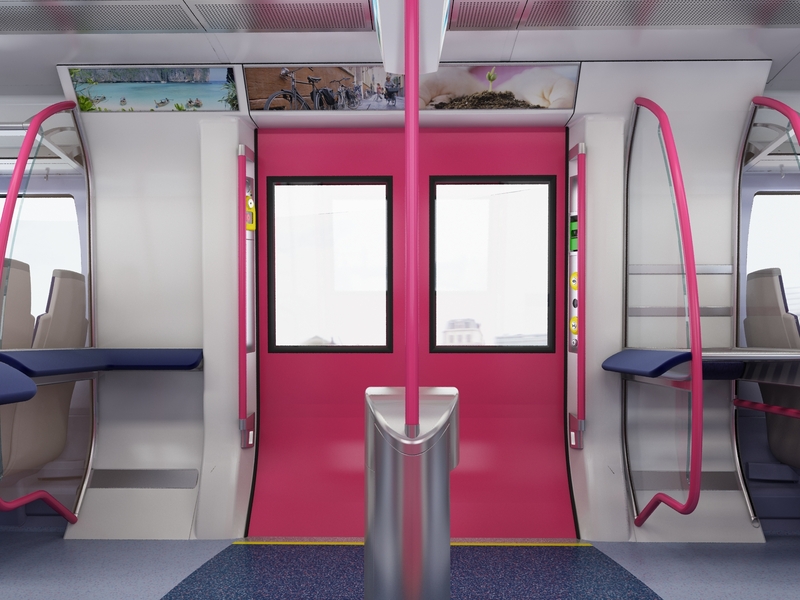 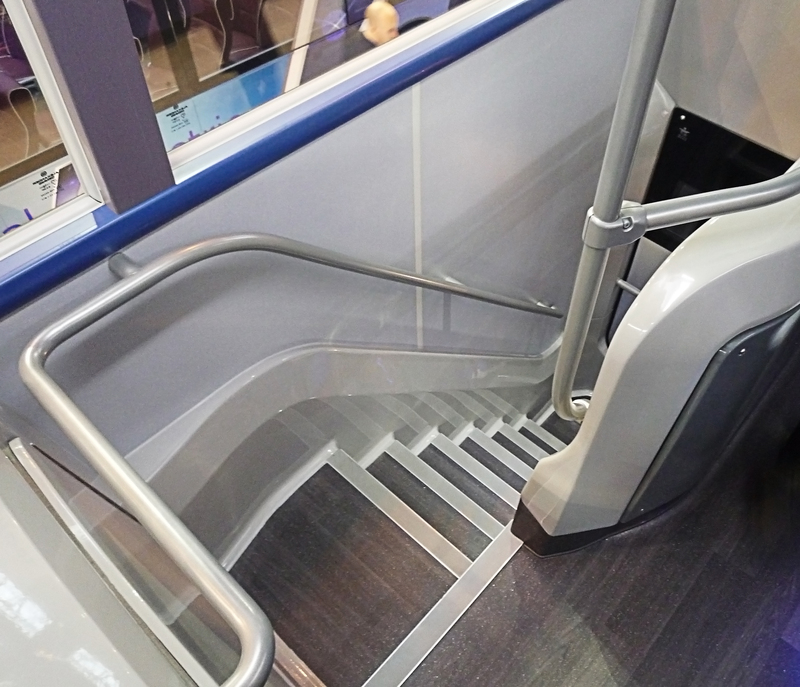 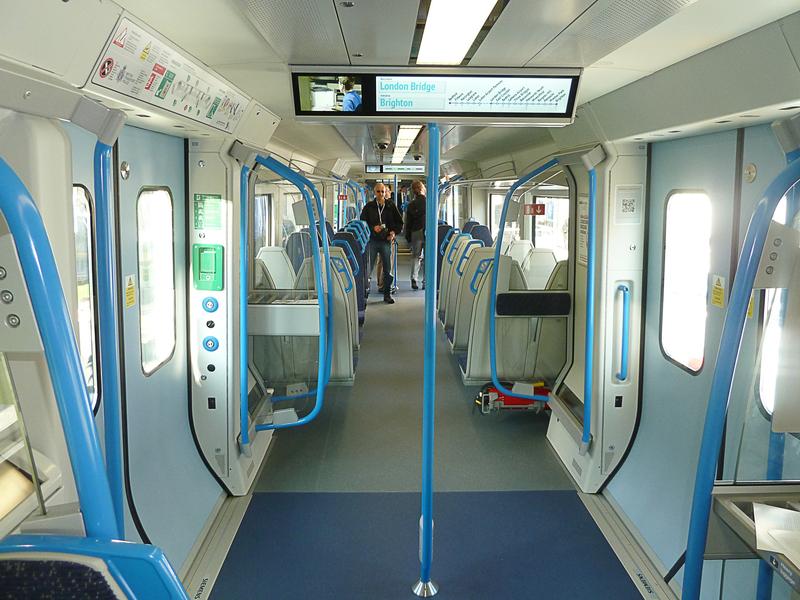 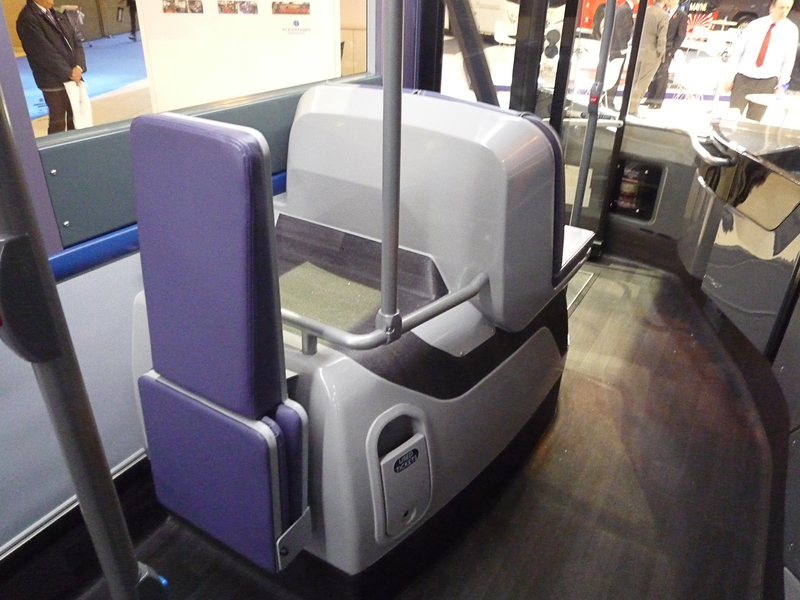 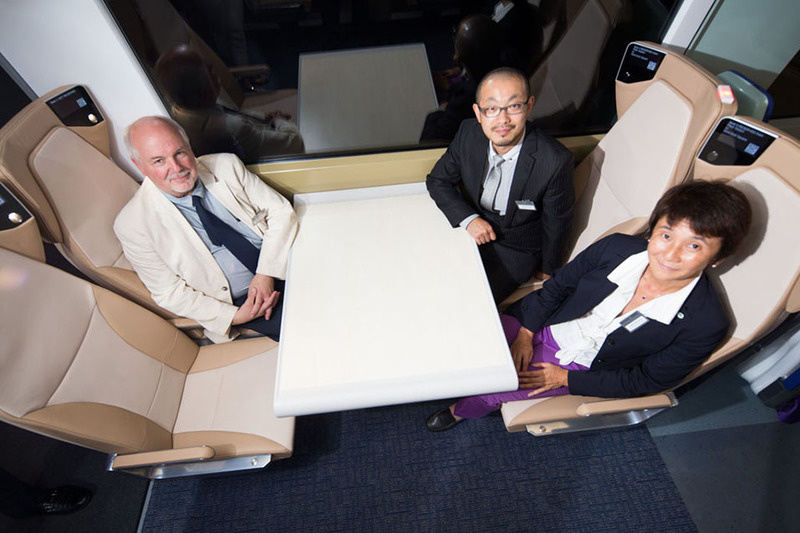 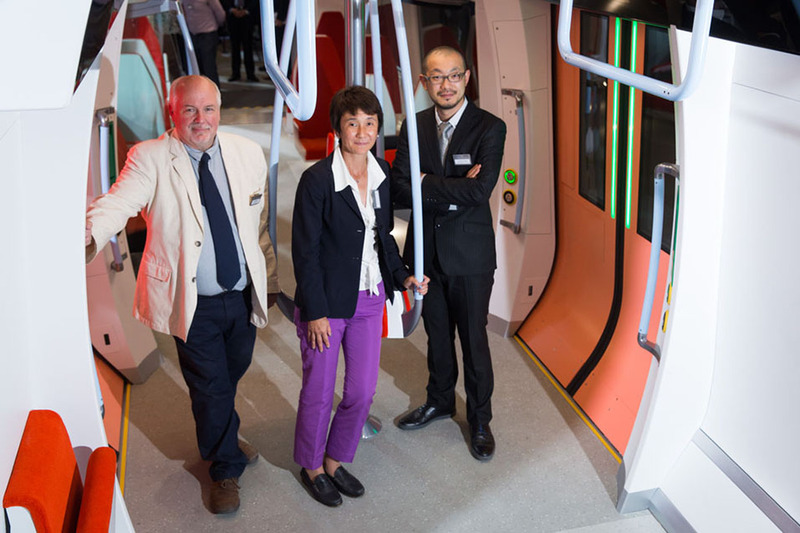 Styling evaluation task for the integration of a passenger gangway into contemporary cab design to meet the demanding visual and corporate expectations of passenger rail services. 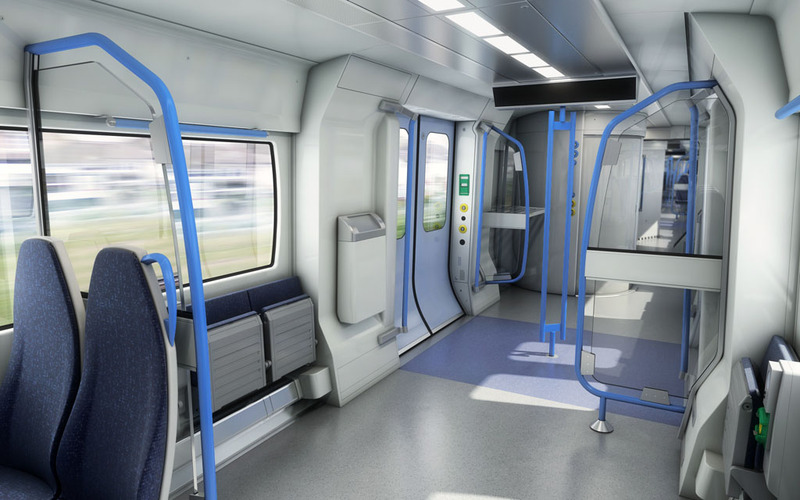 Desiro City rolling stock platform design study. 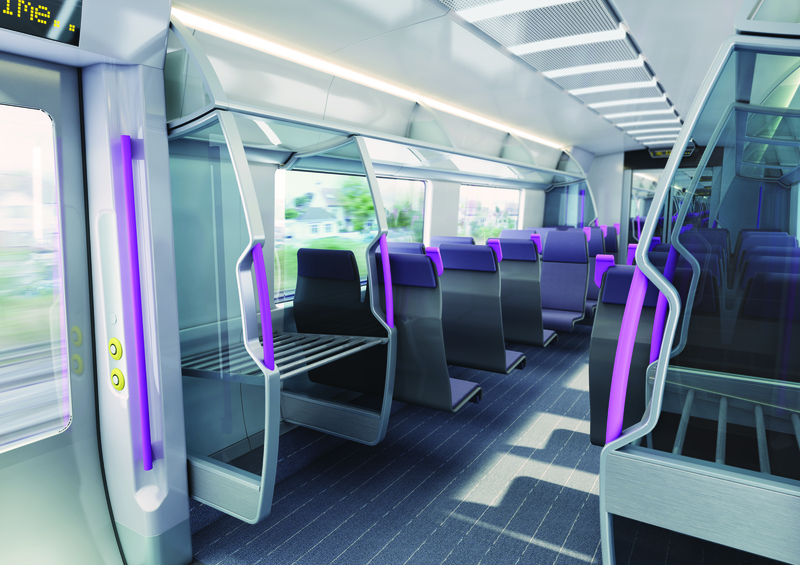 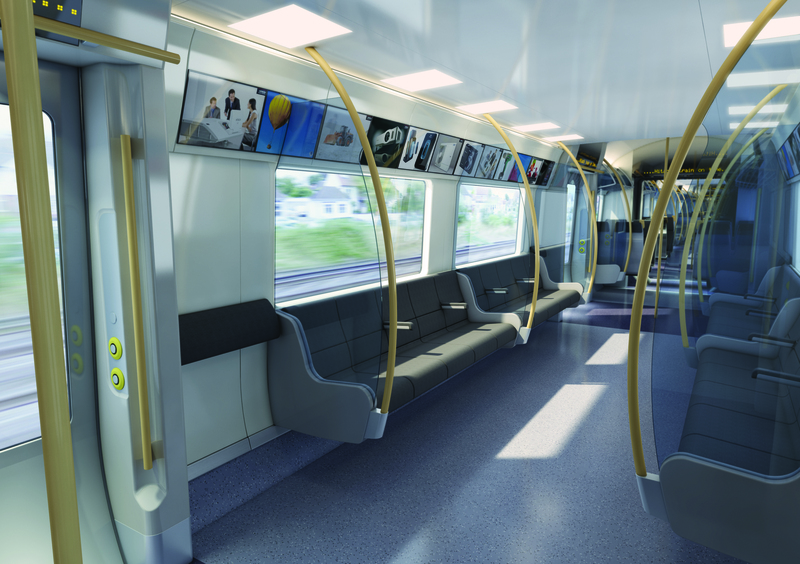 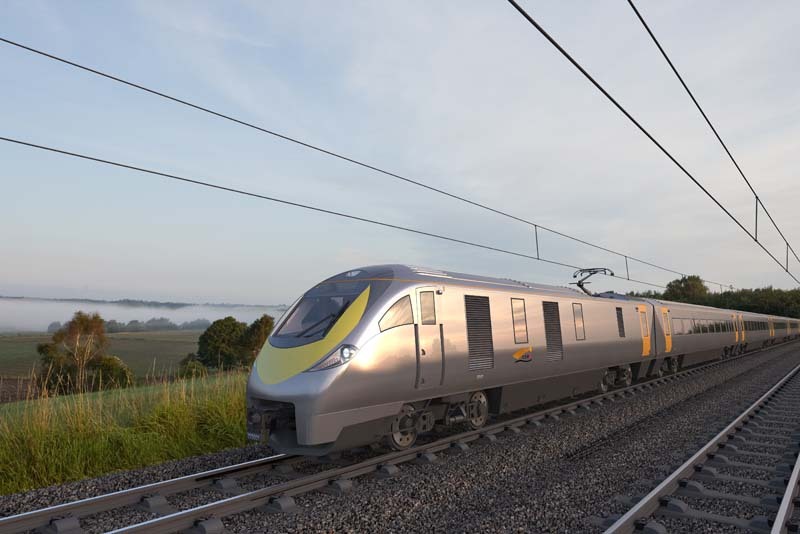 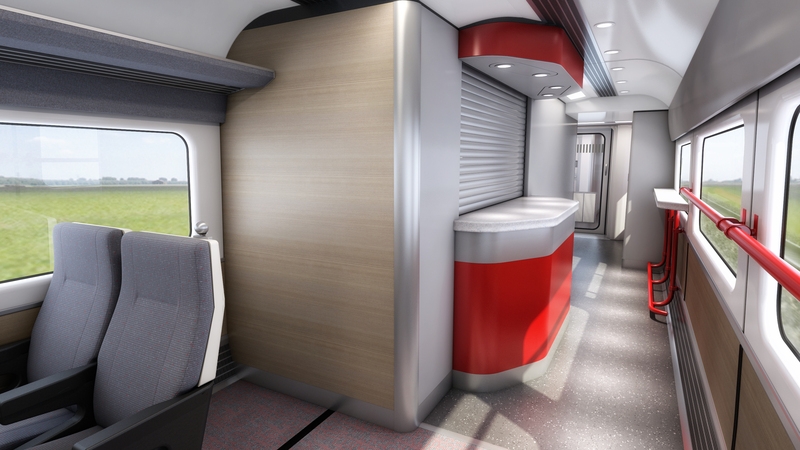 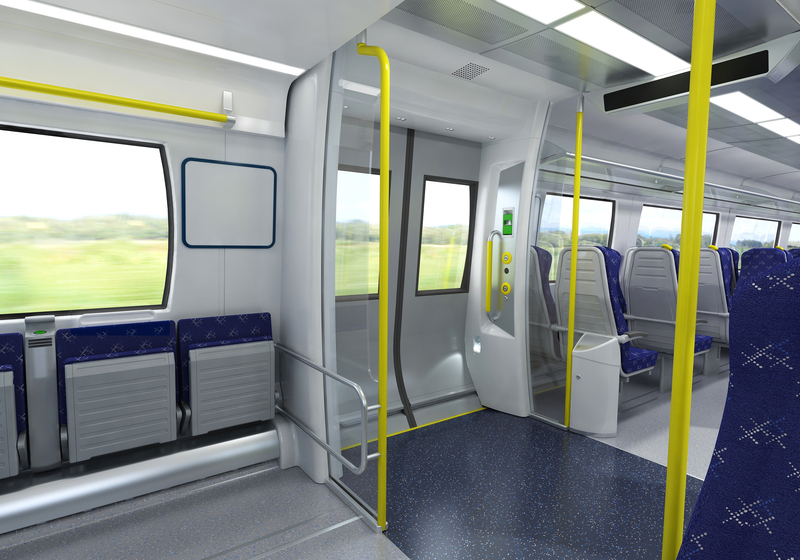 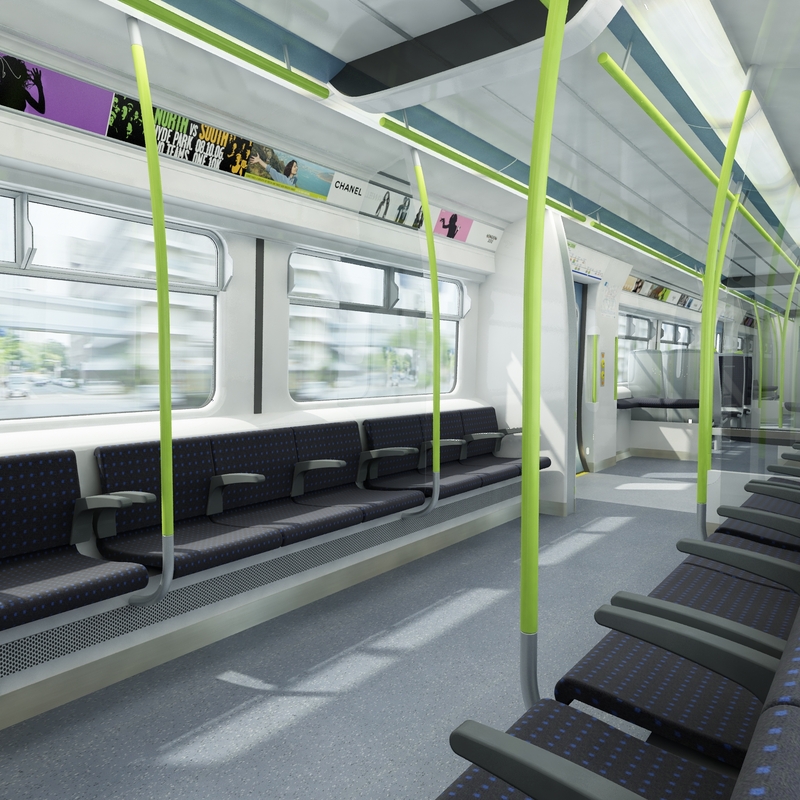 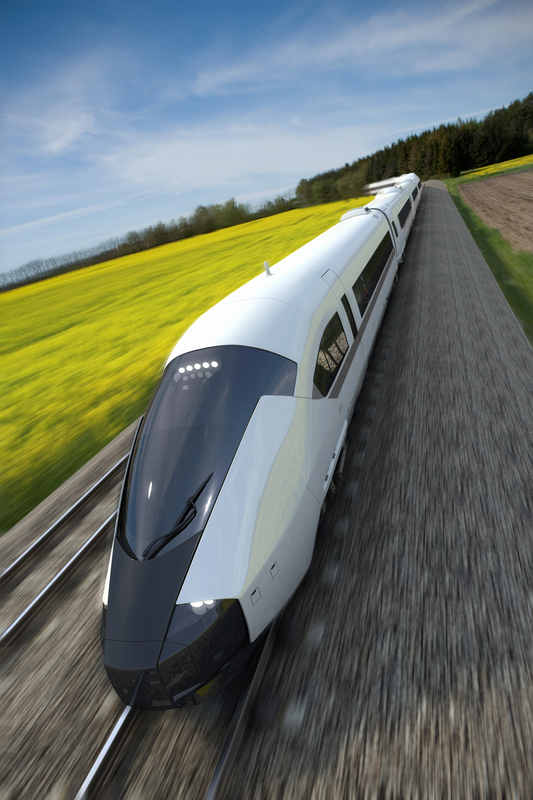 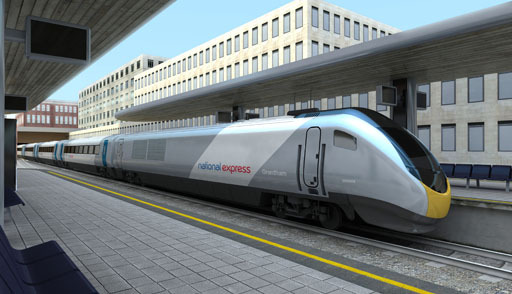 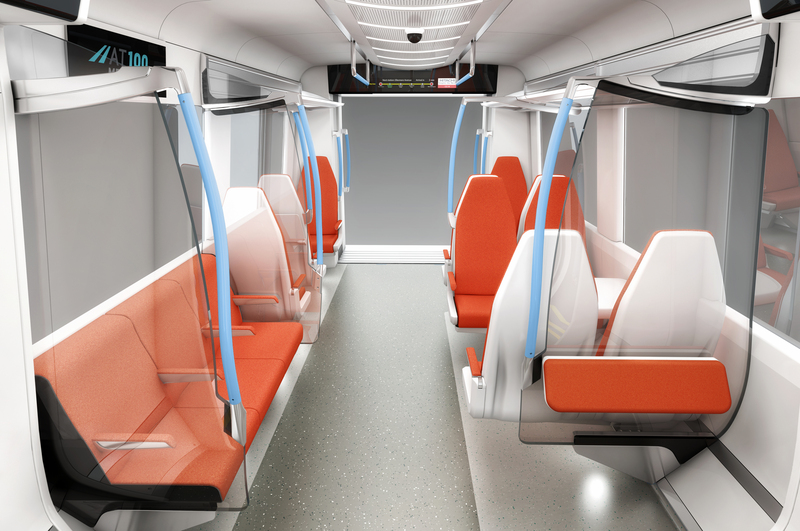 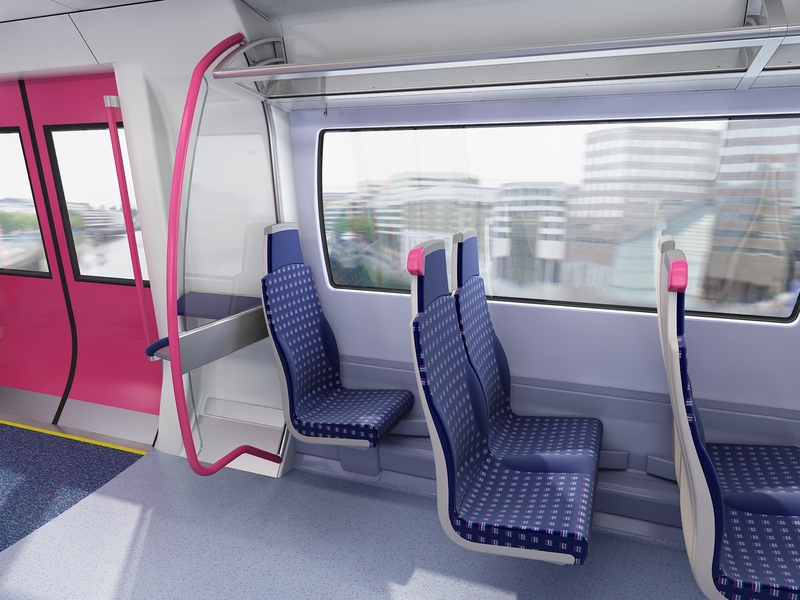 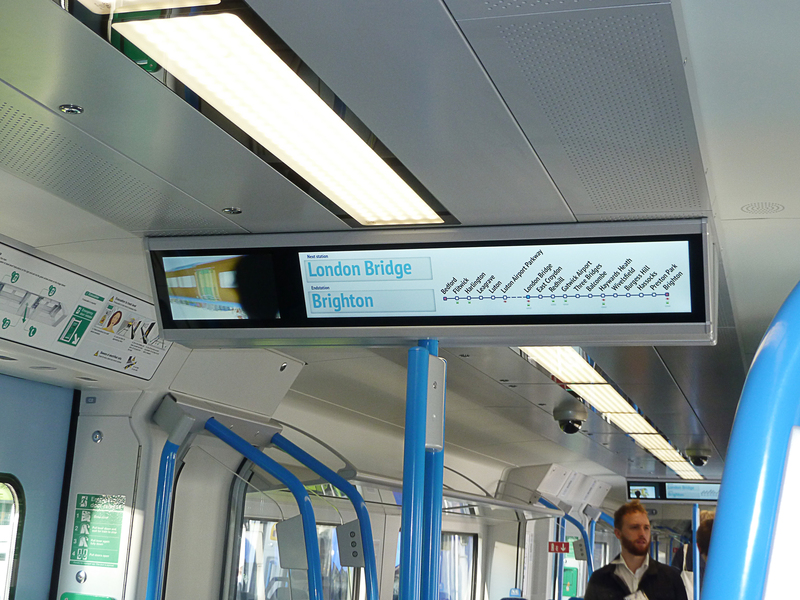 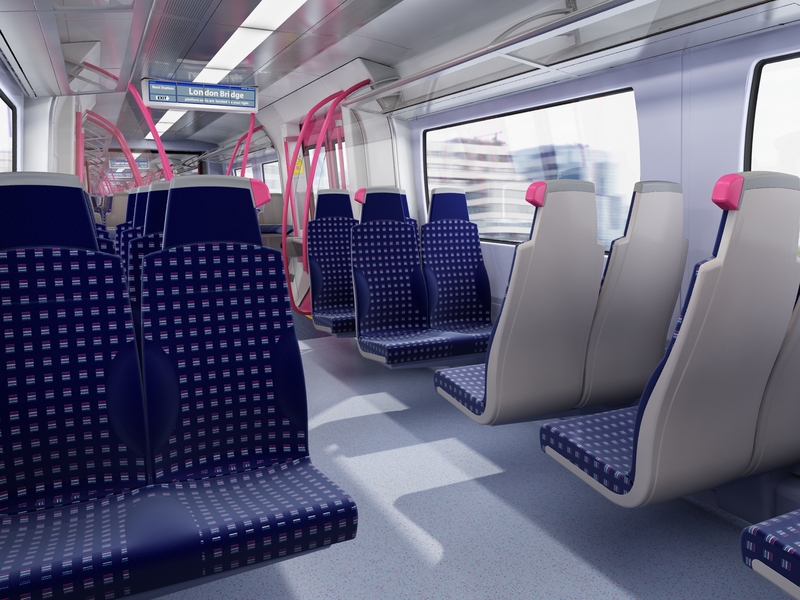 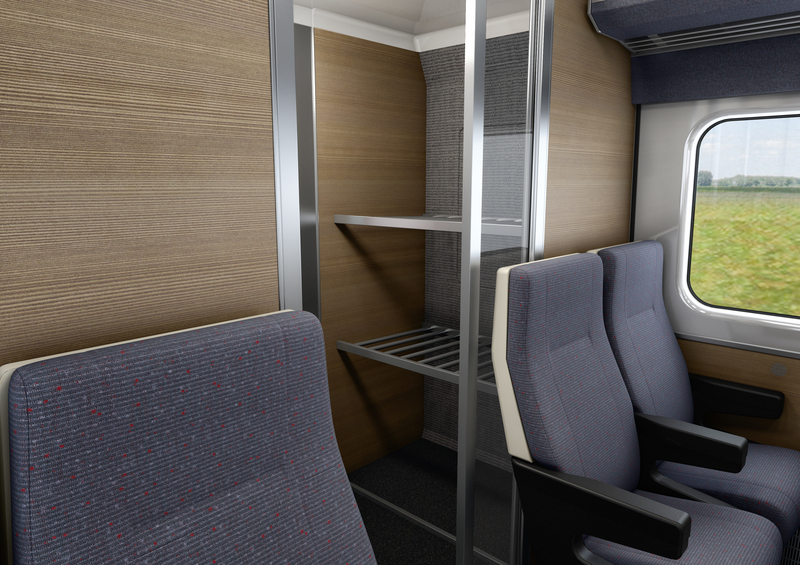 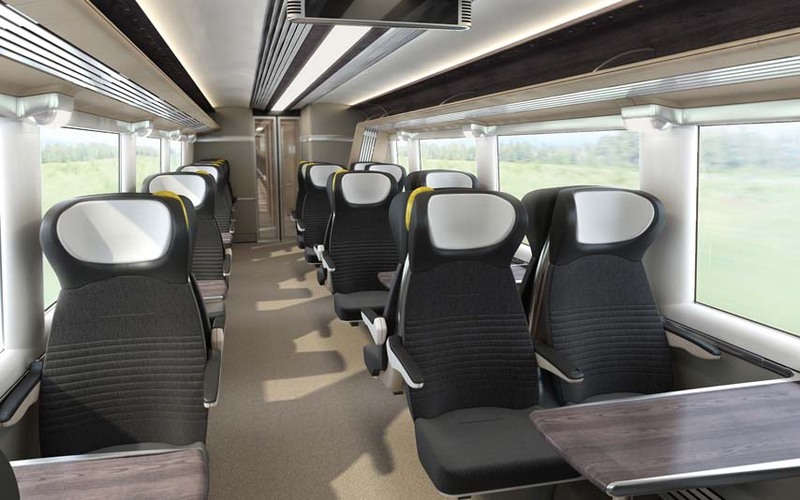 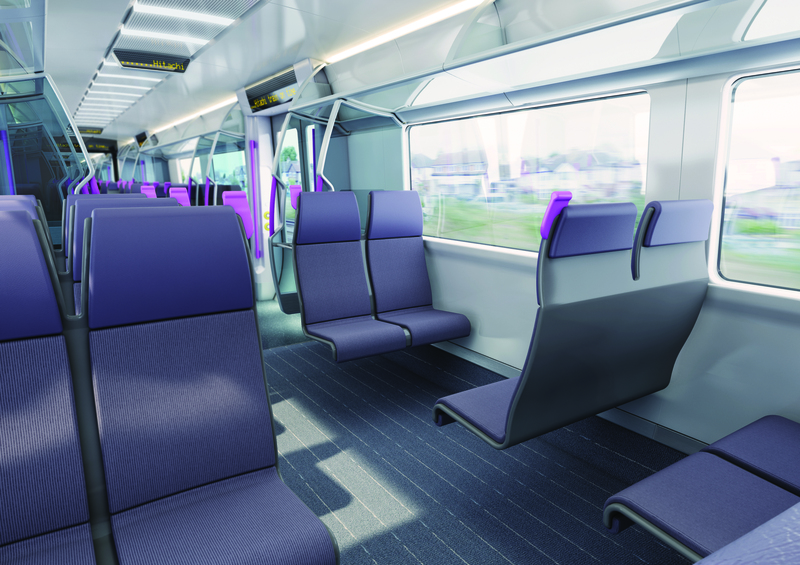 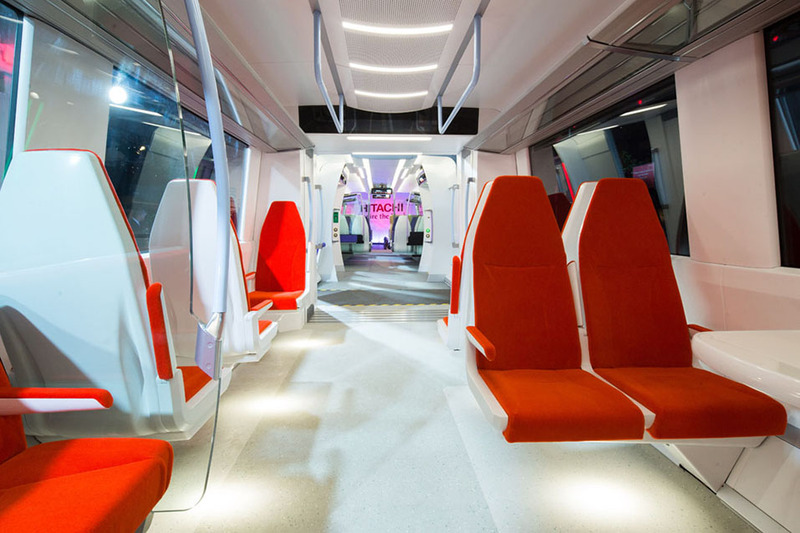 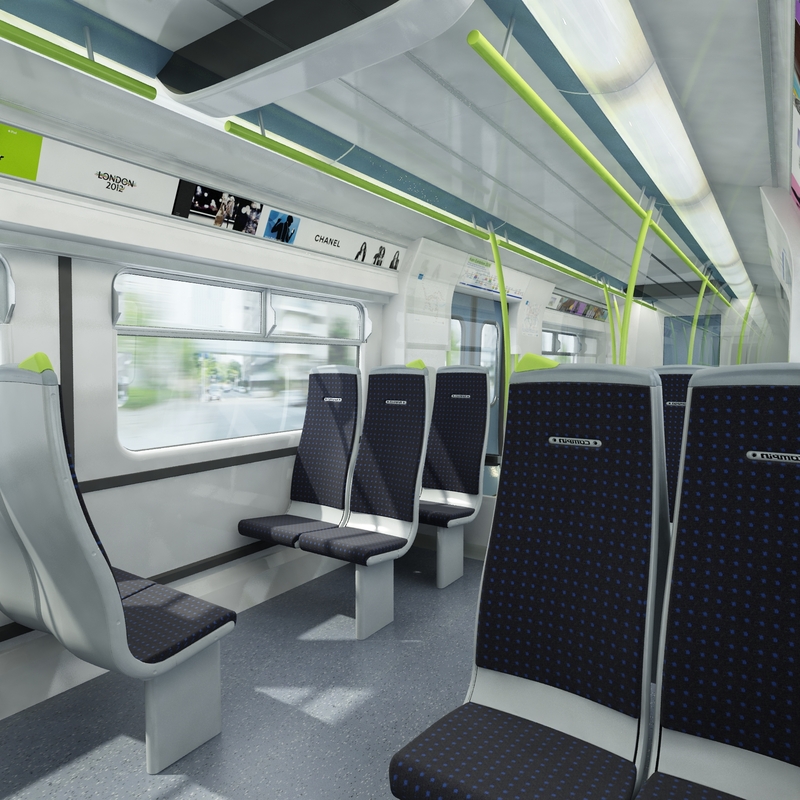 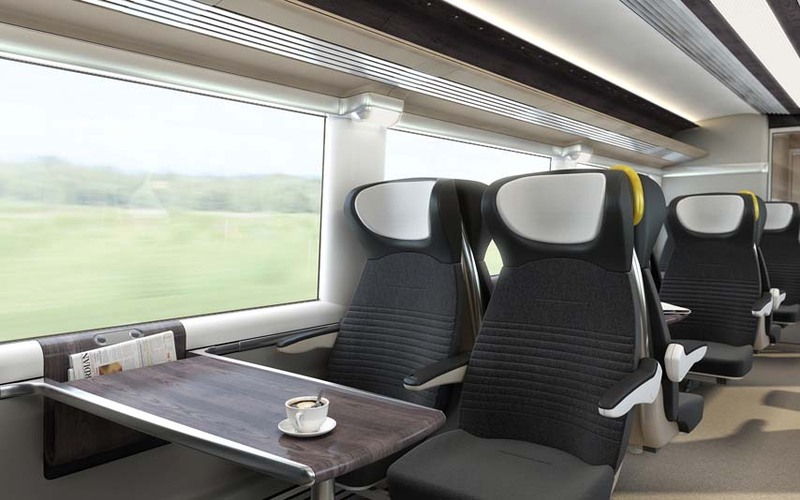 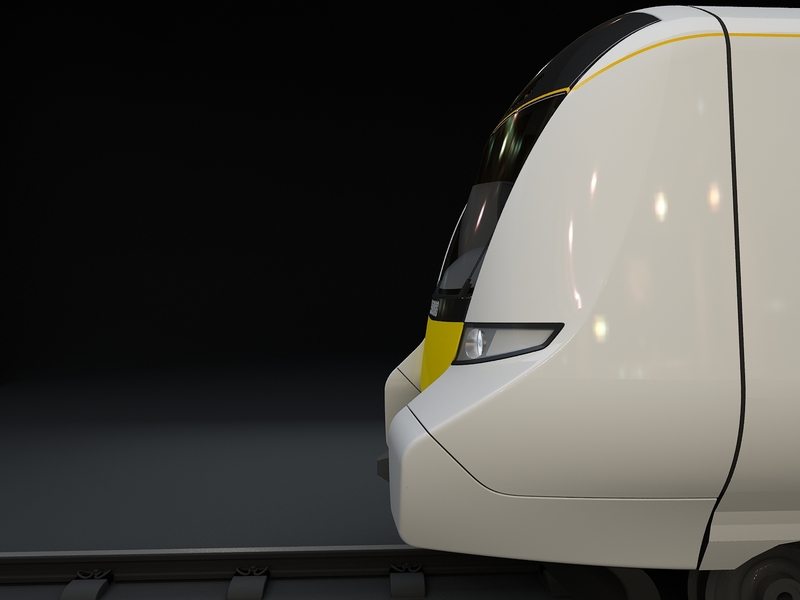 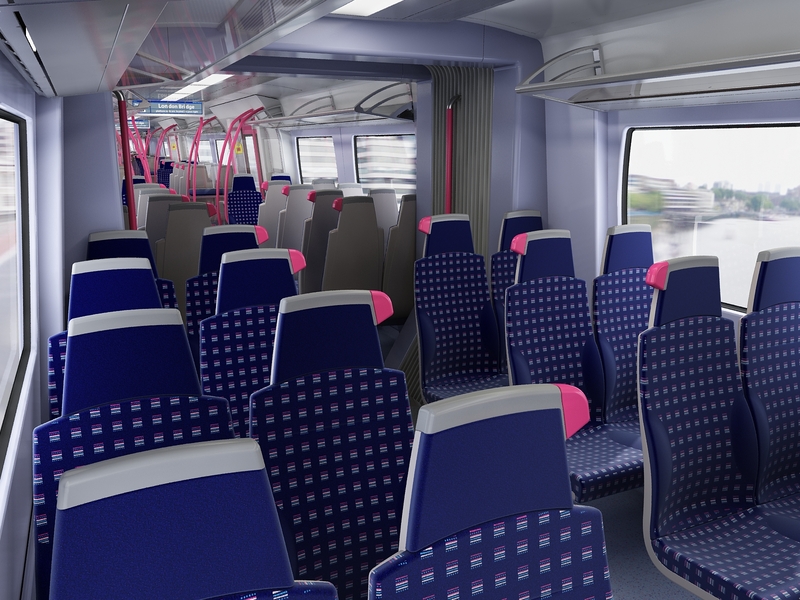 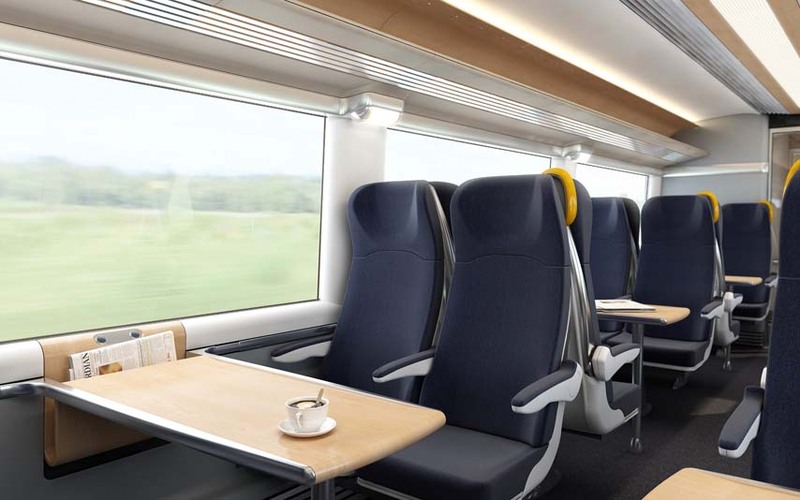 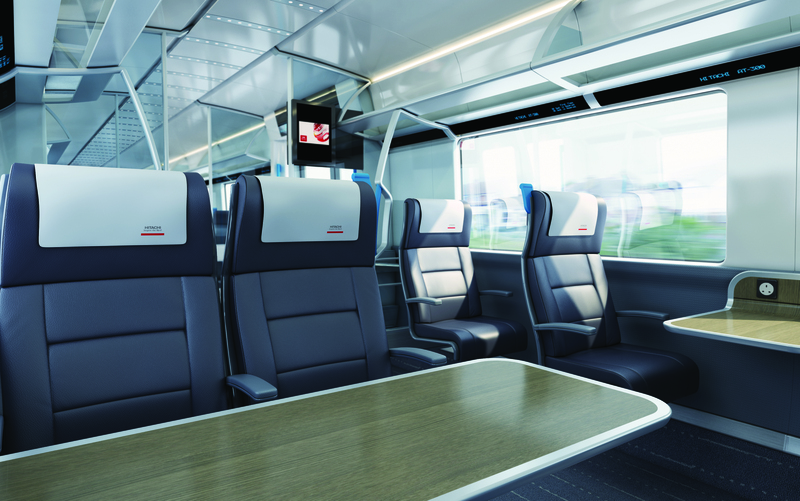 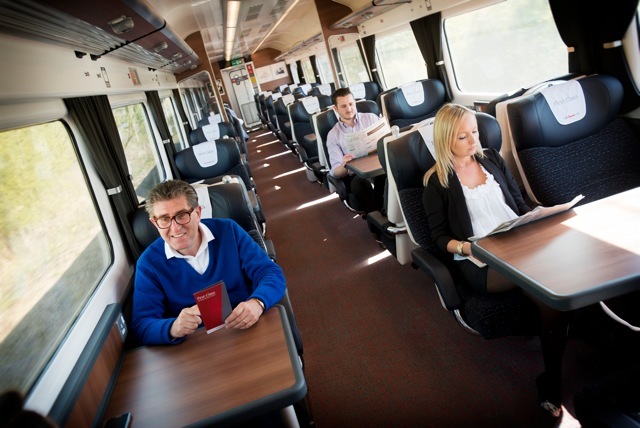 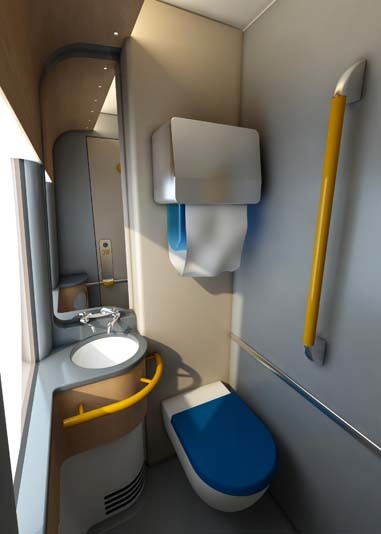 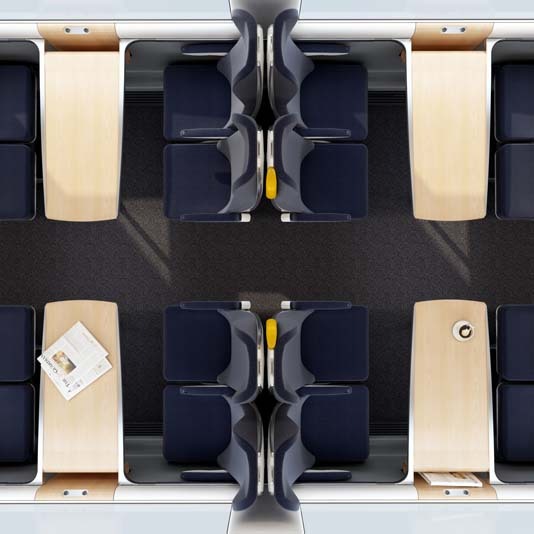 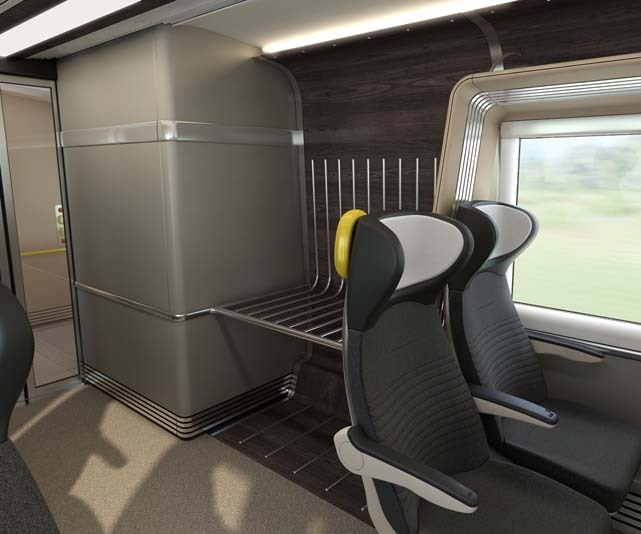 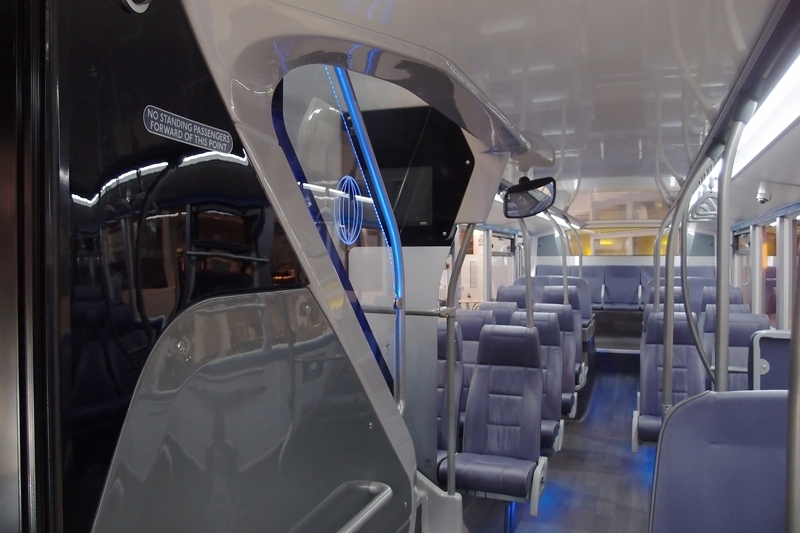 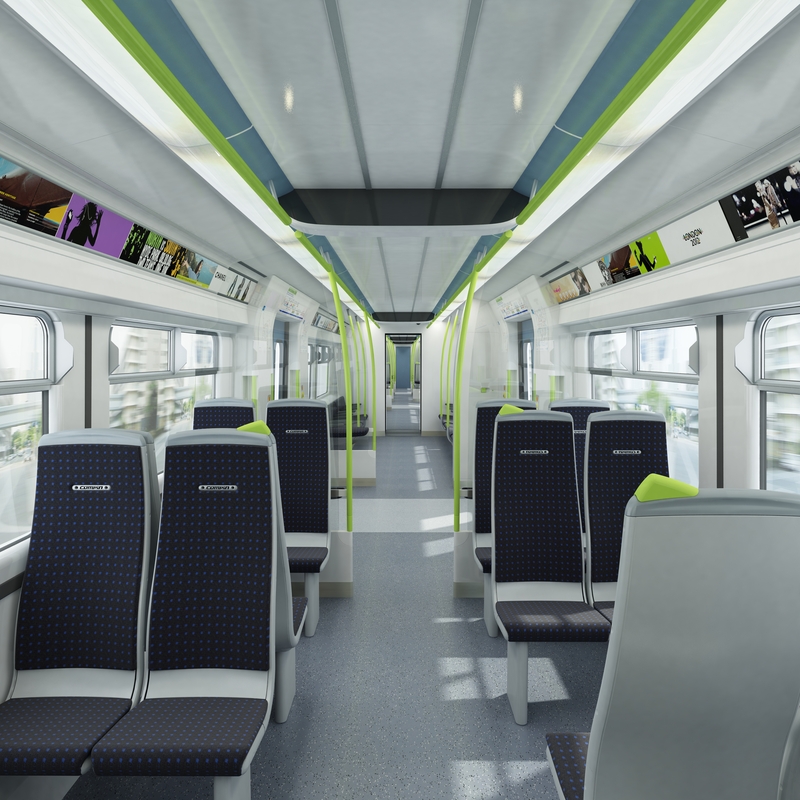 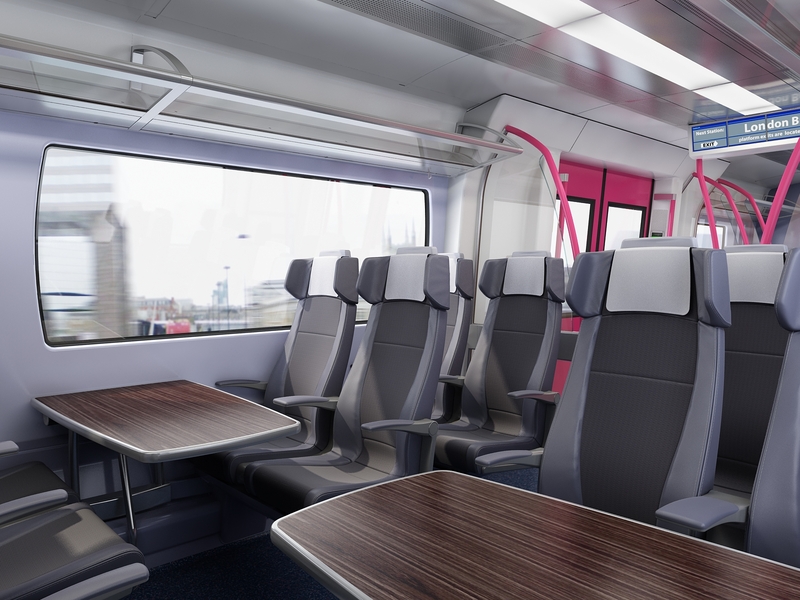 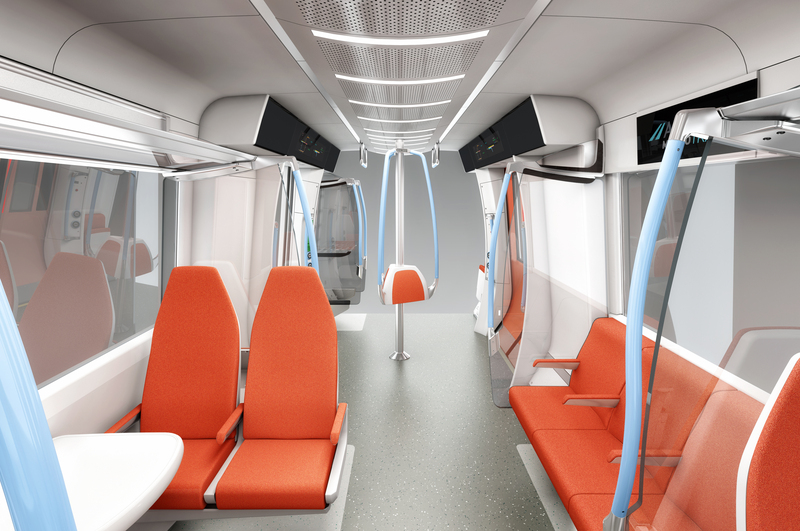 A range of three concept interiors including regional, metro and intercity modules for the UK. 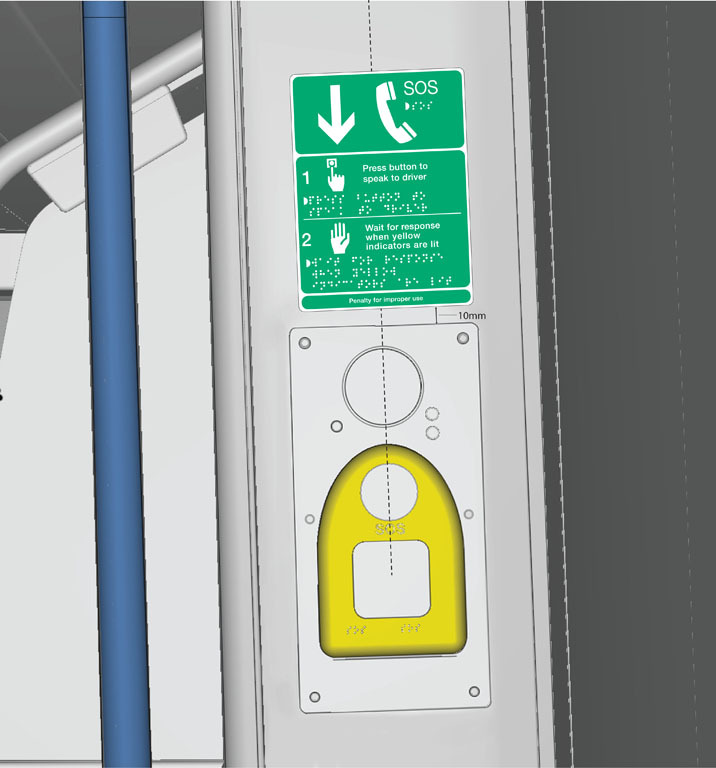 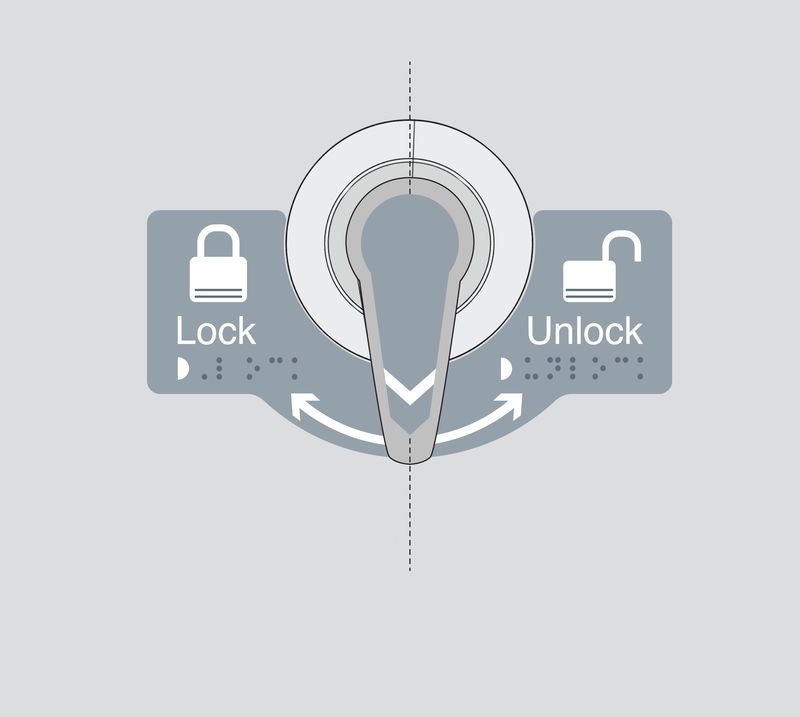 Designed with consideration to the differing operational requirements. 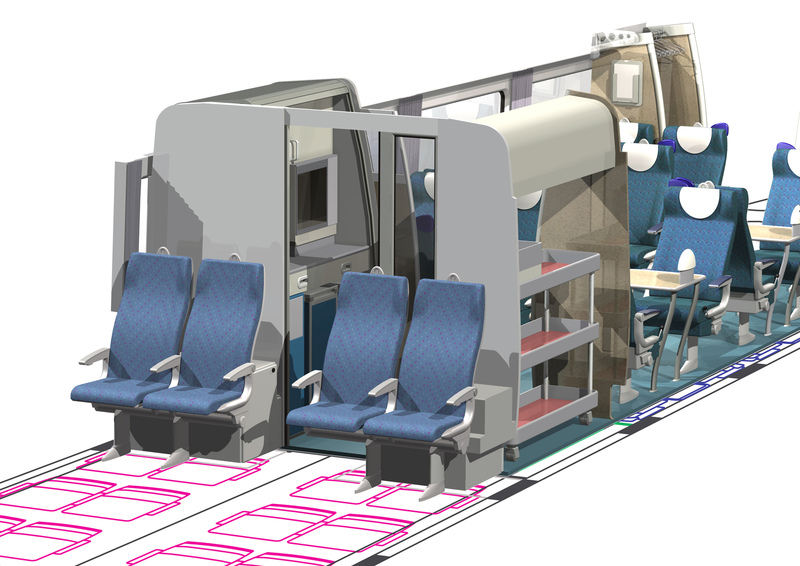 With consideration to interior layout, human factors, equipment, rationalisation, passenger information displays and TSI technical requirements. 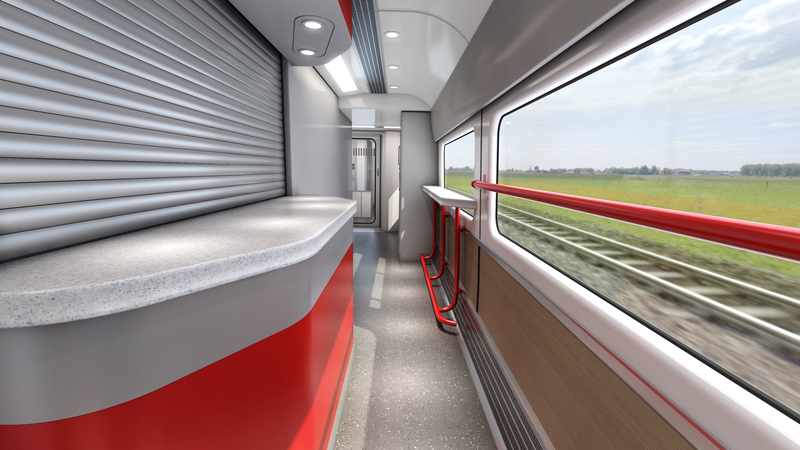 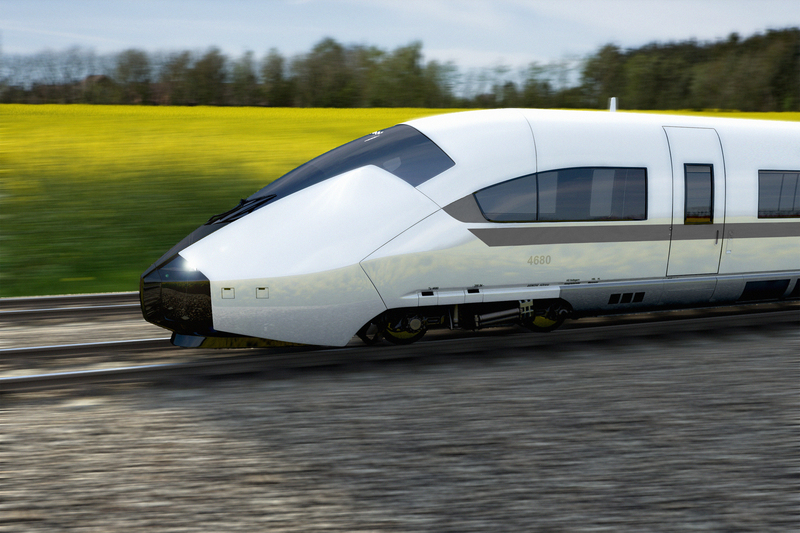 A high speed train concept designed to exploit a character appropriate for central European aesthetic values. 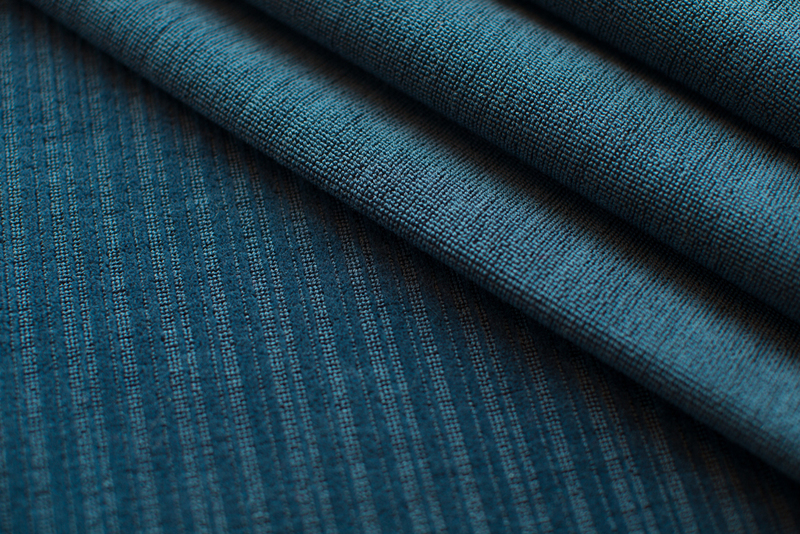 The design language reinforces the sensation of strength and durability combined with a fluid, organic form. 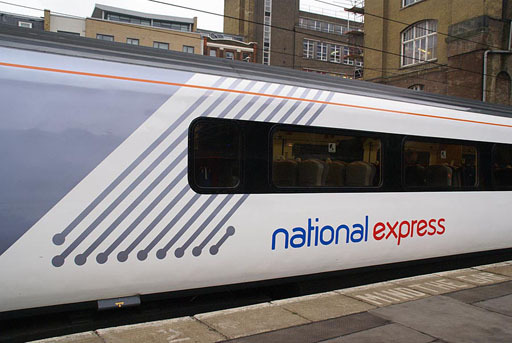 Working directly with the National Express Group and CHI & Partners, Schoenemann Design, having specialist experience and knowledge passenger rail vehicle design was commissioned to support the creative development of interior branding to ensure a successful integration with technical compliance, and implementation. 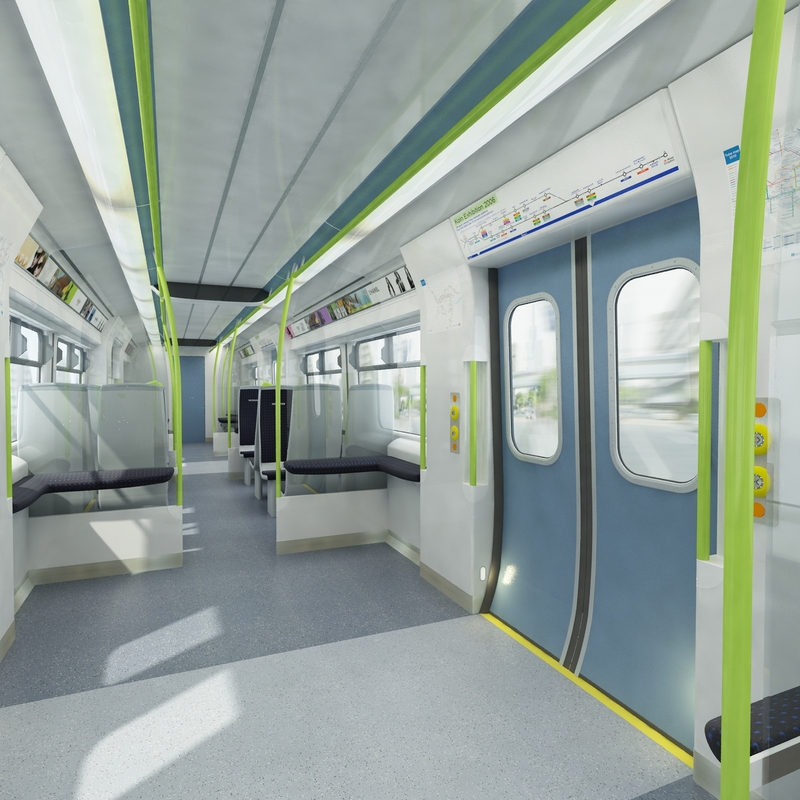 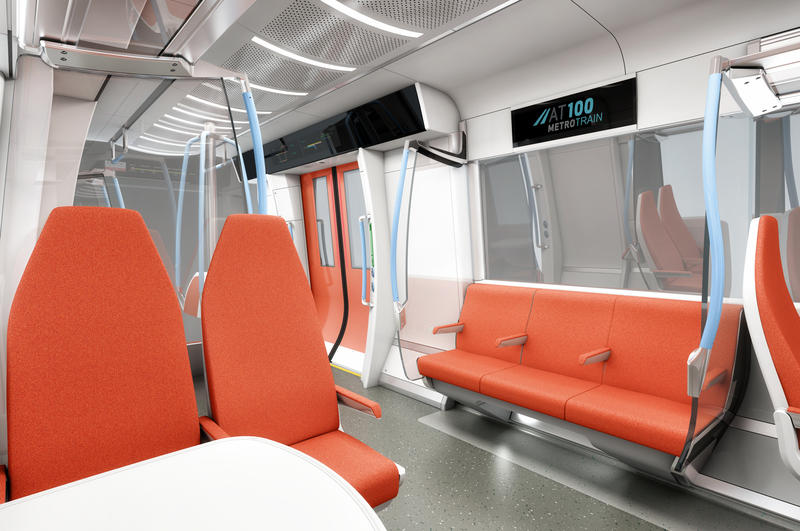 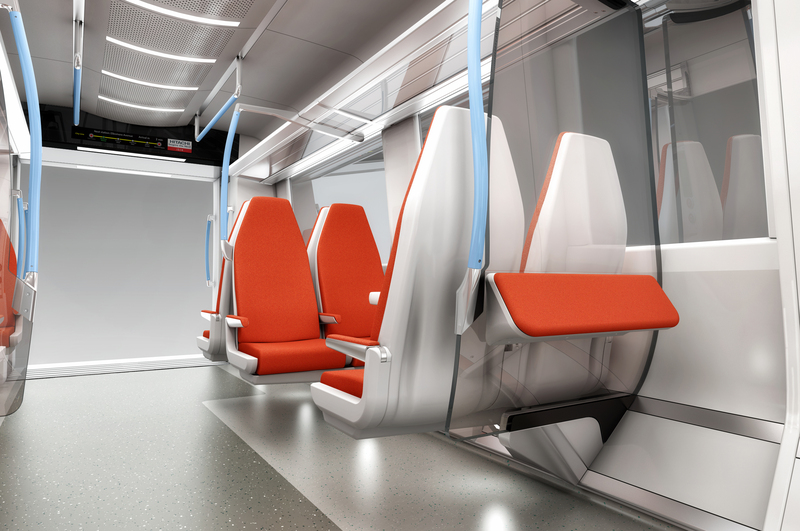 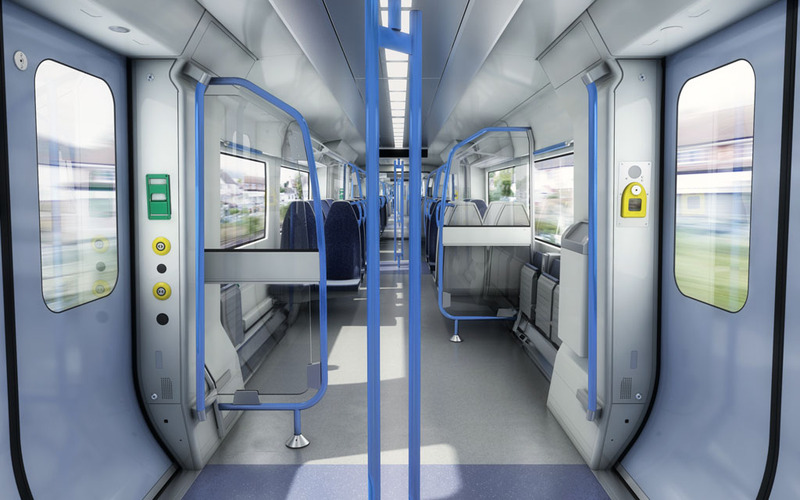 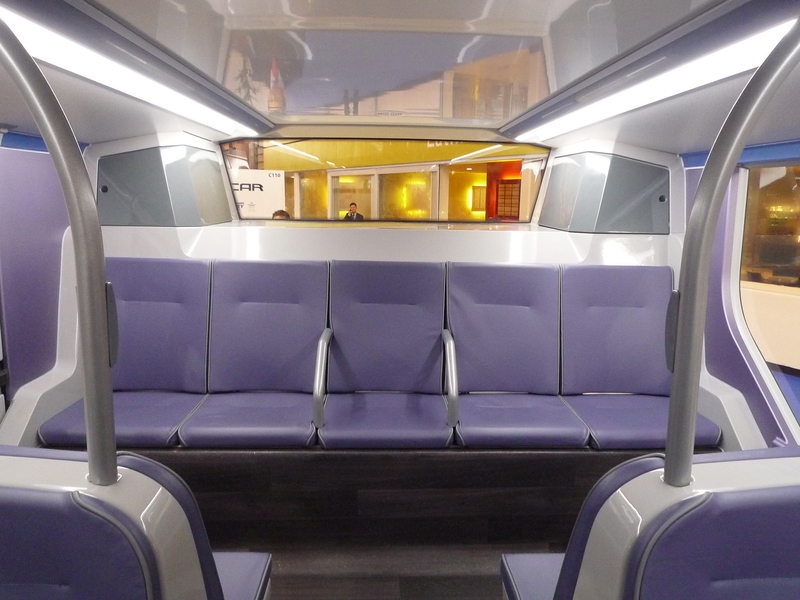 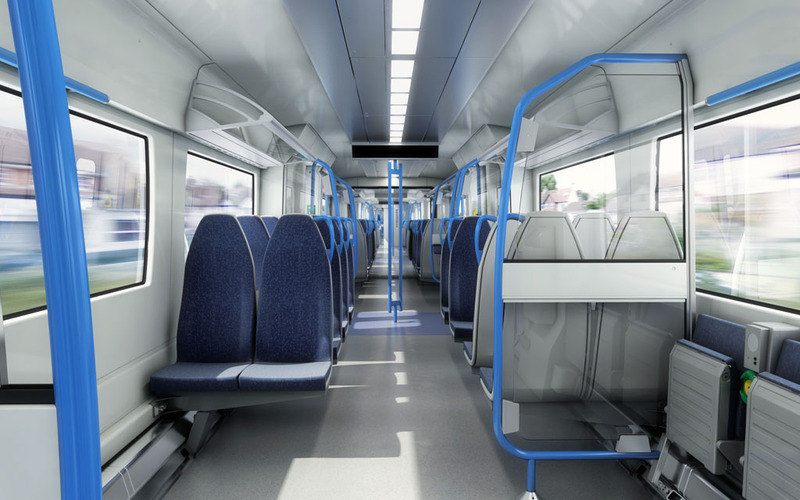 In support of NX’s franchise bid for London Overground services Schoenemann Design were commissioned to create a metro interior that considered passenger ingress and egress, a high standing to seated ratio, and implications to vehicles performance. 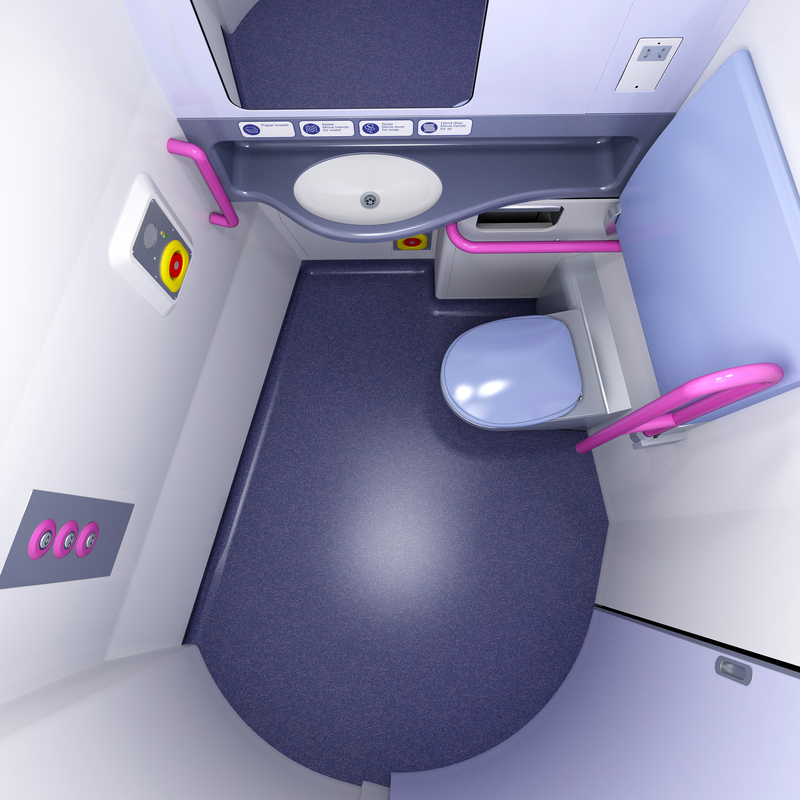 Interior design including design development, tooling and productionisation. 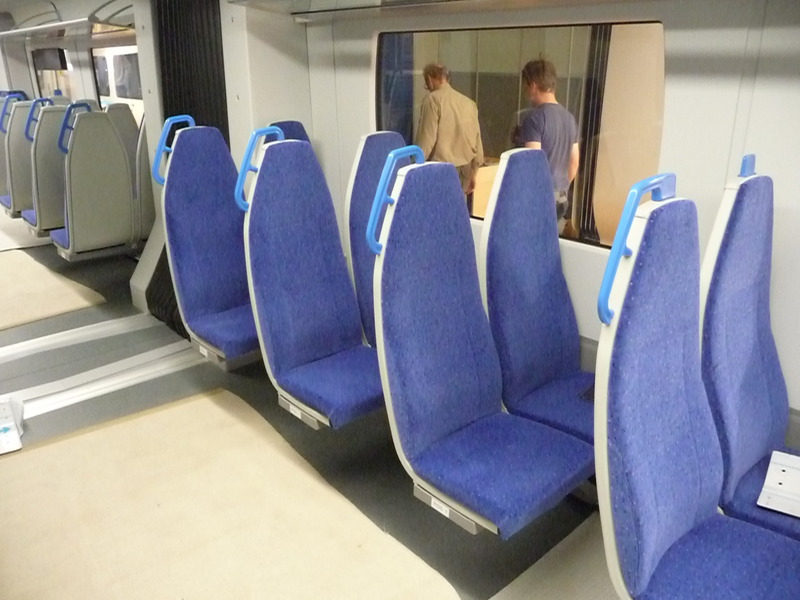 Particular involvement with floor type testing and the supply of production seats designed by Schoenemann Design. 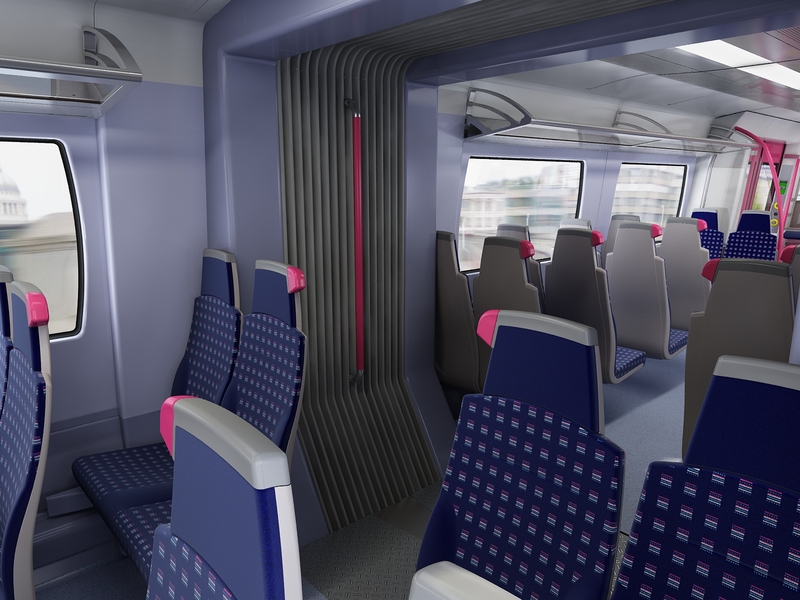 Mid life interior up-date which included the design of new ceiling system that incorporates indirect lighting, air ducting and grab pole fixings. 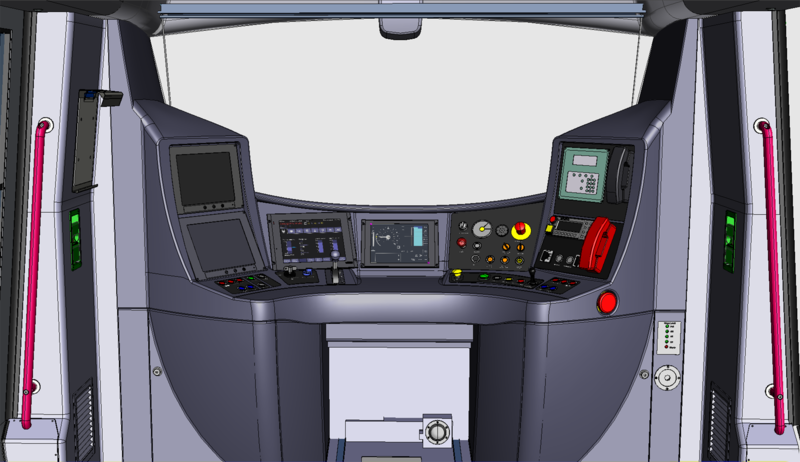 Our brief also included the design and tooling for the drivers module and cross front. 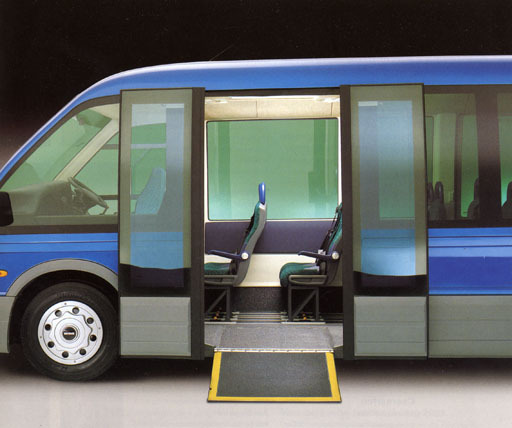 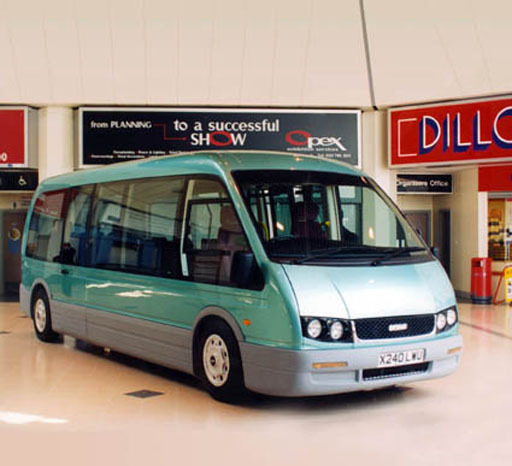 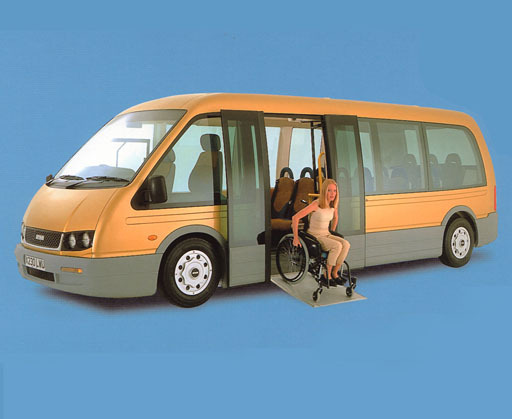 Optare have continued the development with this design on later vehicles, including Solo, Versa and Tempo. 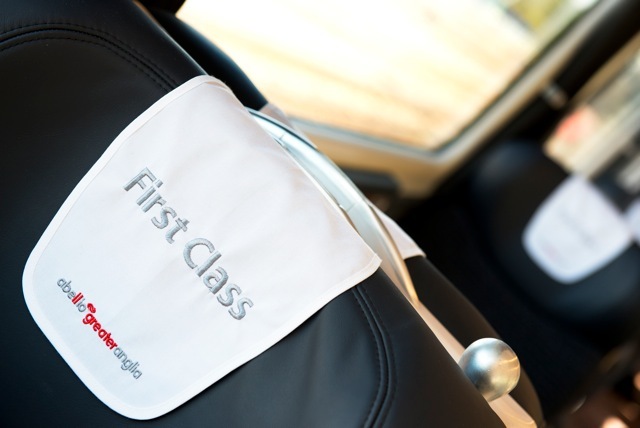 Business Class upgrade with at seat catering on Class 175 North/South service. 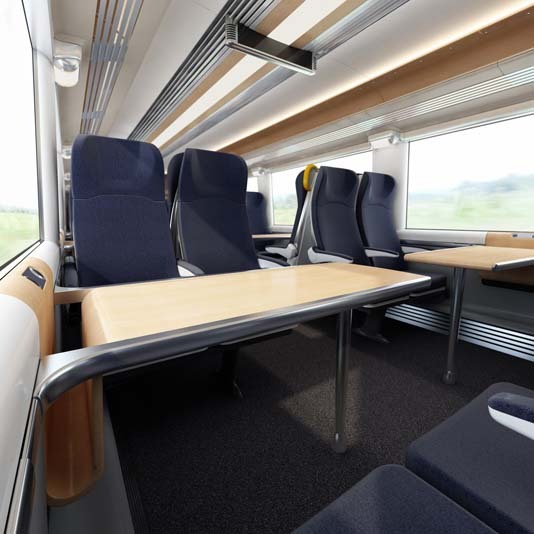 Work undertaken by Schoenemann Design included the installation of business class saloon with accompanying buffet area. 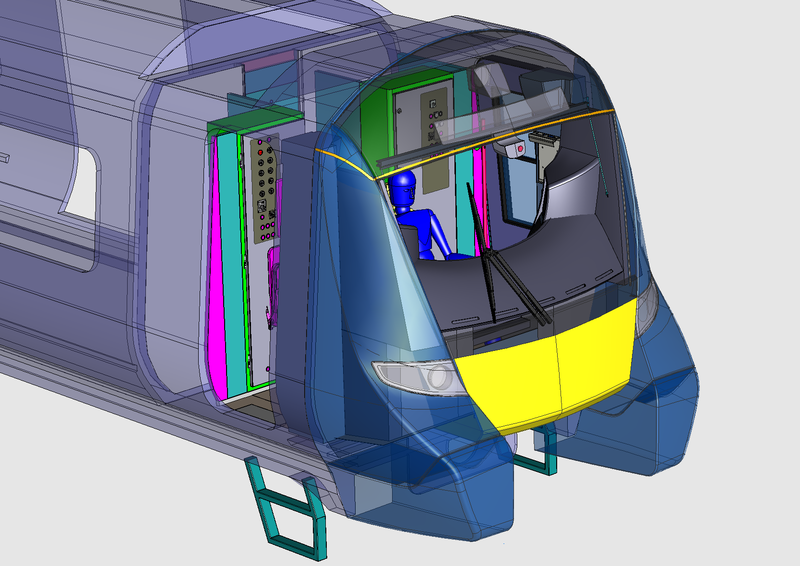 Schoenemann Design also undertook technical studies to prove viability for the business case.